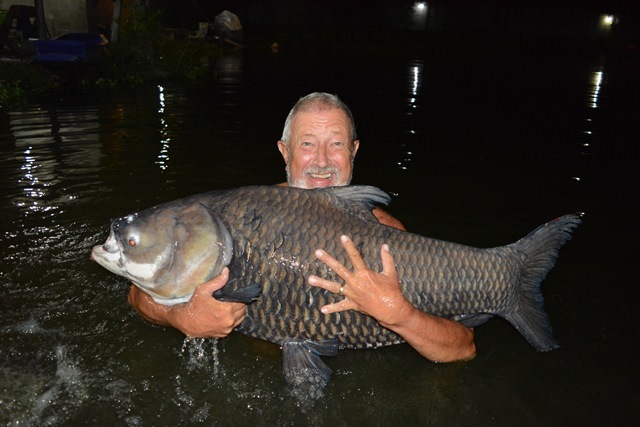 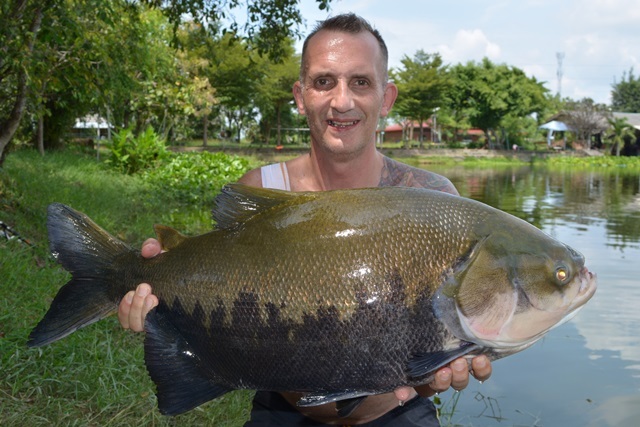 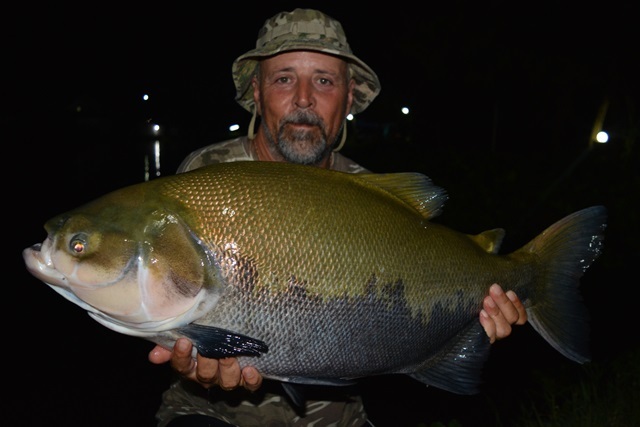 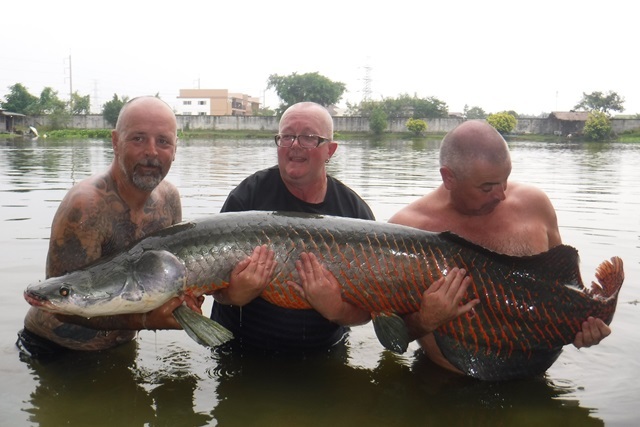 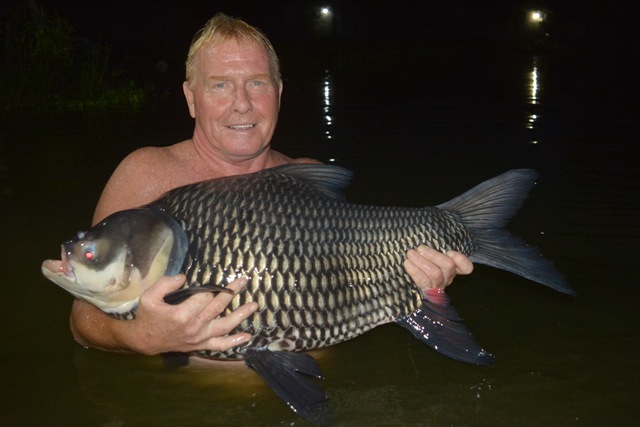 Well what can say about Dean Clark's first trip to Thailand apart form he beat his previous pb fish a carp of 26lb by 441lb with a more than awesome arapoima weighing in at 467lb and joining the Palm Tree Lagoon 400lb arapaima club in the process. 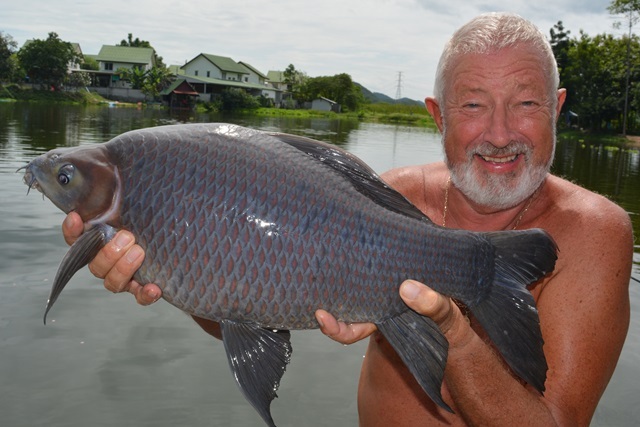 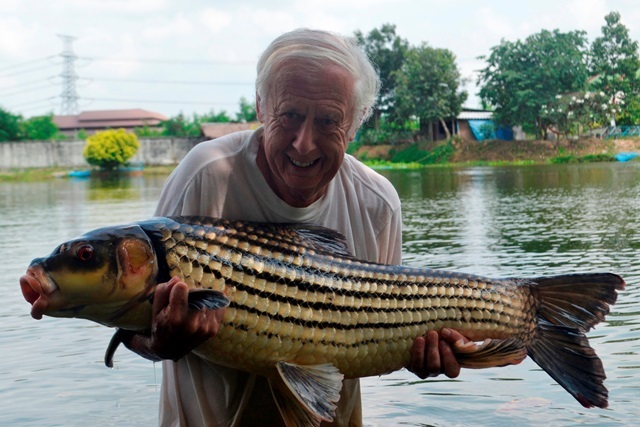 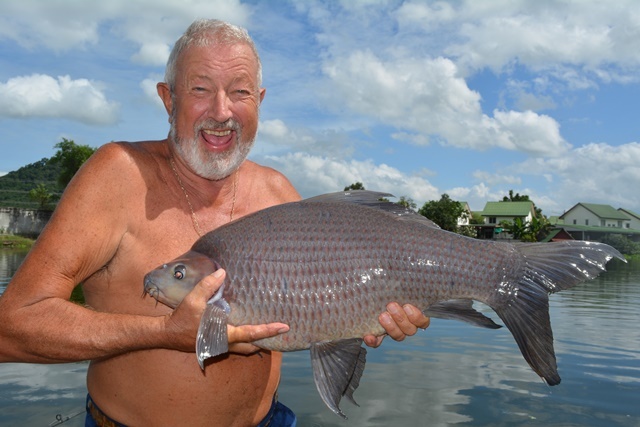 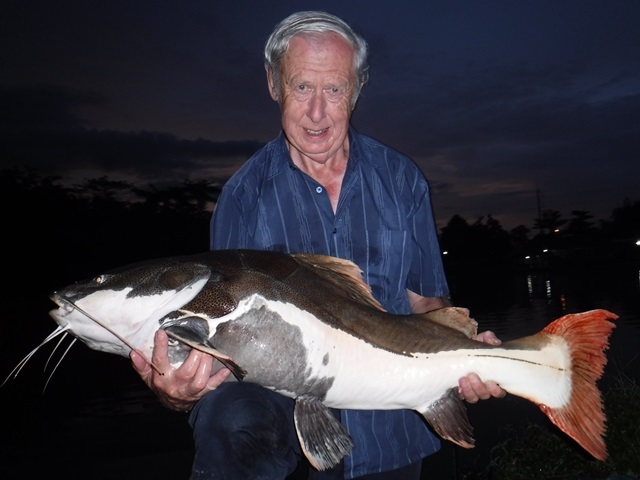 But he did not stop there as he went on to catch rarely caught wallago leeri and catla carp, Juliens golden price carp, tambaqui, black shark minnow, black ear catfish, Mekong catfish, Siamese carp, rohu, big-Y catfish, striped catfish, pacu, as well as both Amazon and Thai redtails. 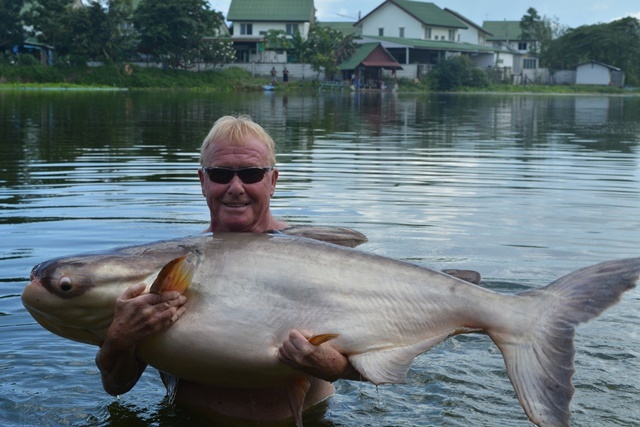 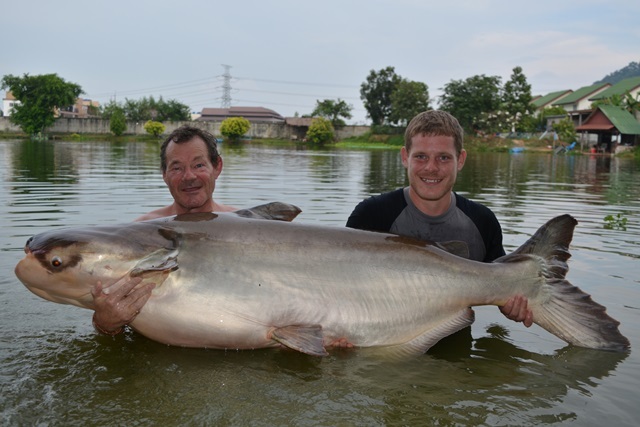 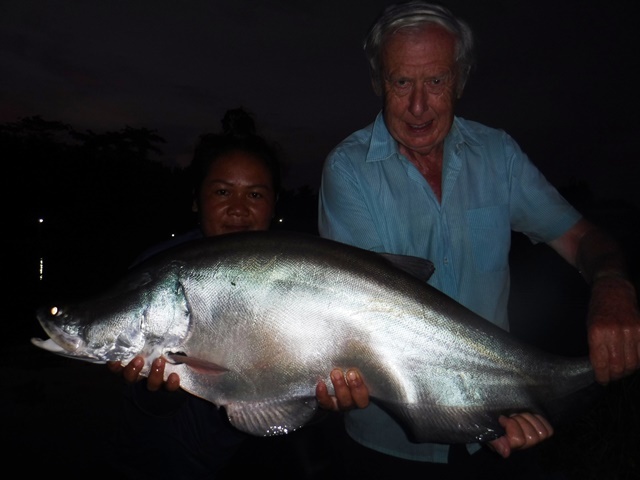 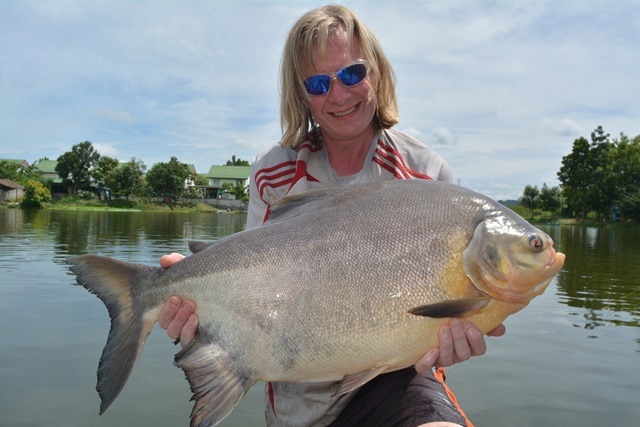 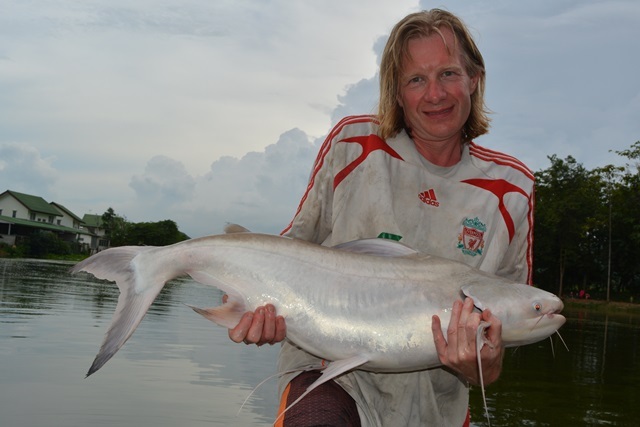 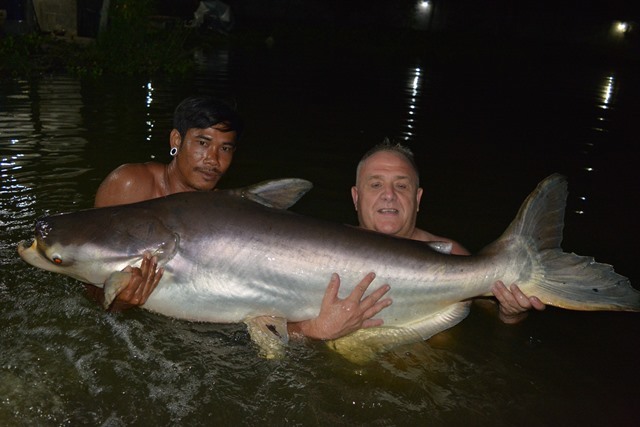 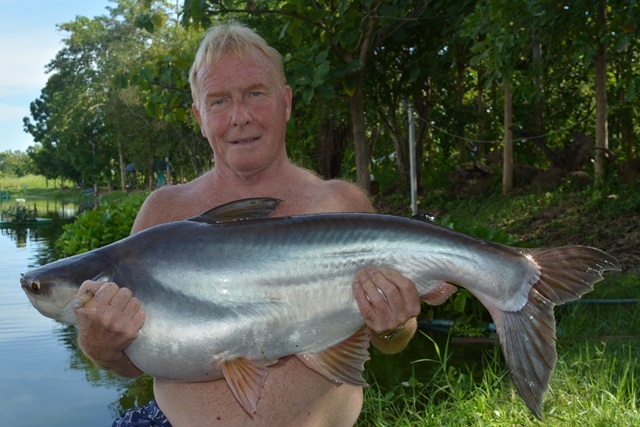 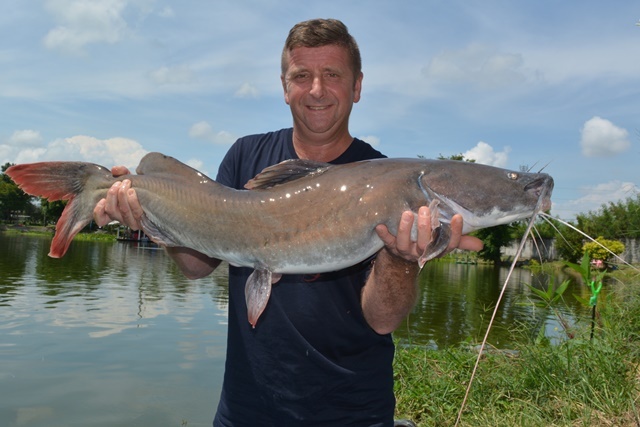 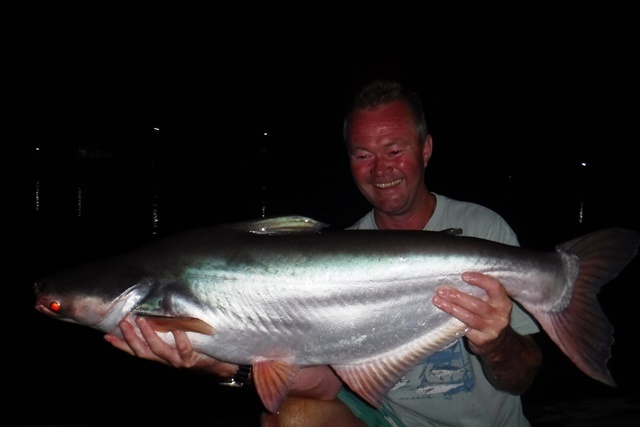 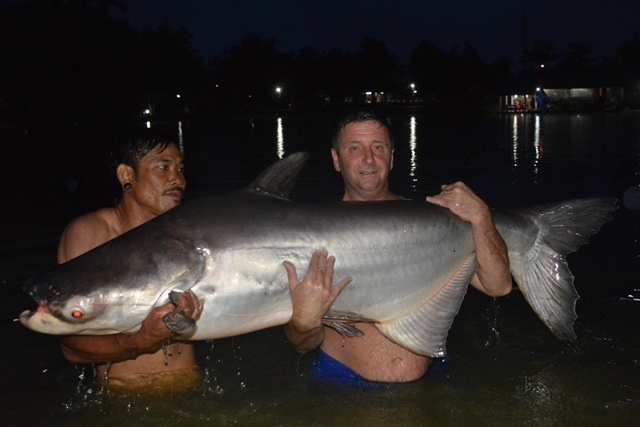 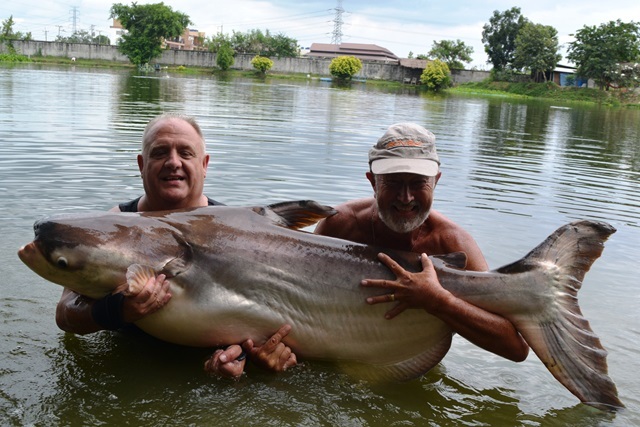 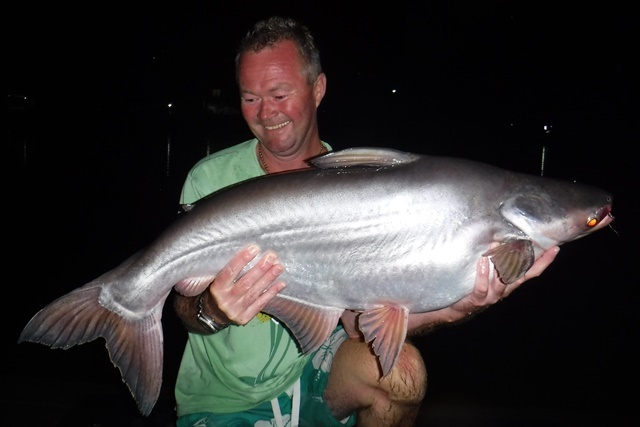 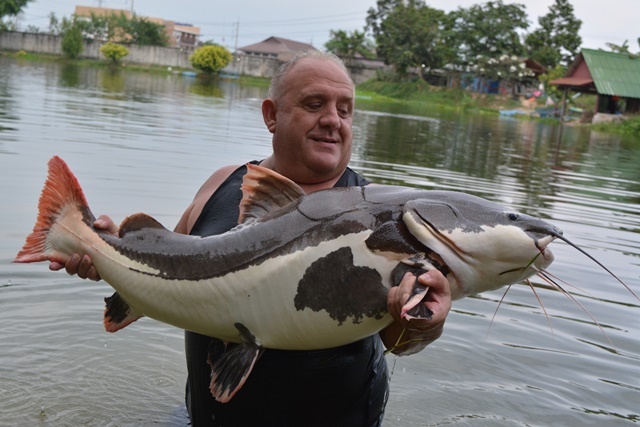 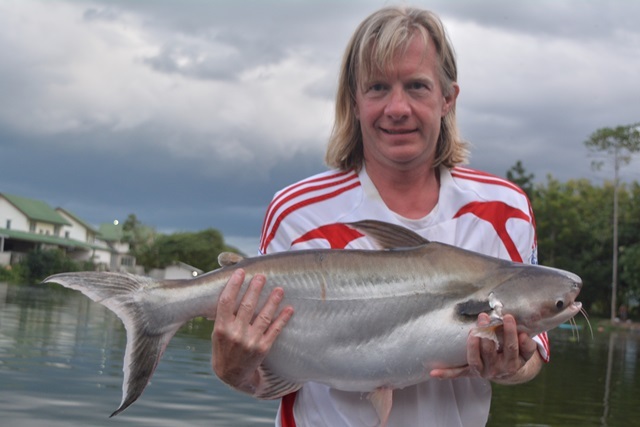 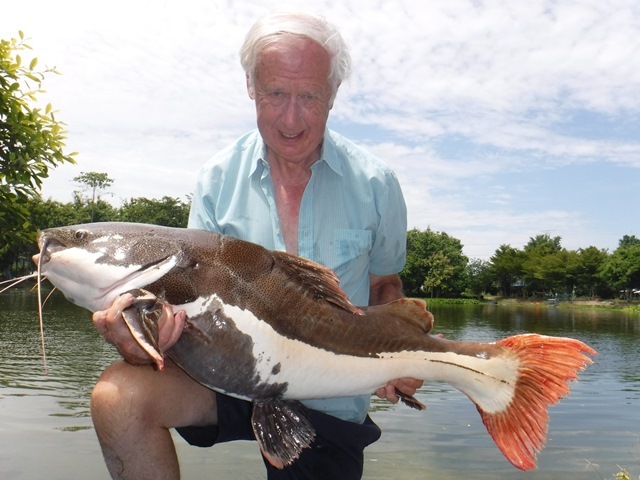 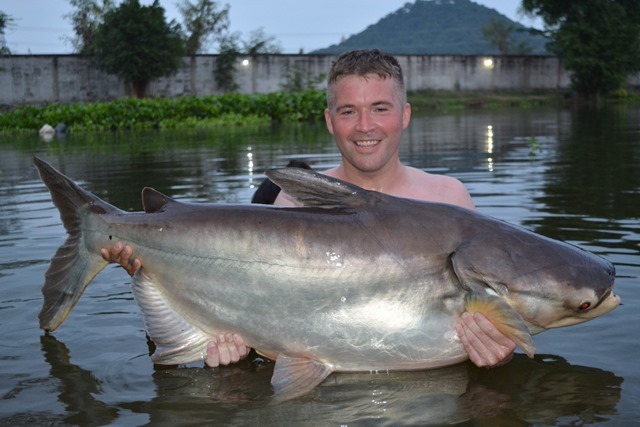 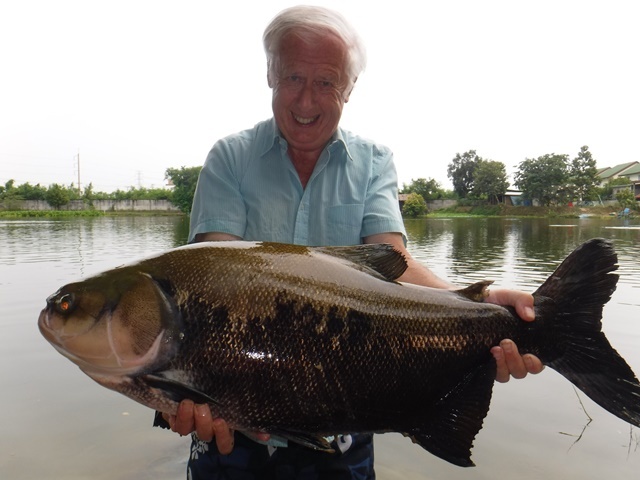 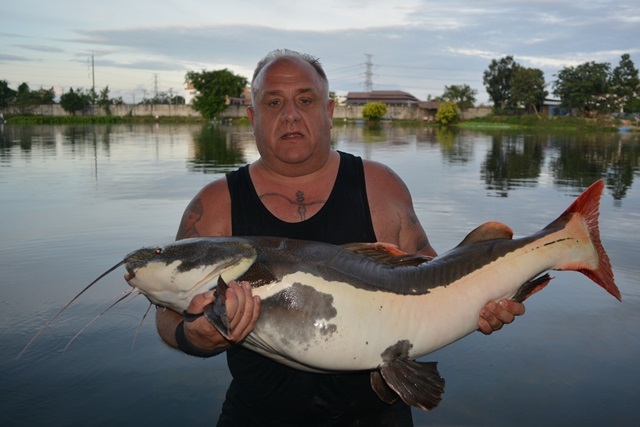 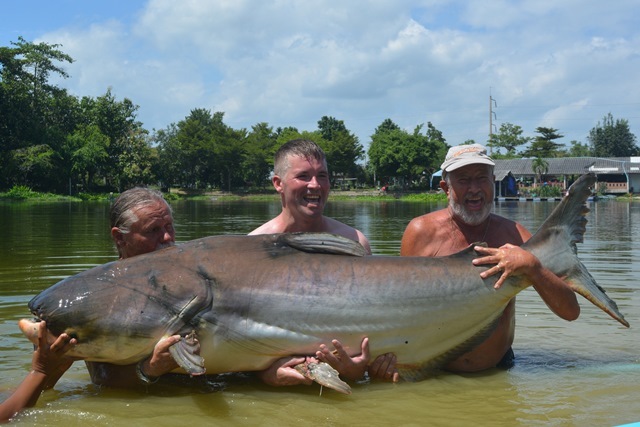 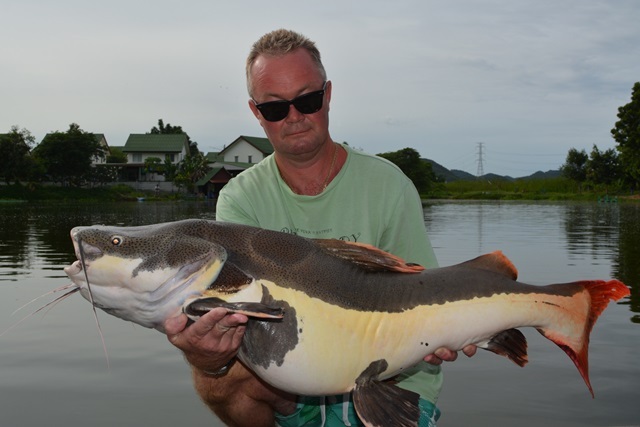 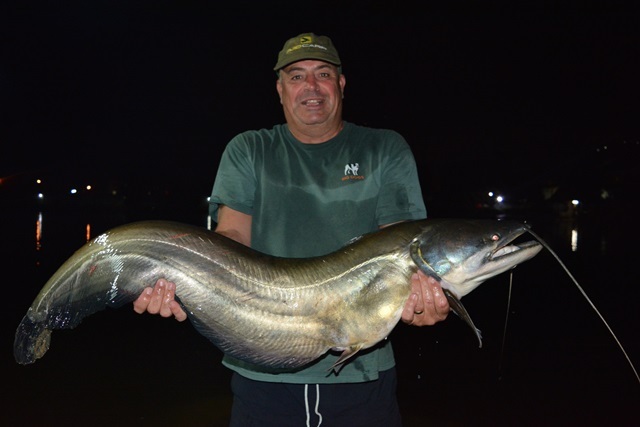 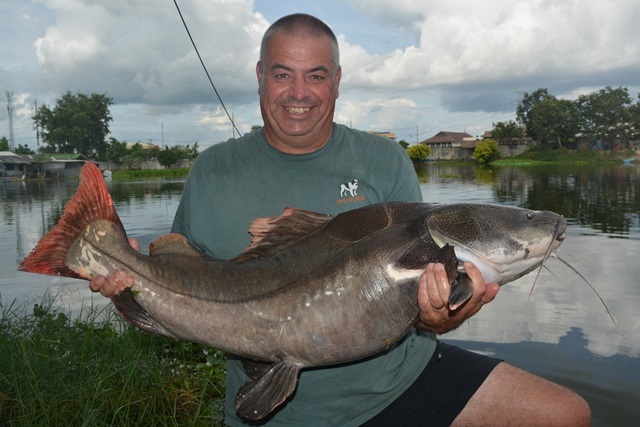 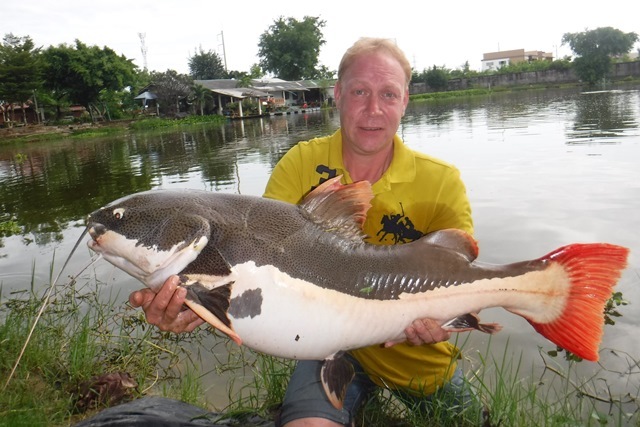 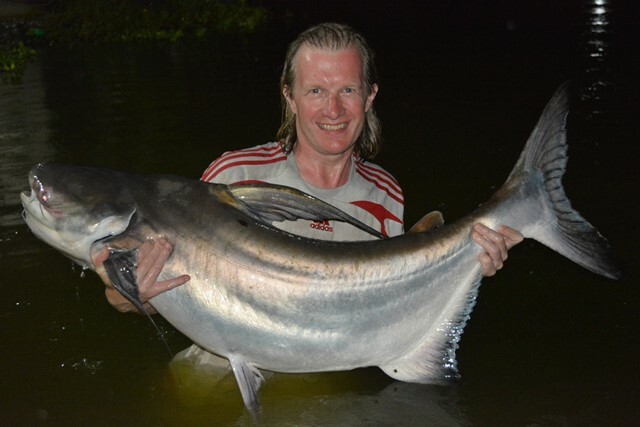 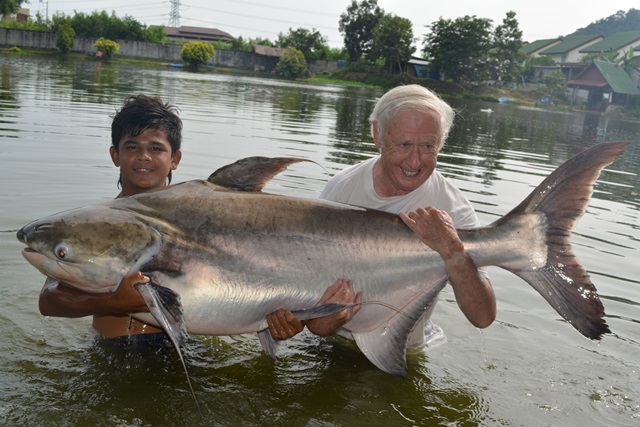 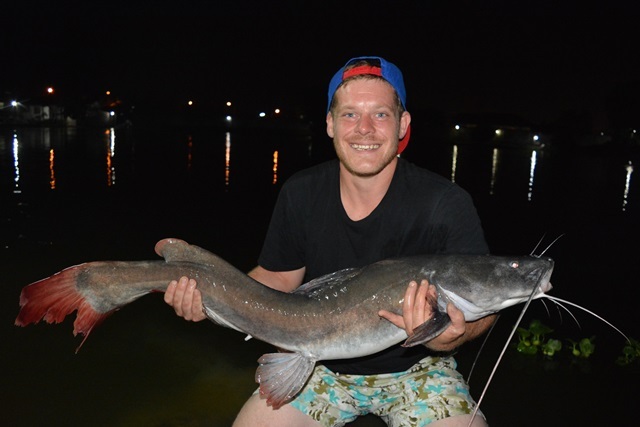 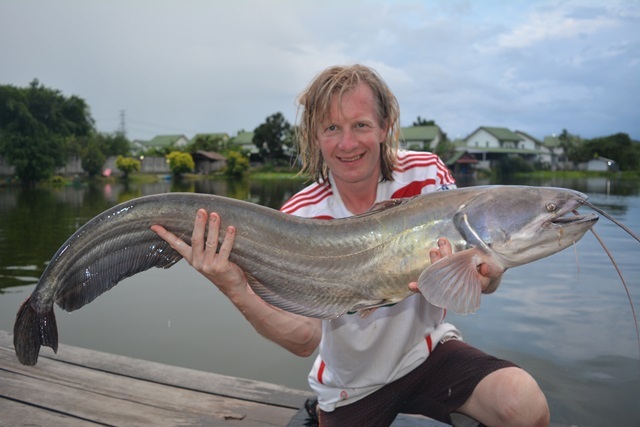 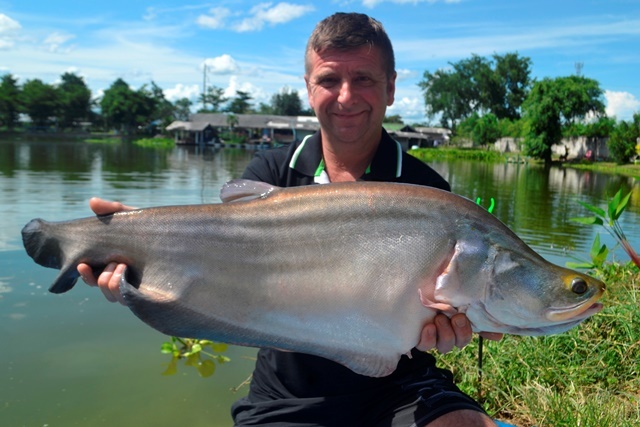 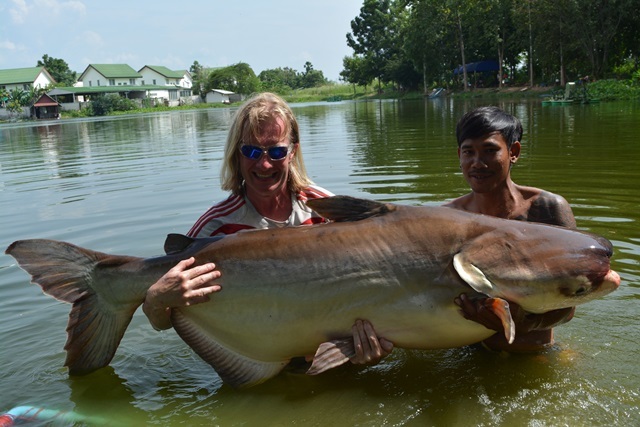 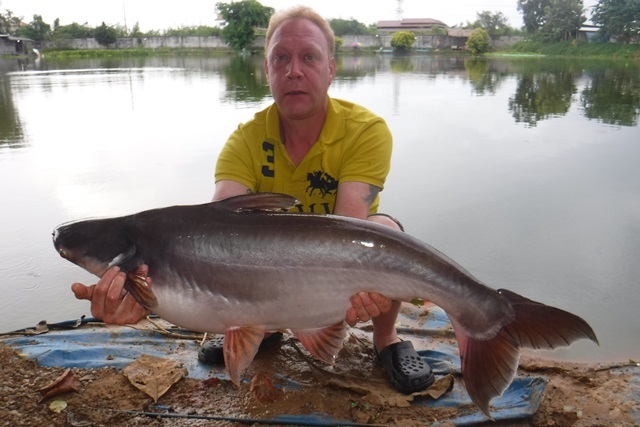 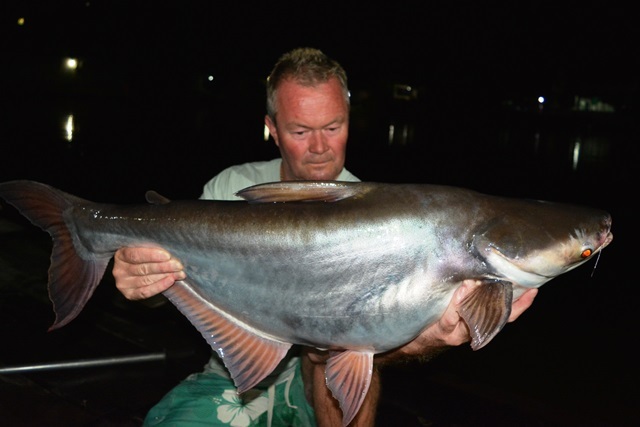 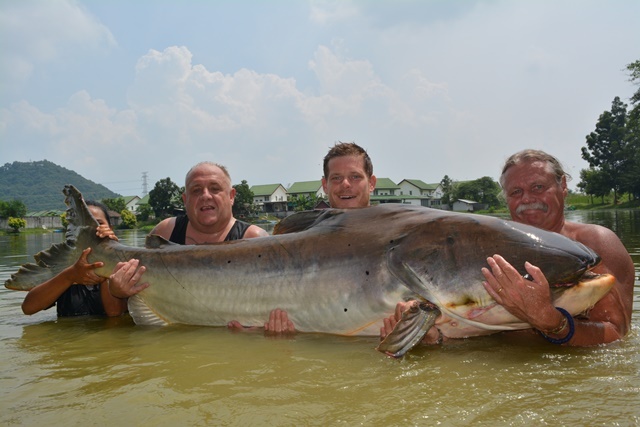 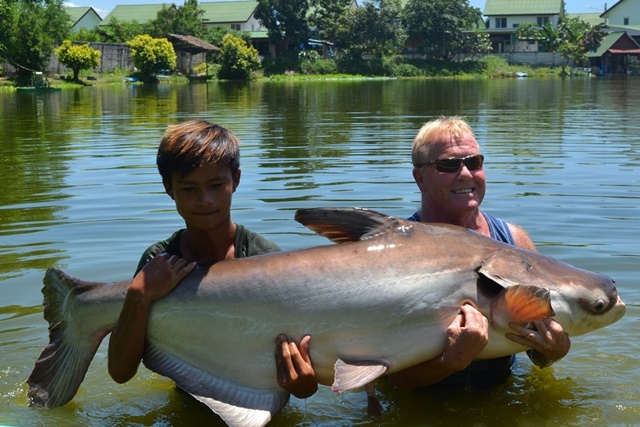 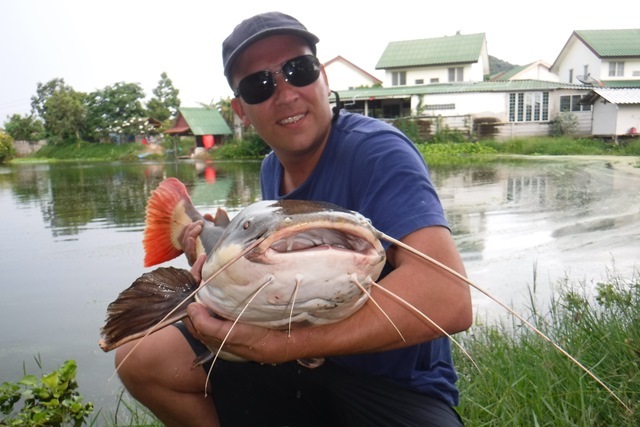 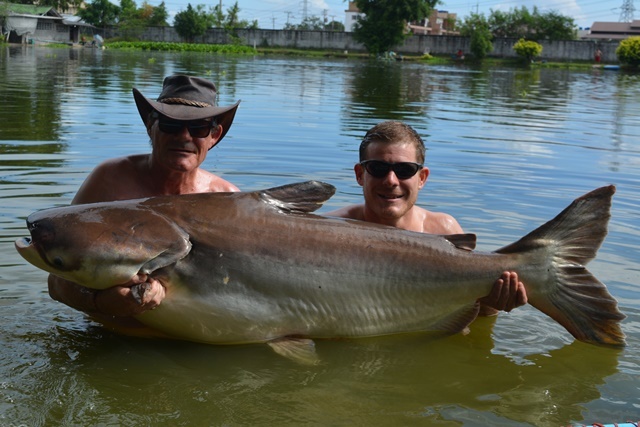 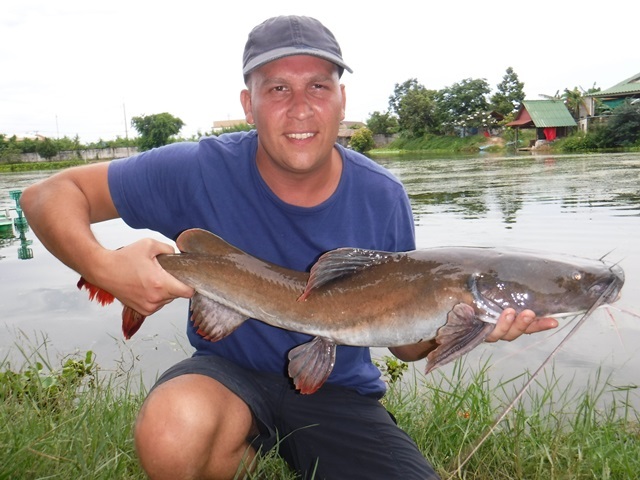 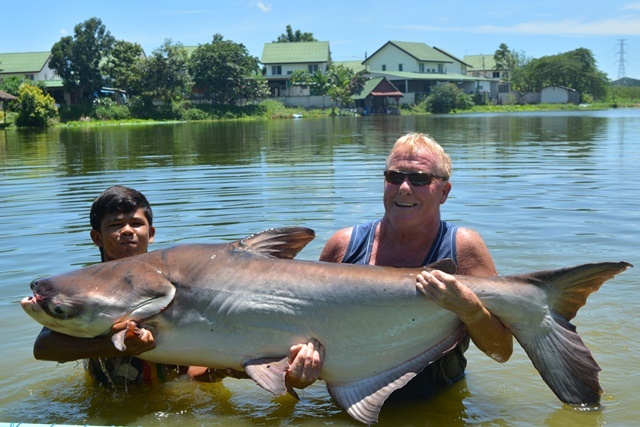 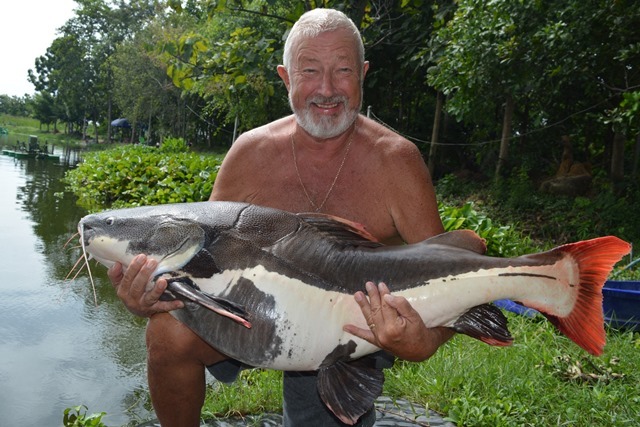 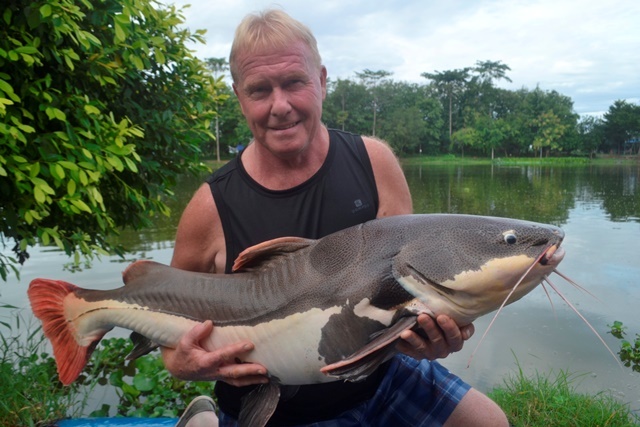 Roger Conner who was referred to us by Colin Bunn of Catmaster Tours had a great inaugural session catching not one but two stunning 100lb+ chao phraya catfish the bigger one weighing in at over 170lb and qualifying him for the Palm Tree Lagoon BIG Chao Phraya Club. 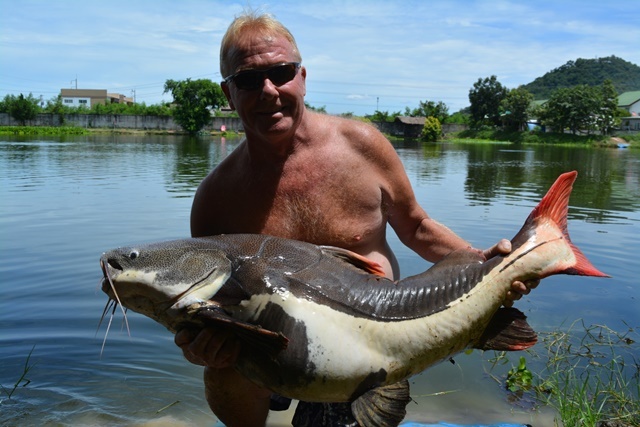 In addition to these awesome catches he has a haul of other superb catches that included Juliens golden price carp to 40lb+, alligator gar to 80lb+, both Chinese bighead and silver carp, Chinese black carp, Mekong catfish, Siamese carp, rohu, pacu, black shark minnow, giant featherback, arapaima, giant snakehead, big-Y catfish, striped catfish, catfish shark, crystal eyed catfish, tambaqui, and both Amazon and Asian redtails. 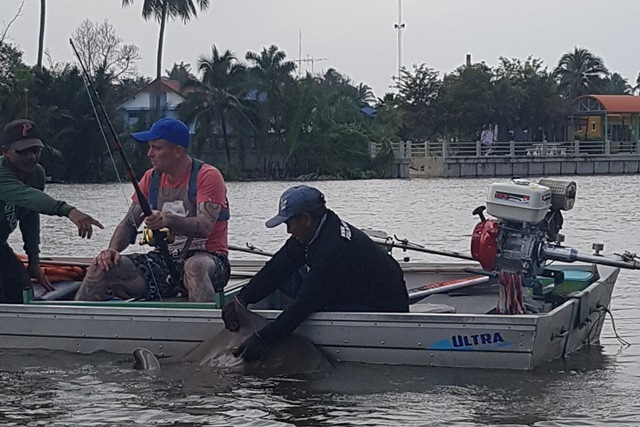 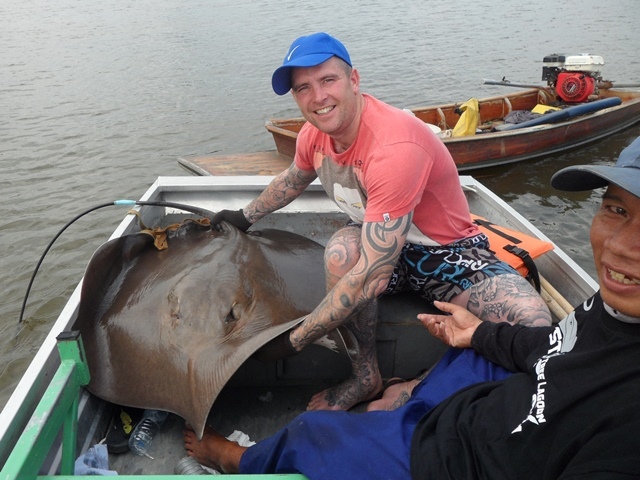 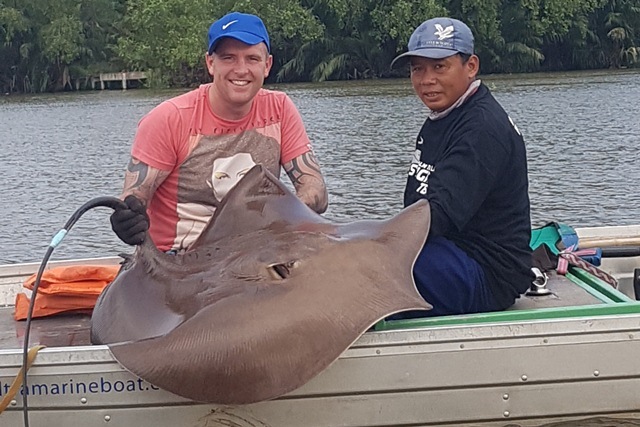 Lee Taylor Clark and Dean Clark teamed up for a days giant freshwater stingray fishing adventure on the Mae Klong river, and team effort was definitely the order of the day as the two of them took turns to finally win a two hour battle with a 520lb giant freshwater stingray. 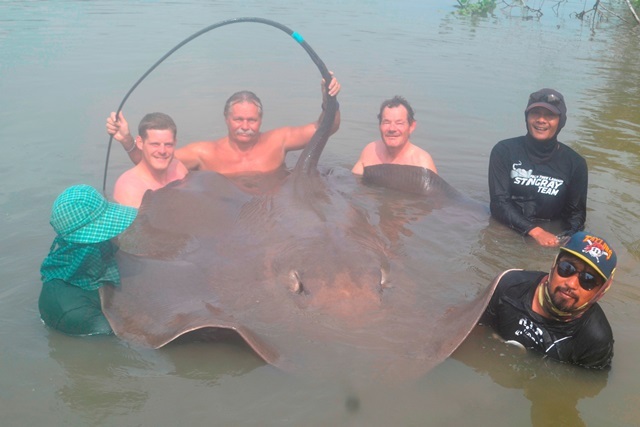 As a result Lee also gained membership of the Palm Tree Lagoon 500lb Stingray Club. 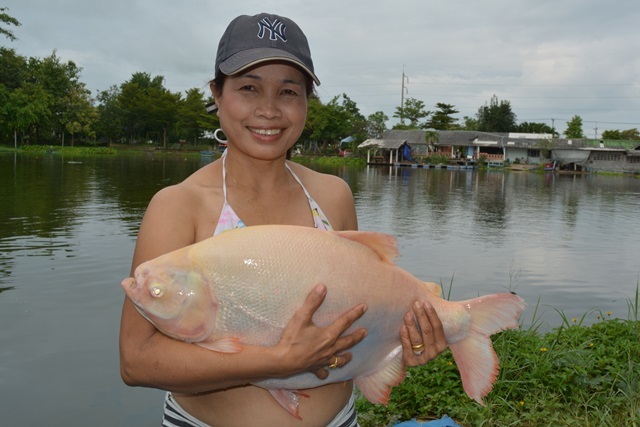 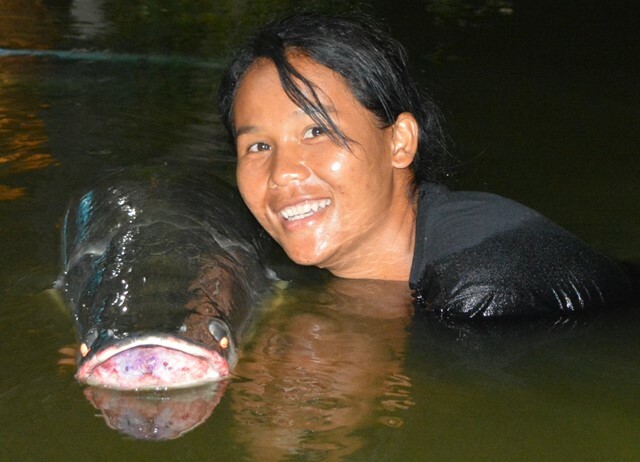 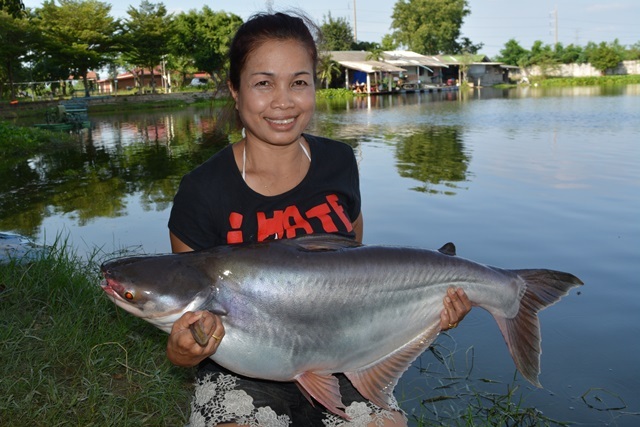 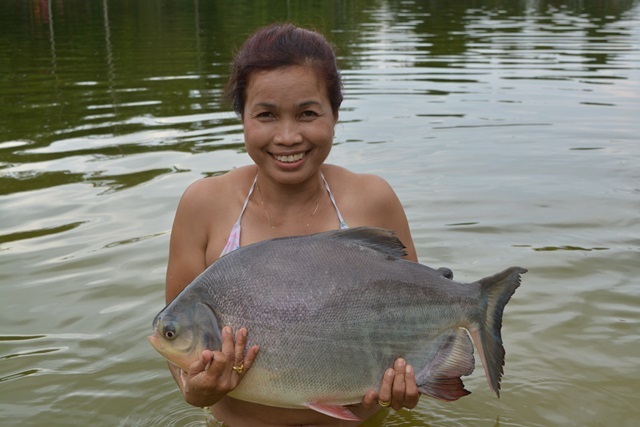 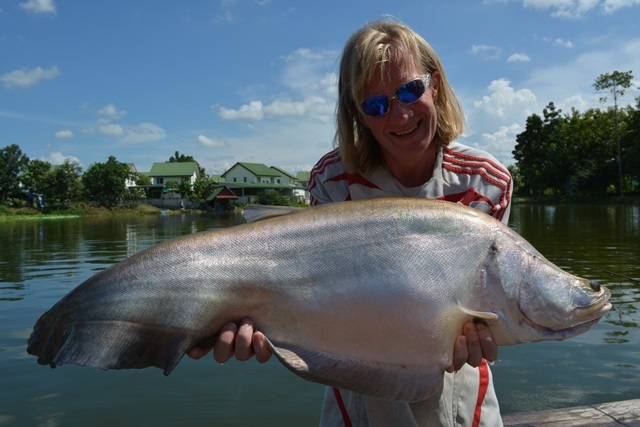 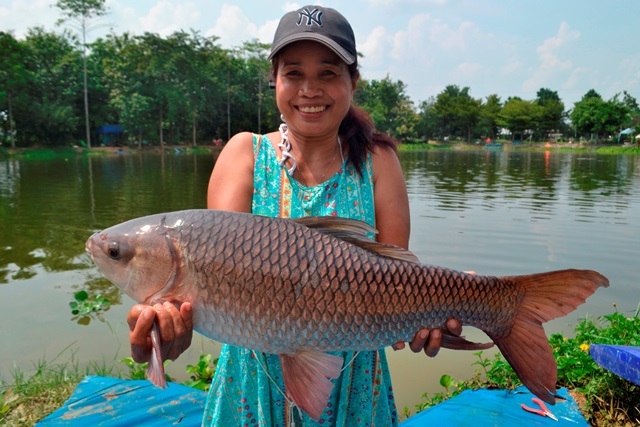 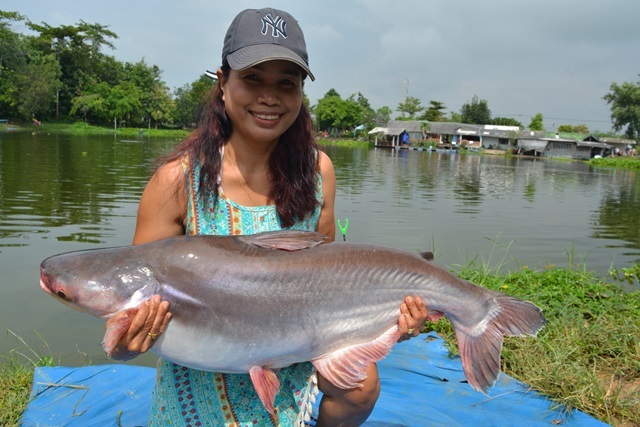 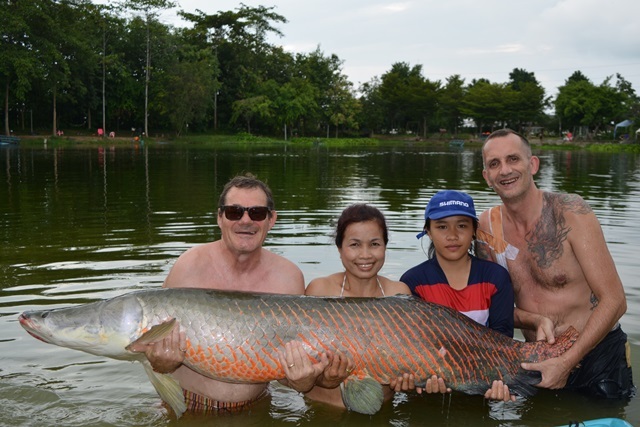 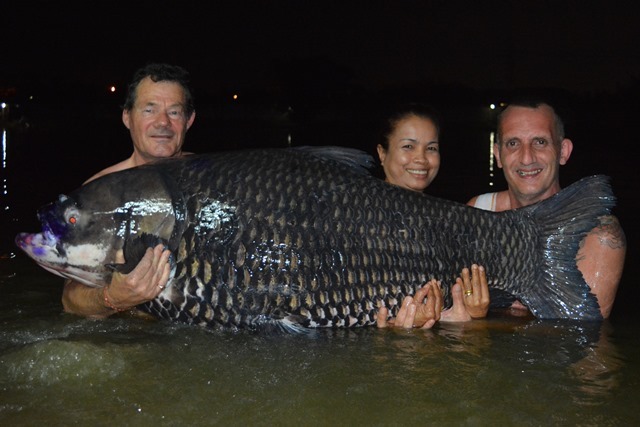 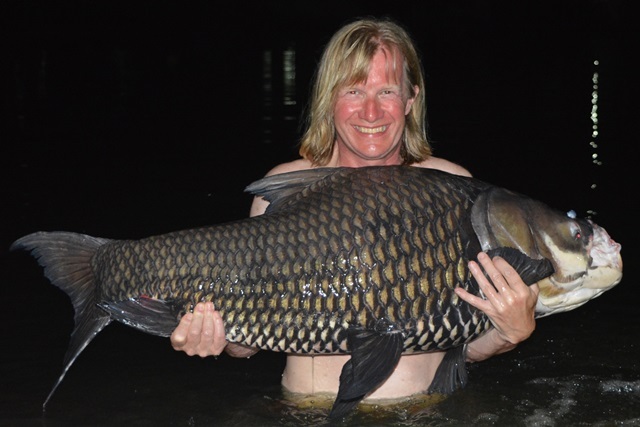 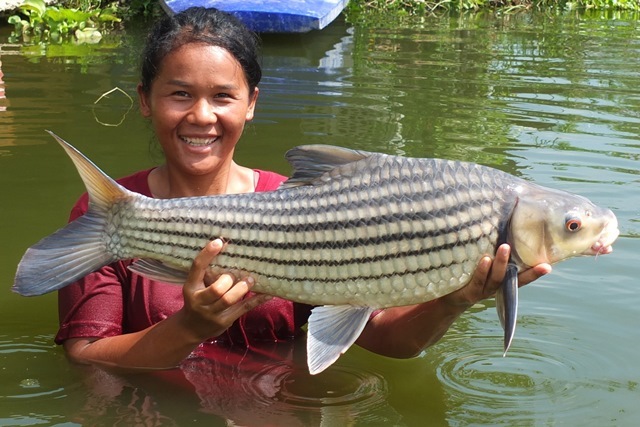 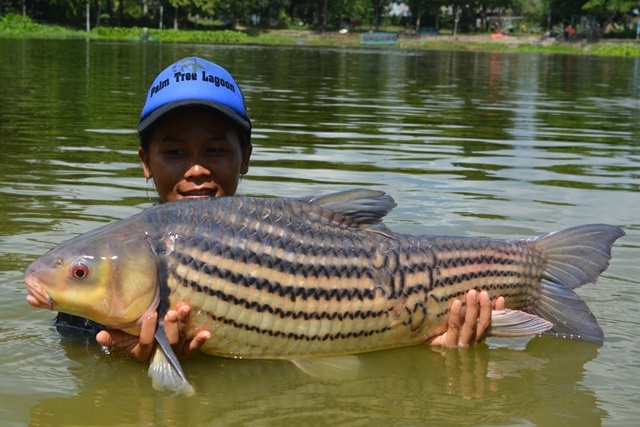 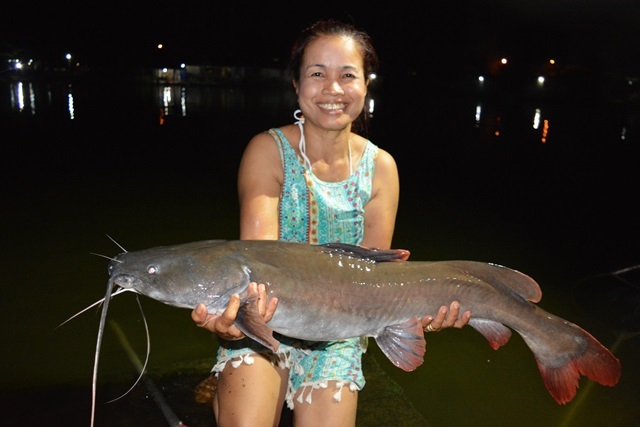 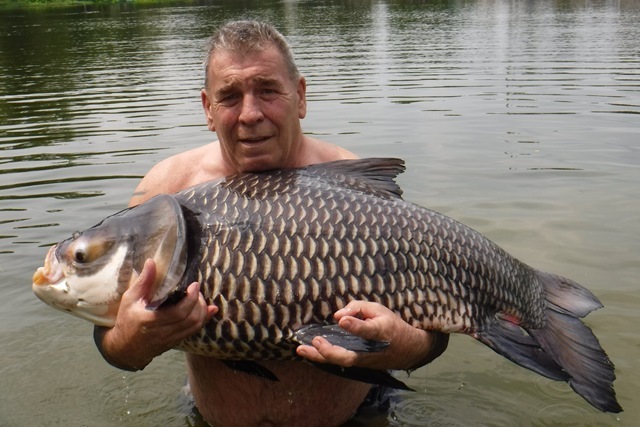 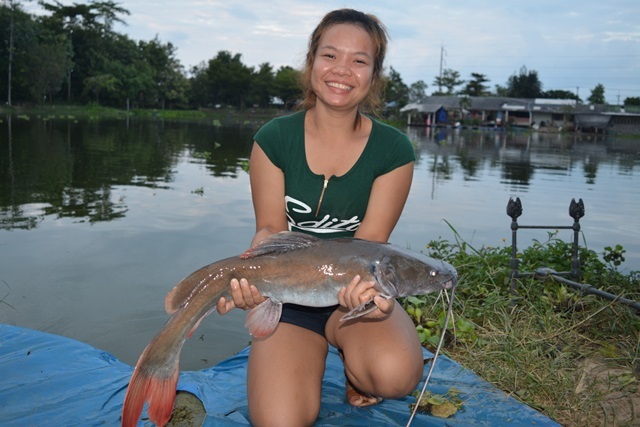 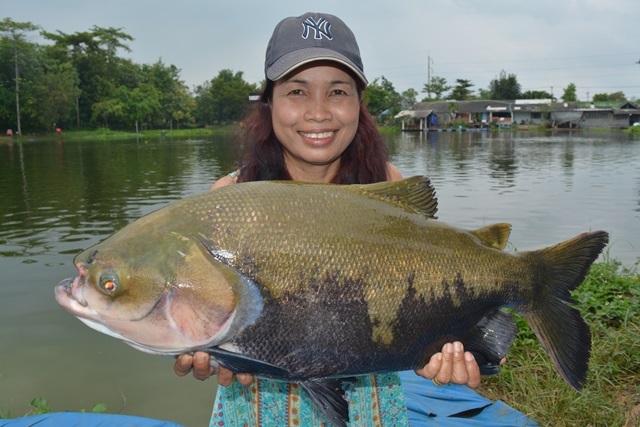 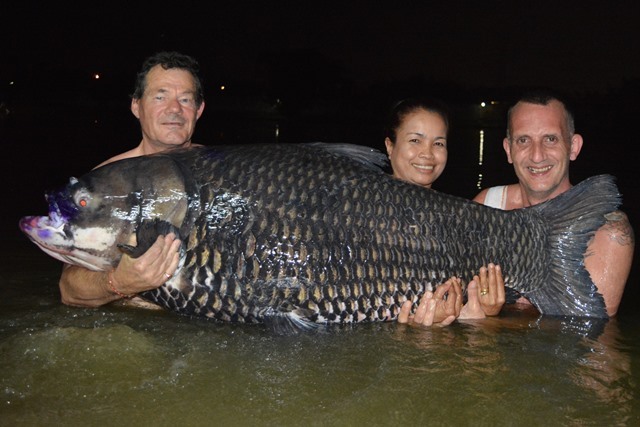 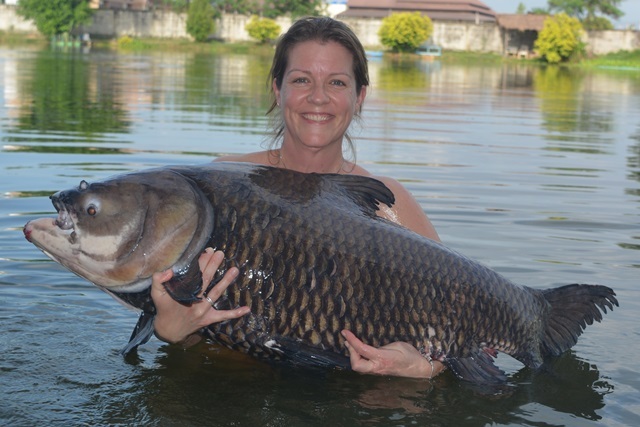 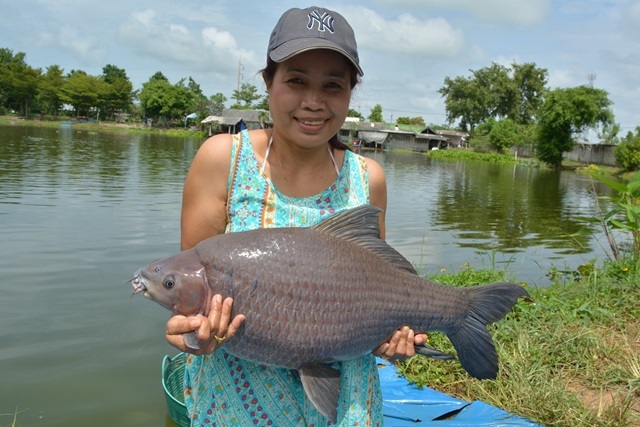 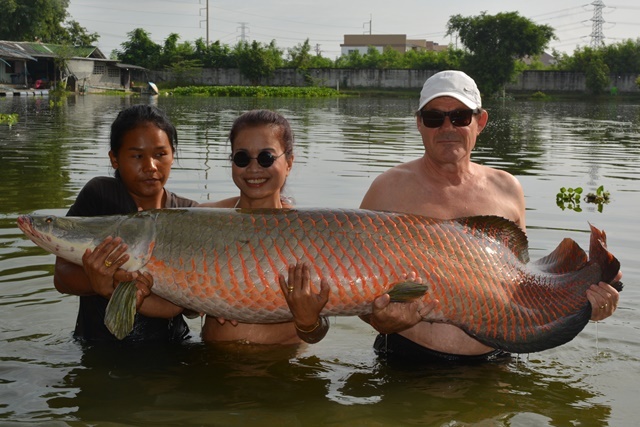 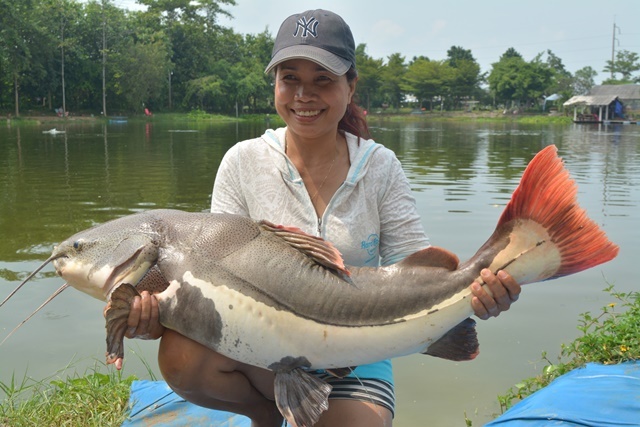 Lek Christalow was back and wasted no time in collecting her second Palm Tree Lagoon 150lb Carp club t-shirt on the first day with an impressive 180lb Siamese. 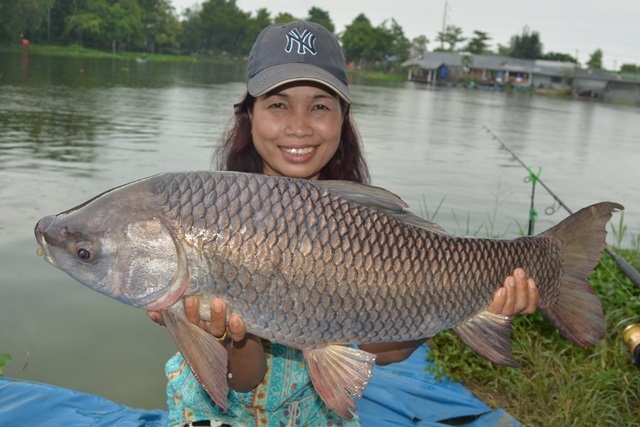 But she didn't stop there, catching a huge number of other fish such as arapaima, Mekong catfish, Juliens golden price carp, striped catfish, pacu, wallago attu, bearded labeo, rohu, yellow catfish, a stunning aslbino pacu, tambaqui, black shark minnow, catfish shark as well as both Thai and Amazon redtails. 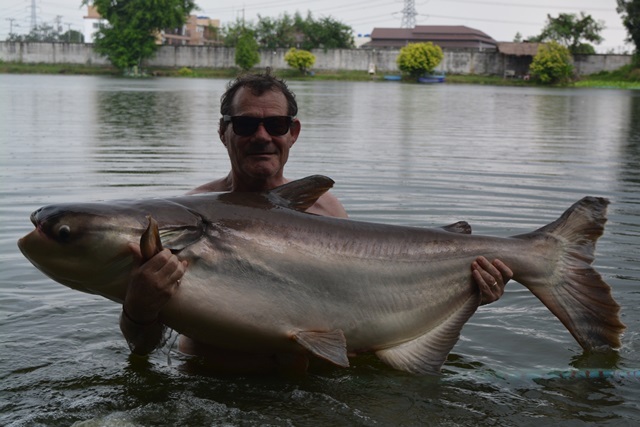 Leigh Knott was back and he caught a large variety of stunning fish that included a rare Salween rita catfish, Siamese carp, ripsaw catfish, both Chinese bighead and silver carp, Mekong catfish, giant featherback, yellow catfish, big-Y catfish, bearded labeo, rohu, tambaqui, spotted featherback, mollycot, catfish shark, striped catfish as well as both Asian and Amazon redtails. 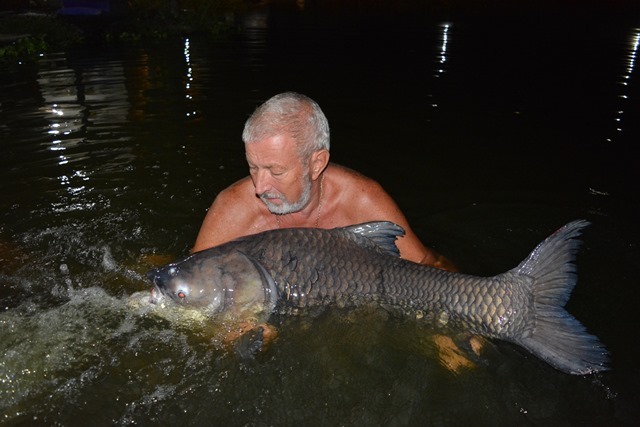 Lee Taylor-Clark was back for his annual visit and this time was successful in joining the Palm Tree Lagoon BIG Carp Club with a stunning 180lb+ Siamese carp. 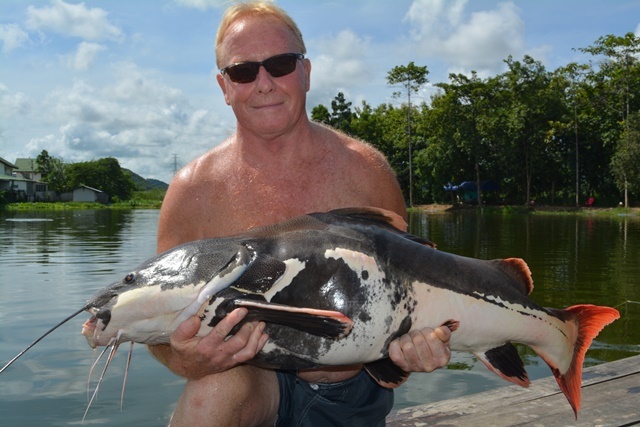 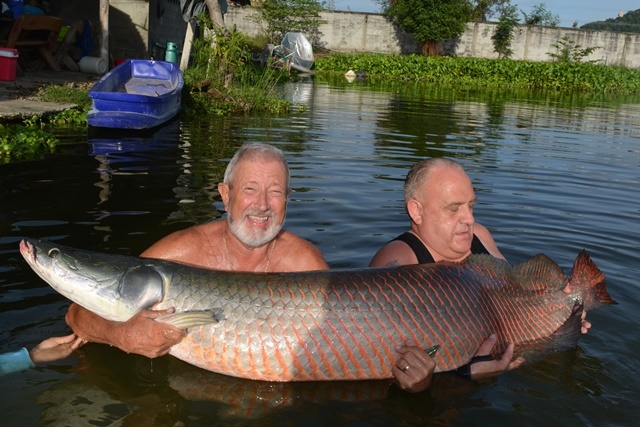 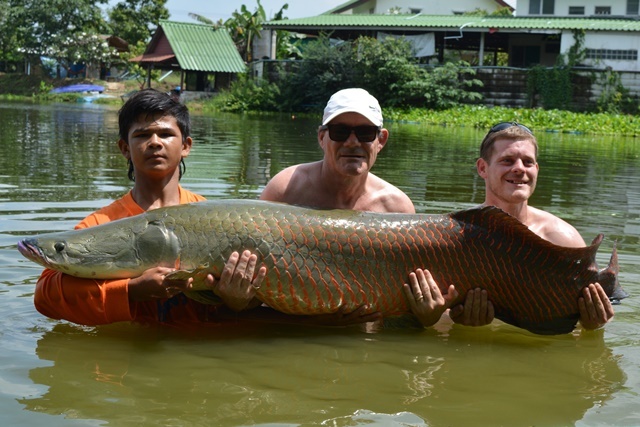 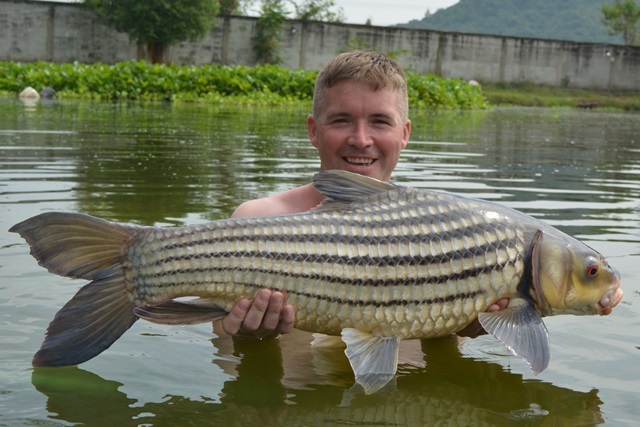 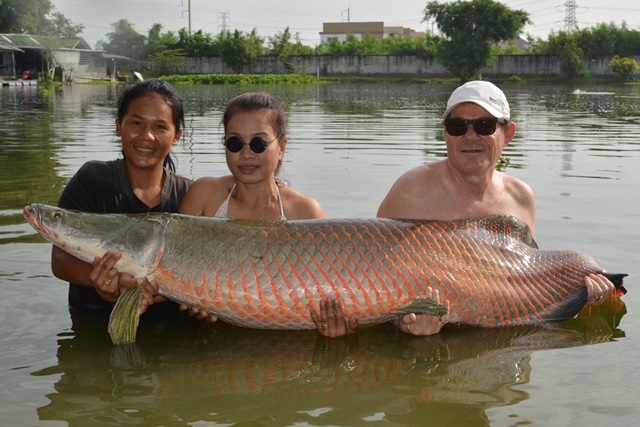 He also caught some other great catches like arapaima, Mekong catfish, striped catfish as well as both Amazon and Asian redtails. 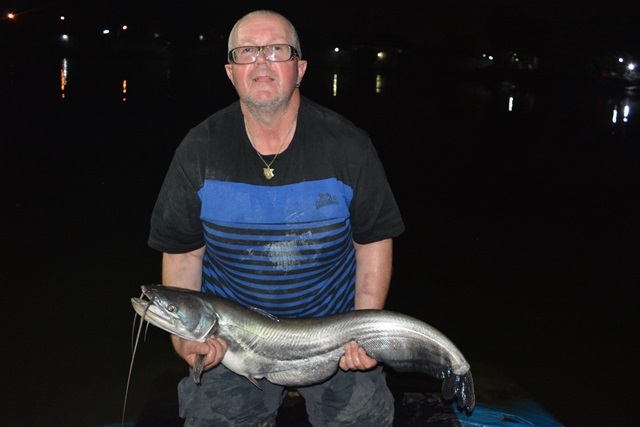 Tim Bowden was another angler who was so impressed with his first visit to Palm Tree he was already planning his return halfway through the session. 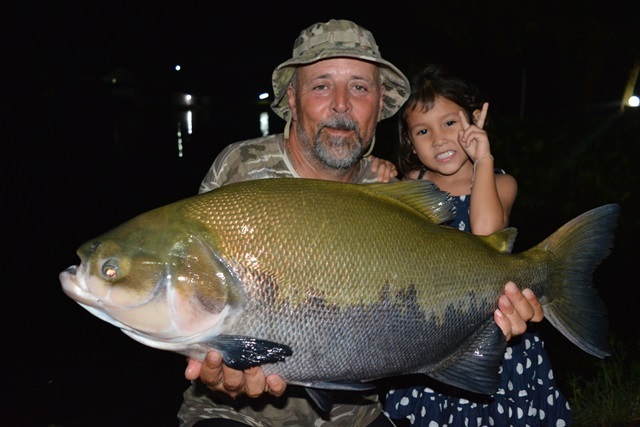 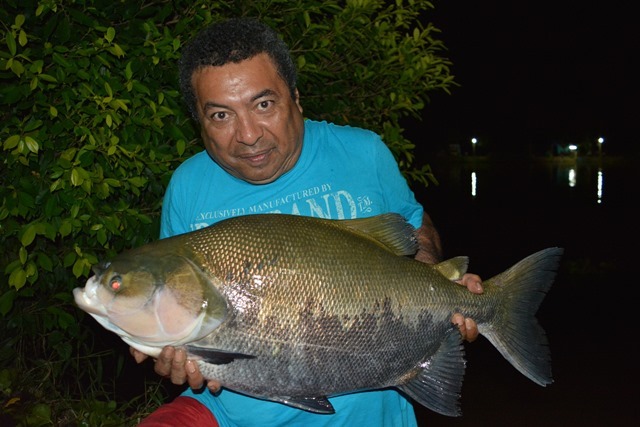 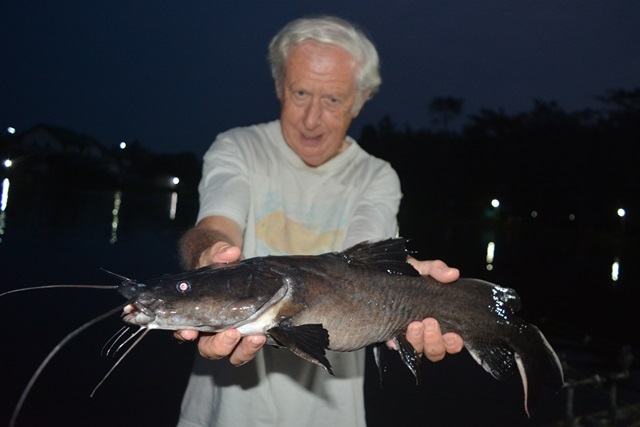 He caught a number of stunning fish that included tambaqui, giant snakehead, wallago attu, Juliens golden price carp, bearded labeo, yellow catfish, mrigal, Siamese carp, striped catfish, catfish shark, as well as both Amazon and Asian redtails. 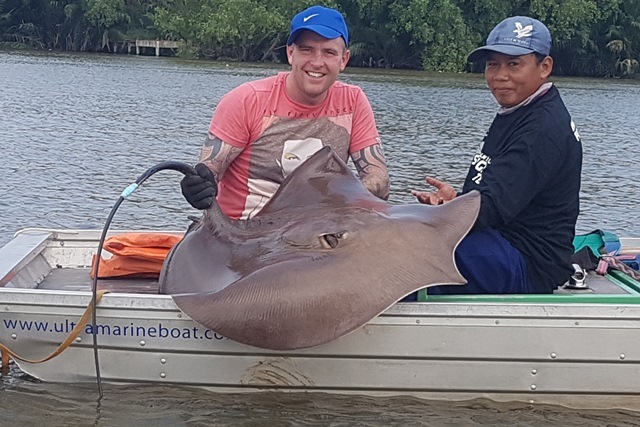 Regular Wayne Murray was back for one of his bi-annual visits and this time brought a mate along for one of his days. 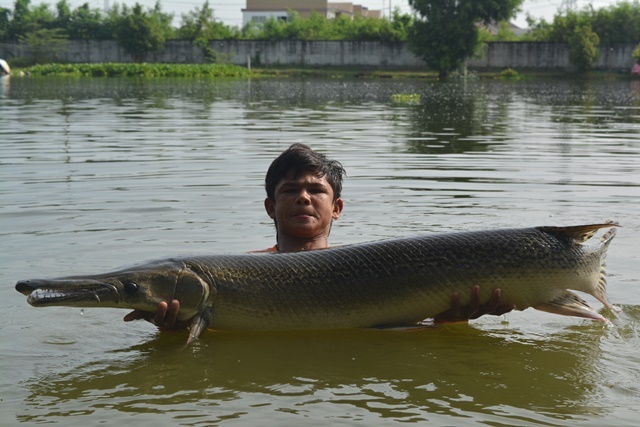 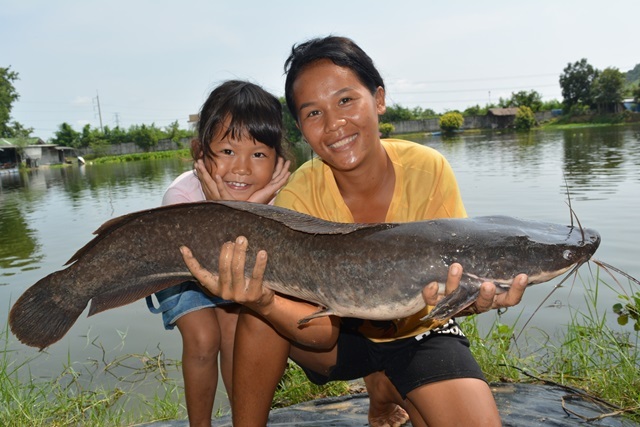 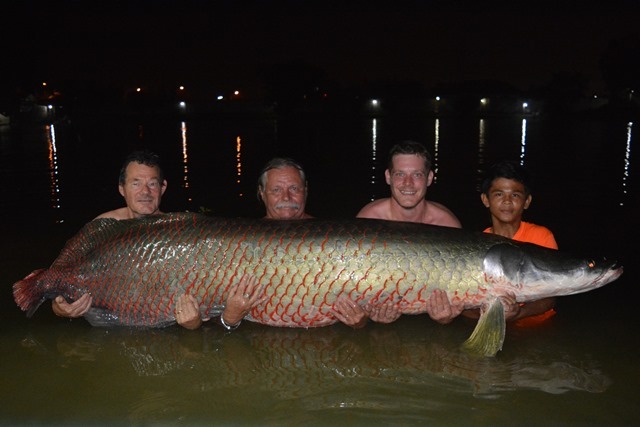 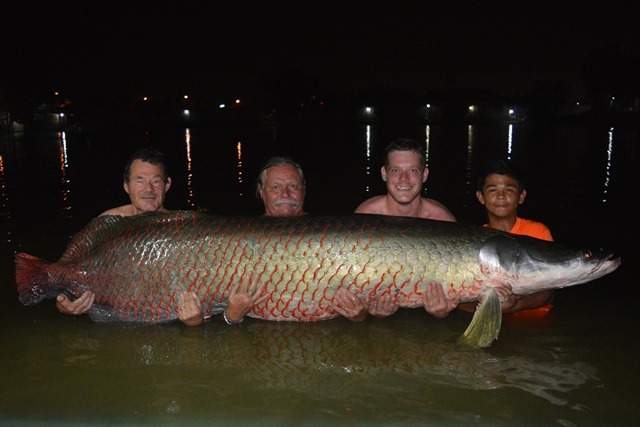 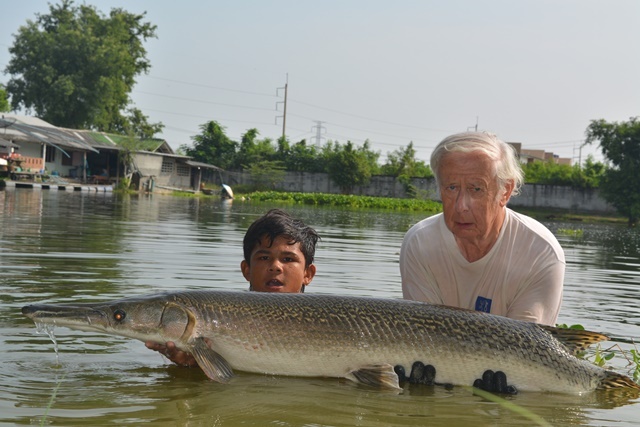 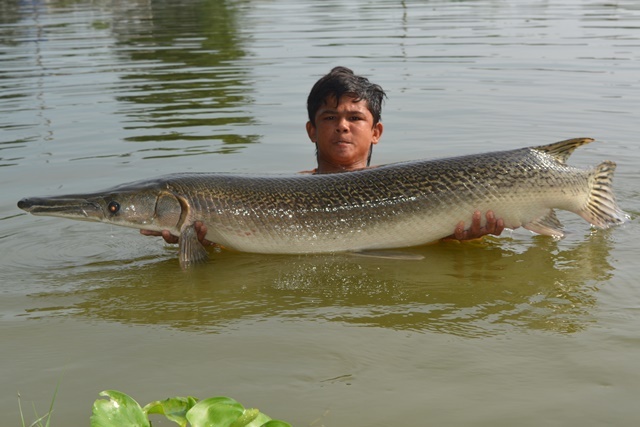 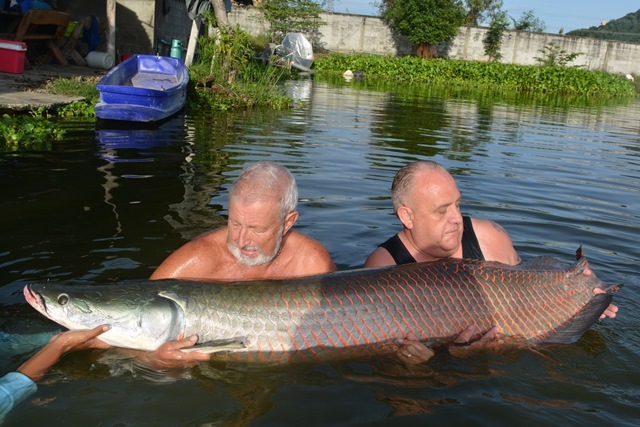 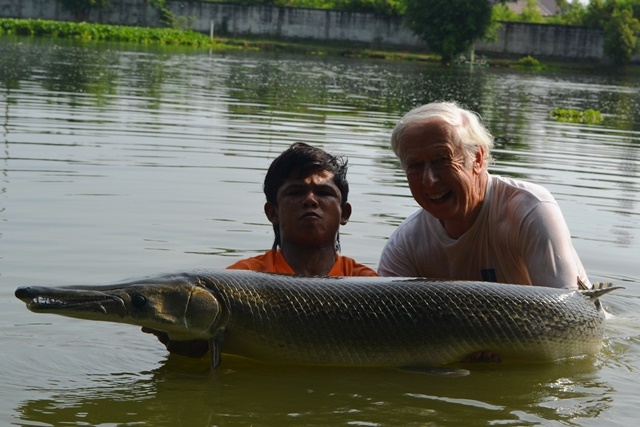 They caught a variety of species the pick of the catches being a 90lb+ Amazon redtail as well as bearded labeo, black shark minnow, mrigal, arapaima, big-Y catfish, alligator gar, rohu, Africanised walking catfish, striped catfish. 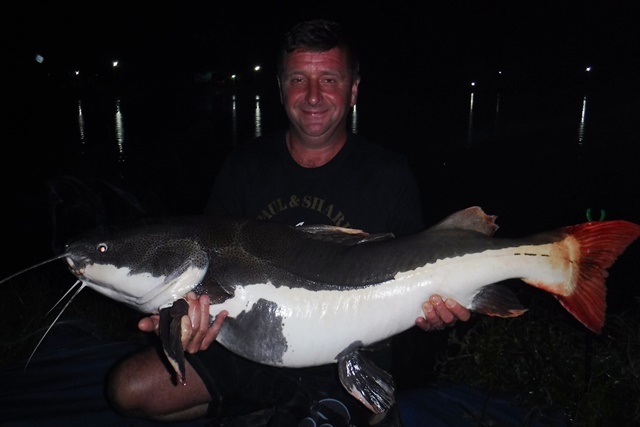 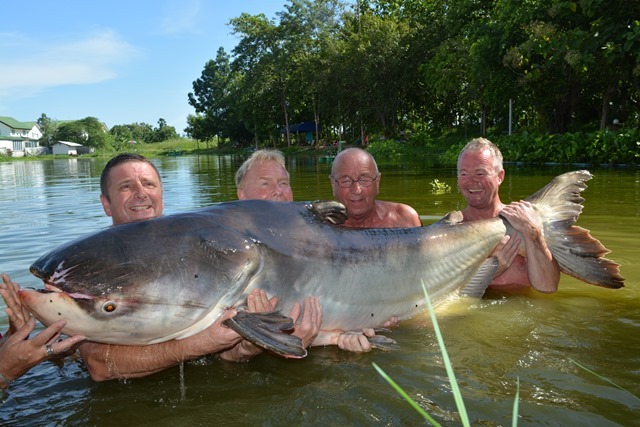 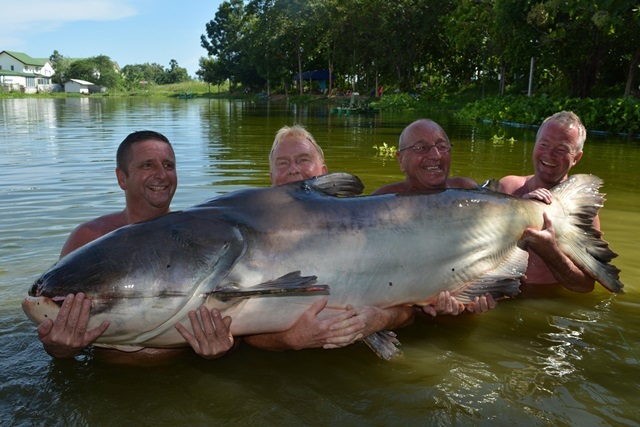 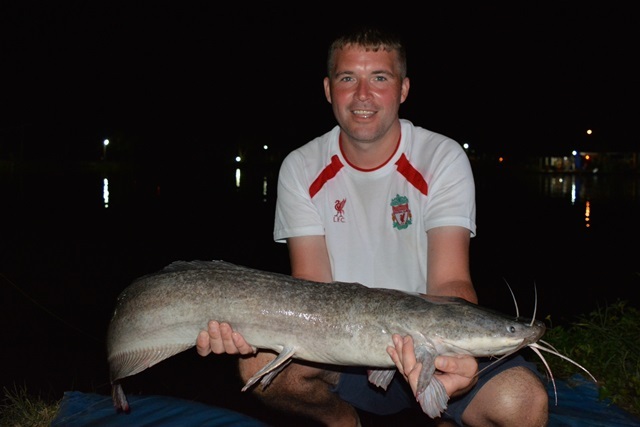 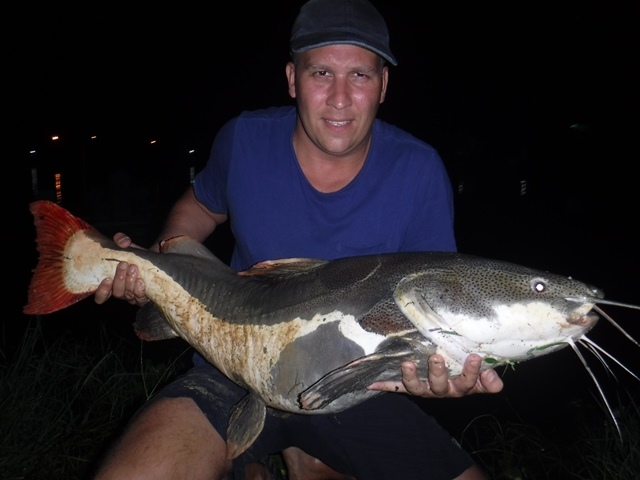 However the biggest fish of the session was a 350lb Mekong catfish which qualified Wayne for the Palm Tree Lagoon 300lb Catfish Club. 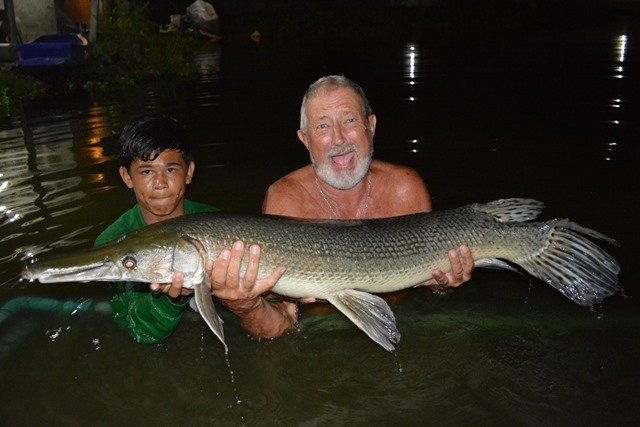 Phil Van Steeg returned for another session during the month this time accompanied by fishing mate Frans Dotulong and between them they caught a myriad of great catches that included Juliens golden price carp, tambaqui, an awesome alligator gar, striped catfish, Siamese carp, Mekong catfish, catfish shark, and Amazon redtail. 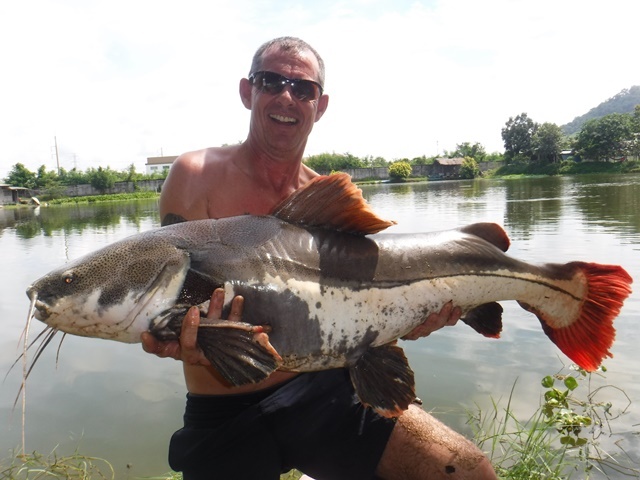 Gordon Rennie and Marcus Denton were more than happy with their first visit to Palm Tree catching a rarely caught marble catfish, as well as an impressive Juliens golden price carp, Siamese carp to 143lb, bearded labeo, tambaqui, and both Amazon and Asian redtails. 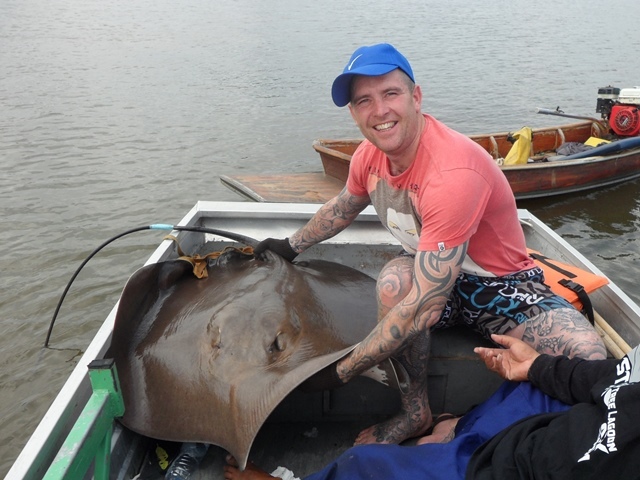 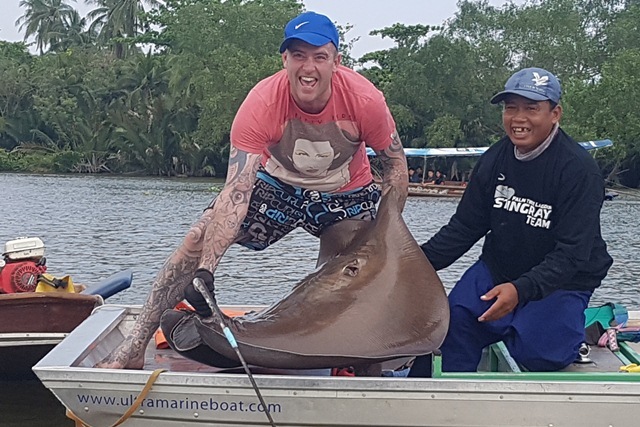 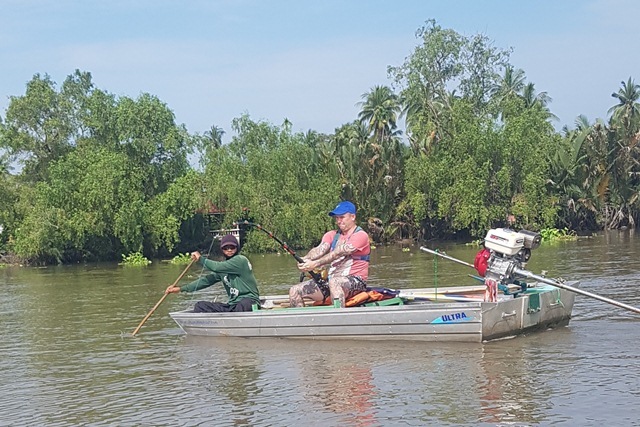 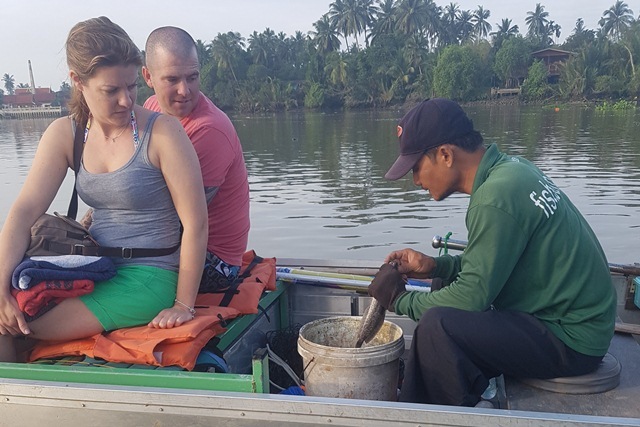 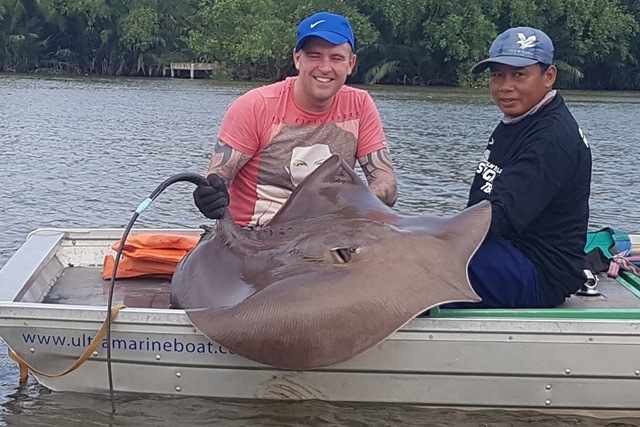 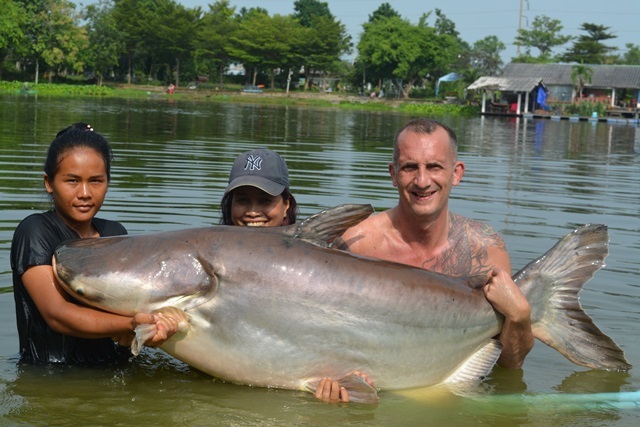 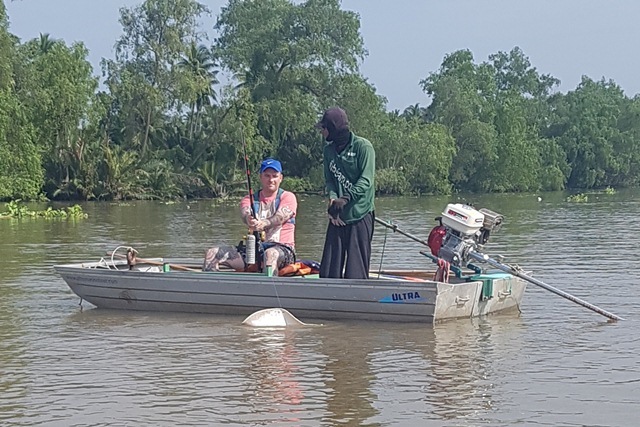 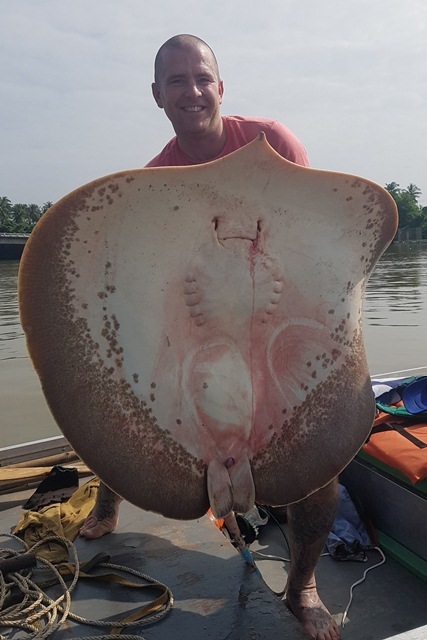 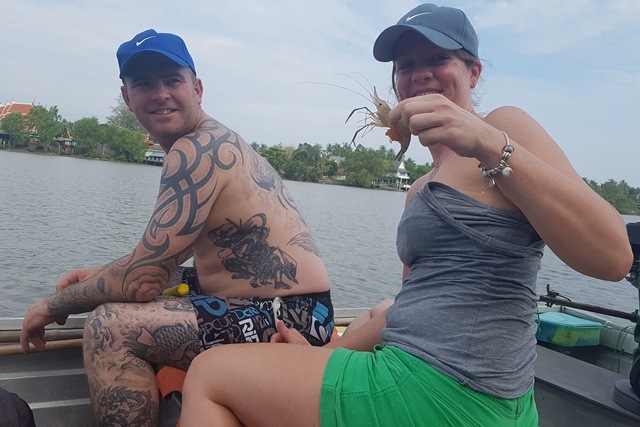 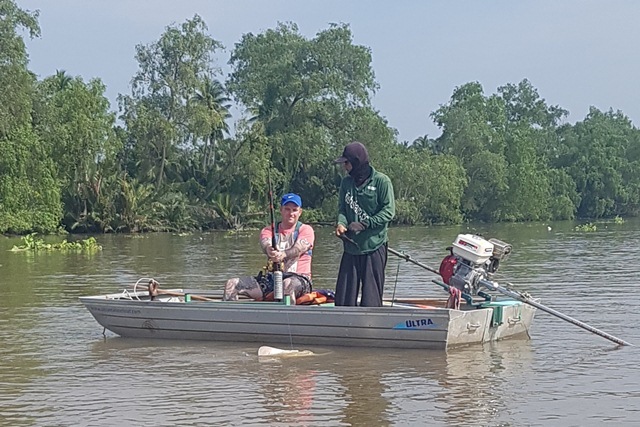 No big ones this time for Pete Upperton and Nikki Fahy, but they were still all smiles with the couple they did manage catch as they experienced giant freshwater stingray fishing for the first time on the Mae Klong river. 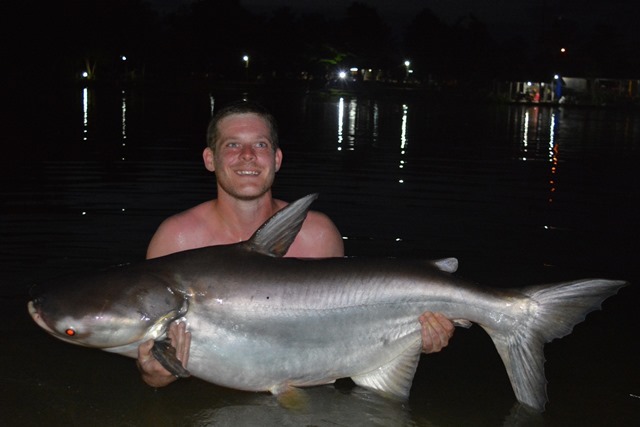 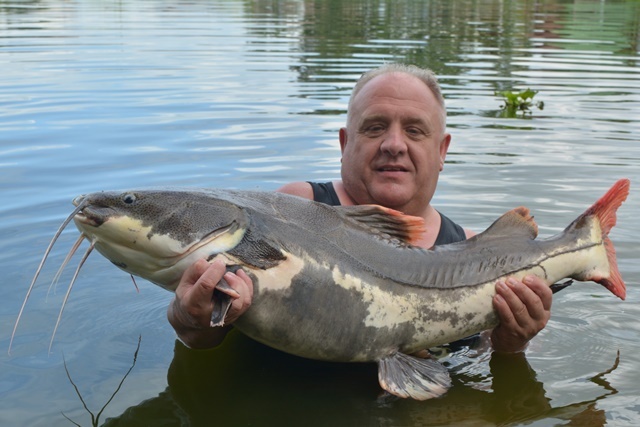 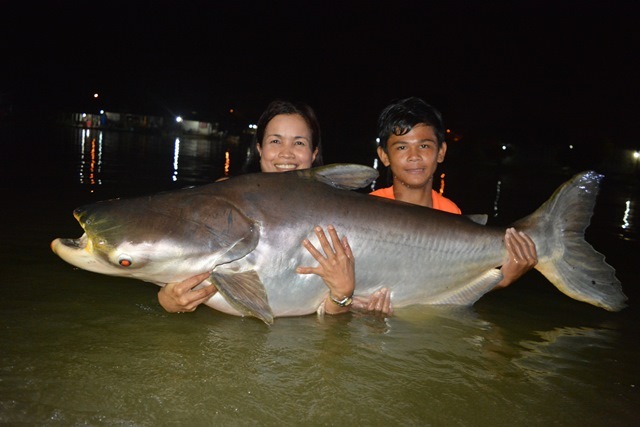 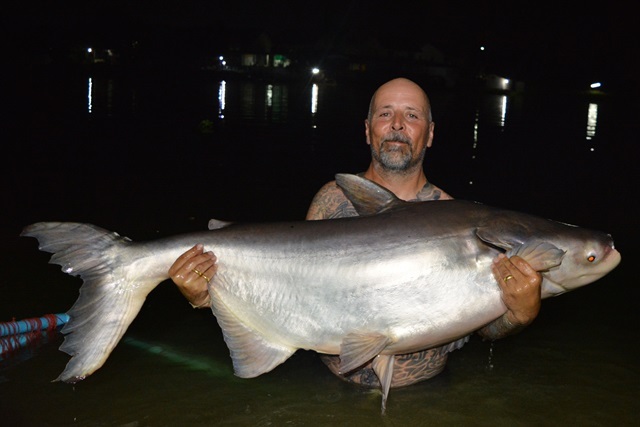 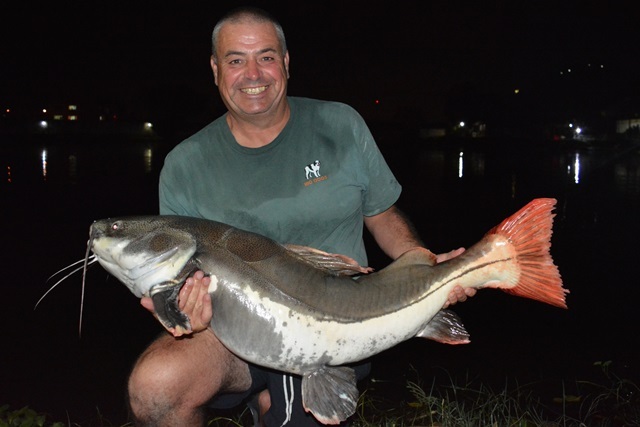 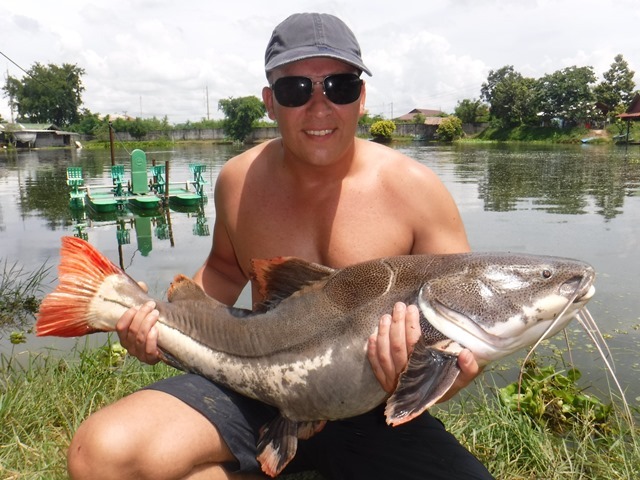 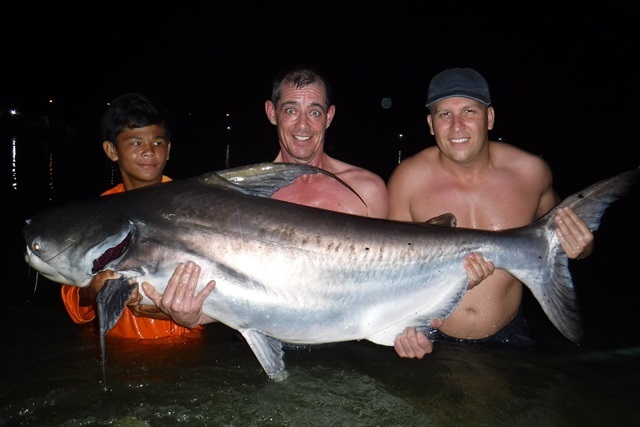 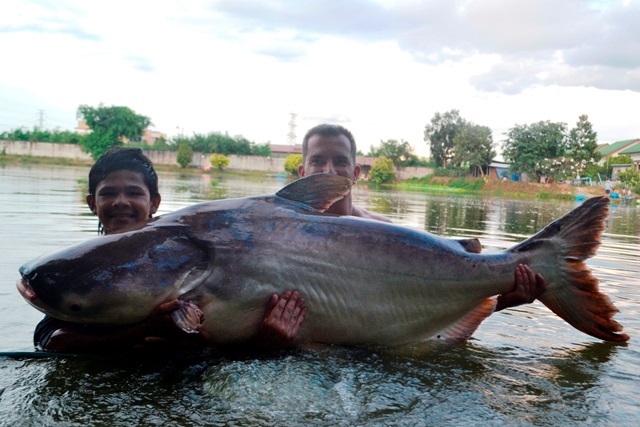 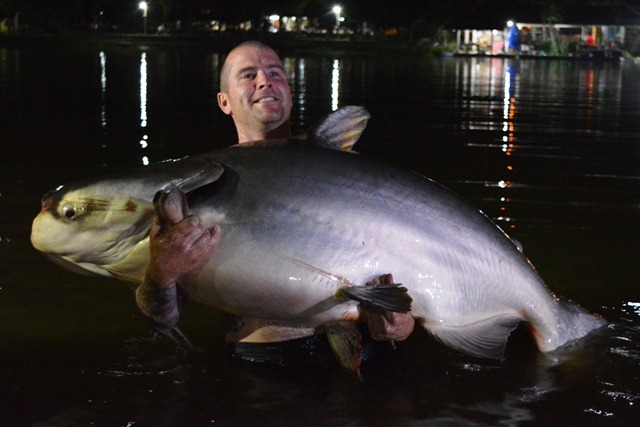 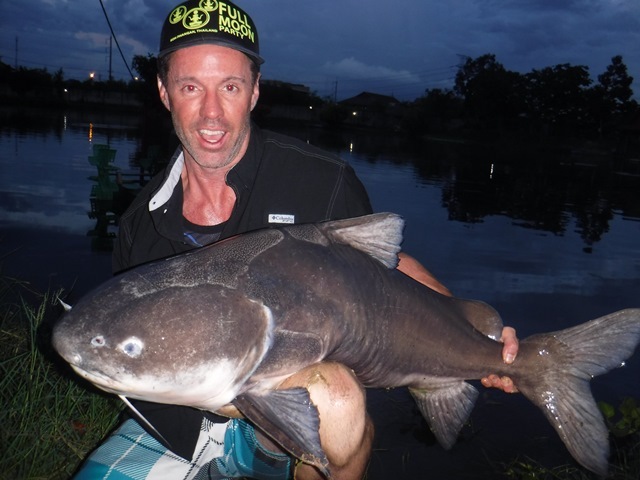 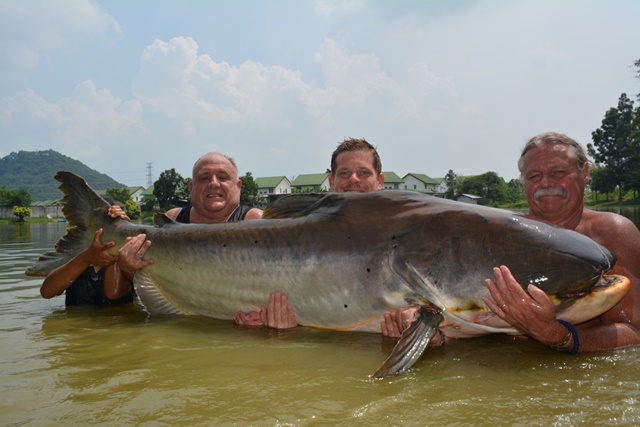 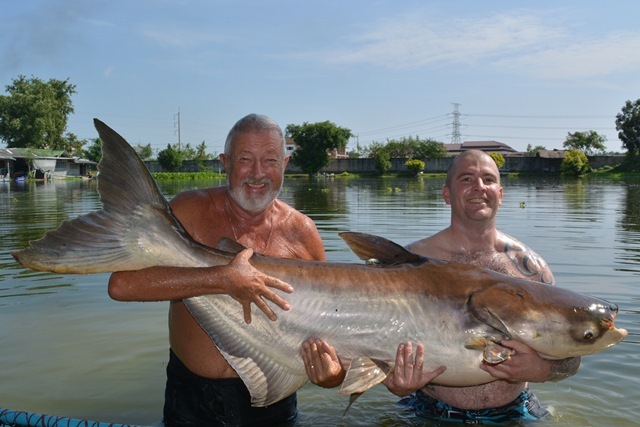 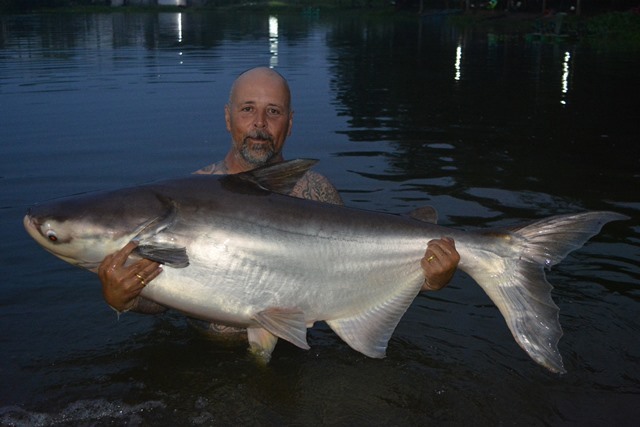 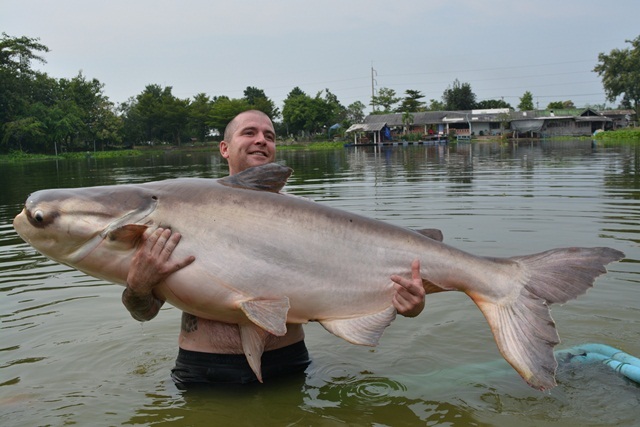 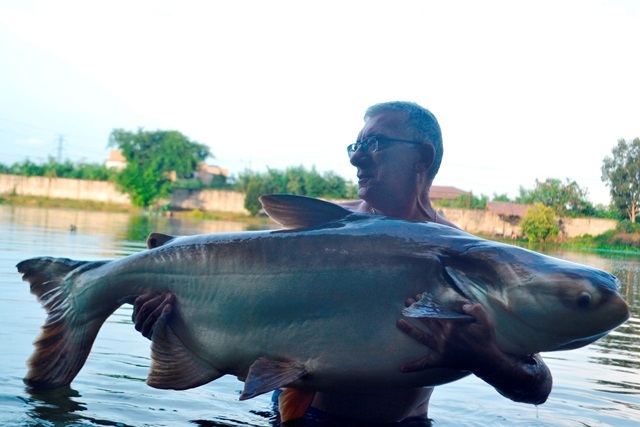 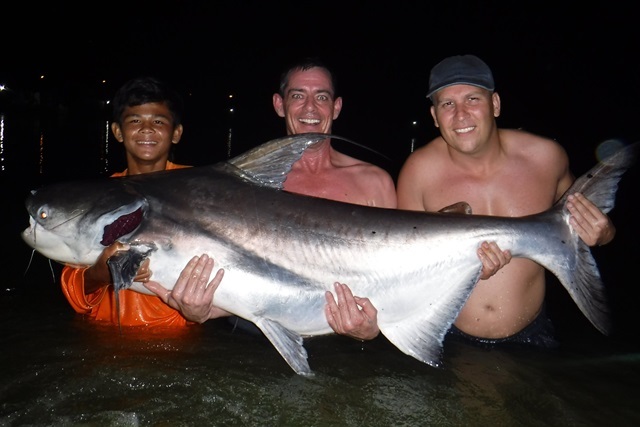 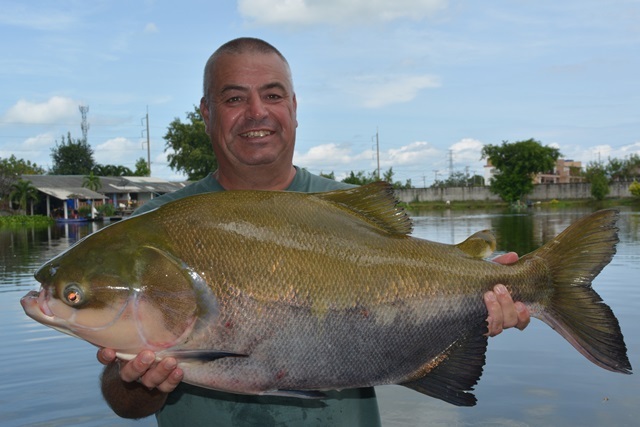 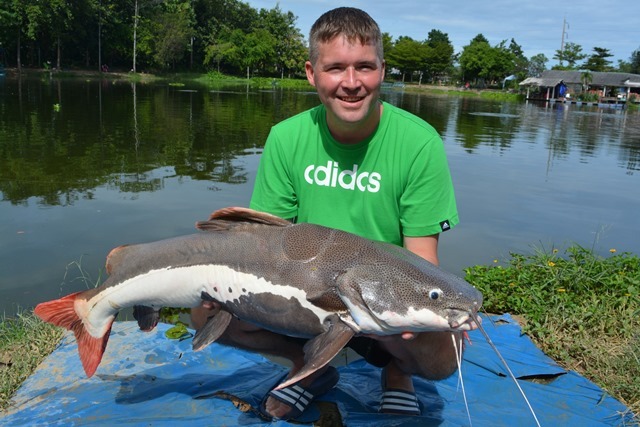 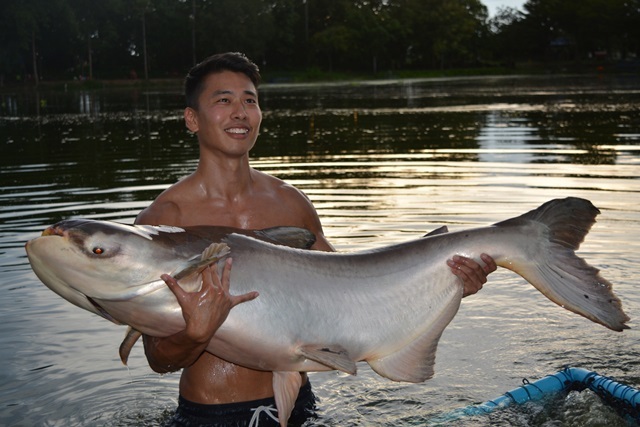 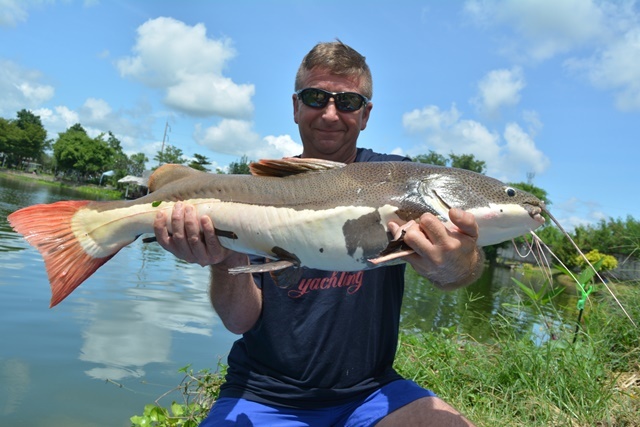 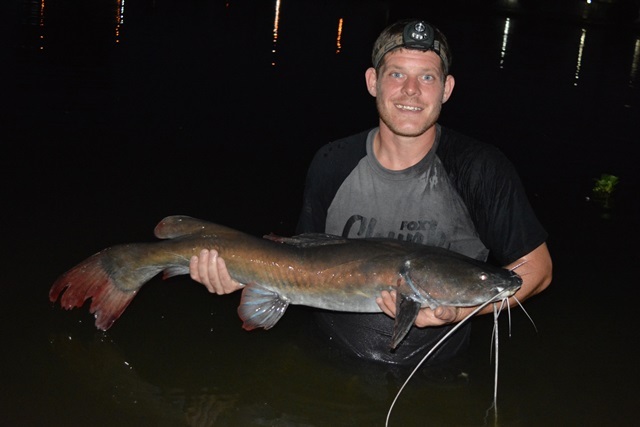 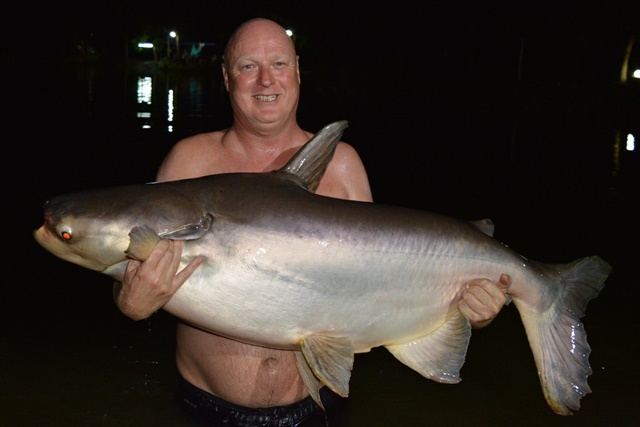 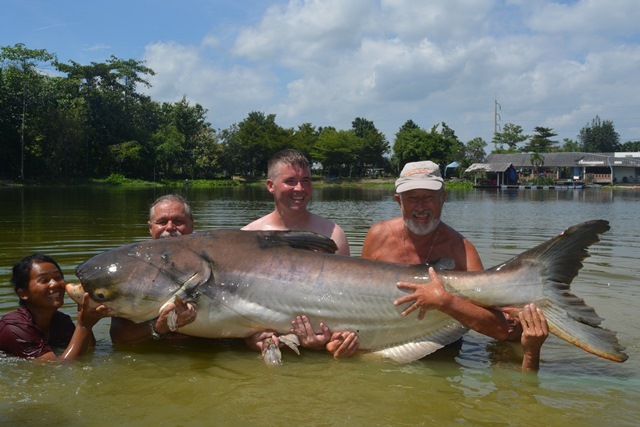 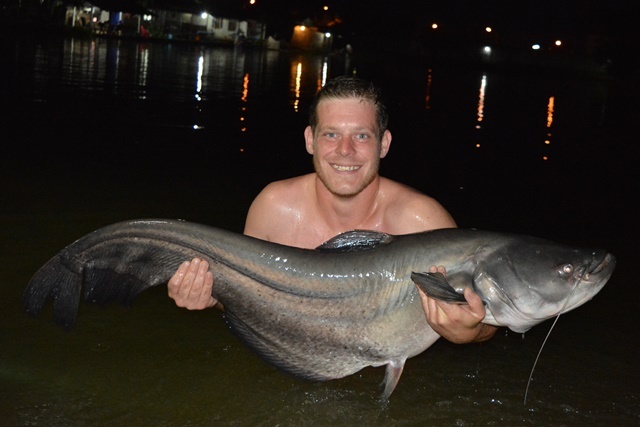 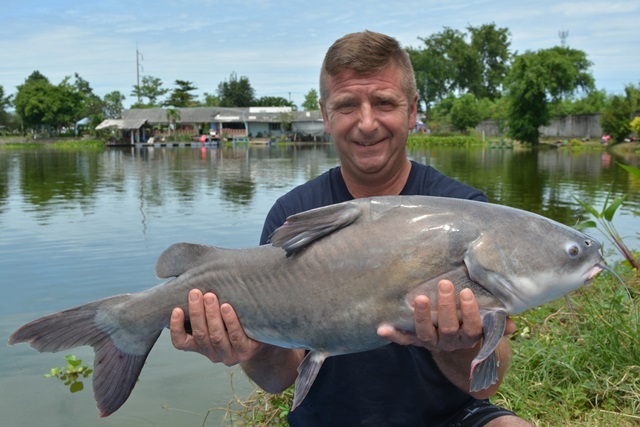 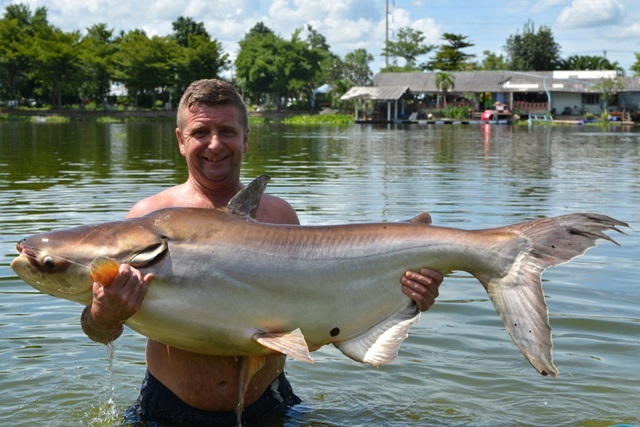 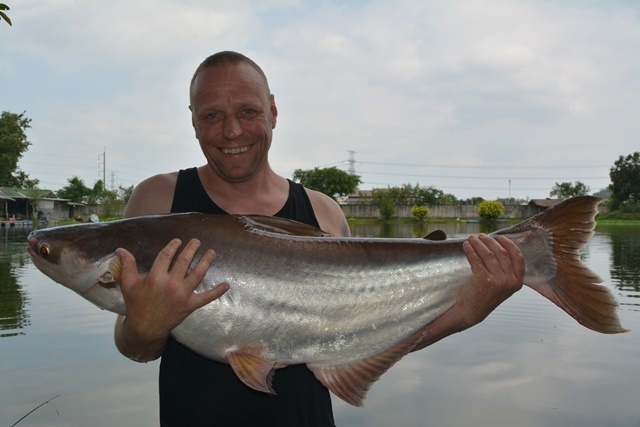 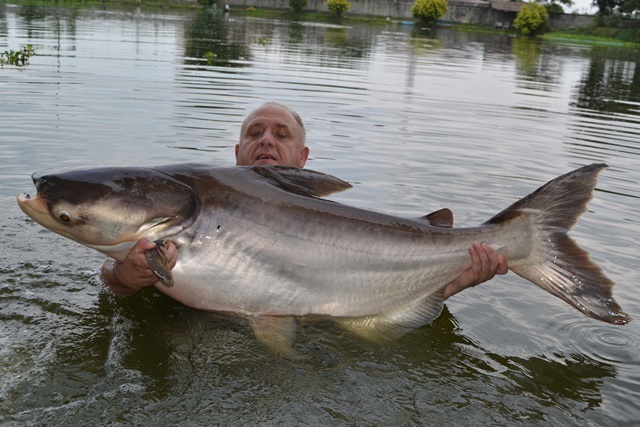 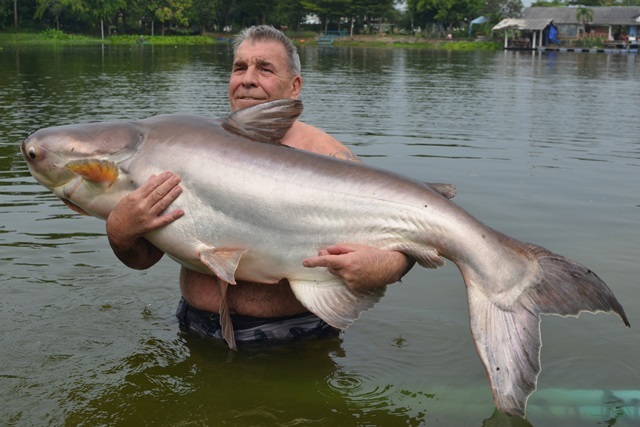 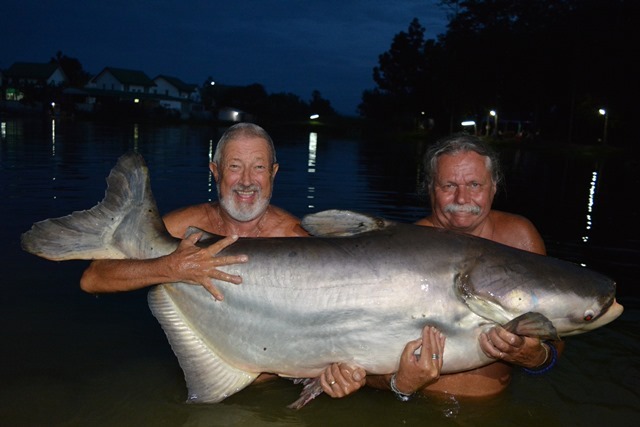 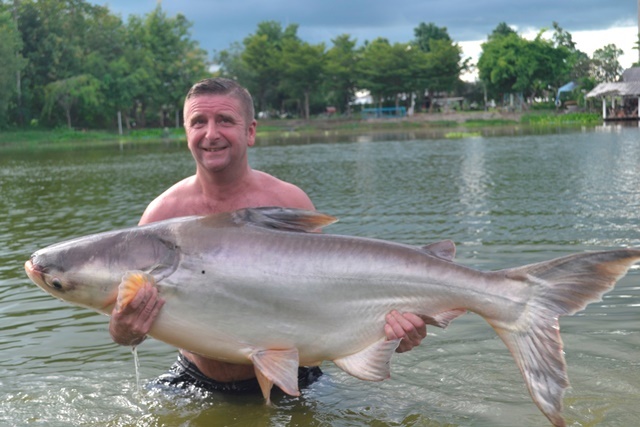 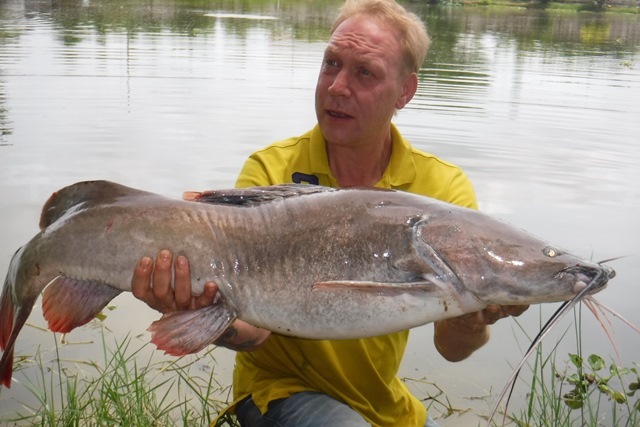 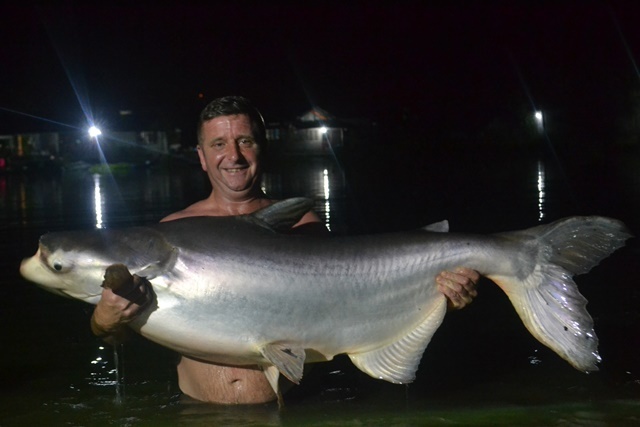 Clifford Thomas Jackson vowed to be back soon after a great session of catching Amazon redtail and Chinese bighead carp culminated with an awesome capture of a 130lb Chao Phraya catfish. 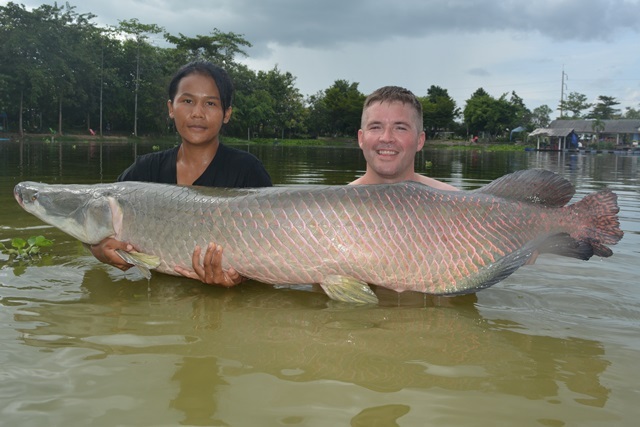 Matt Christalow returned for his annual pilgrimage and although an injured shoulder meant he had to hand over any big fish to his mates to land he still persevered and caught some awesome fish like arapaima, pacu, giant snakehead, rohu, clown featherback, tambaqui, as well as both Amazon and Thai redtails. 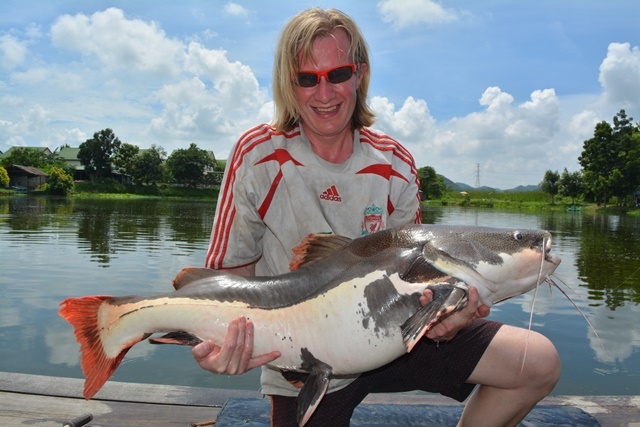 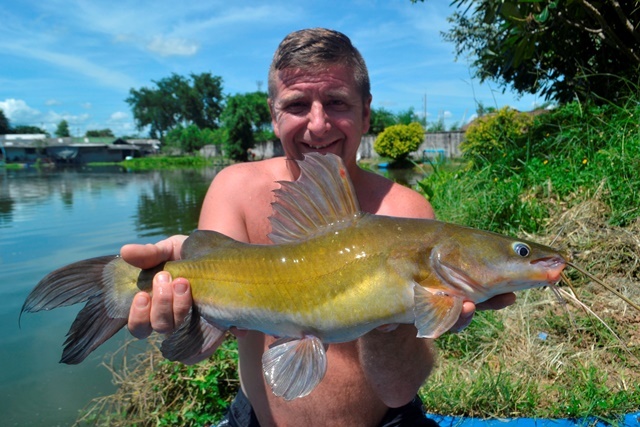 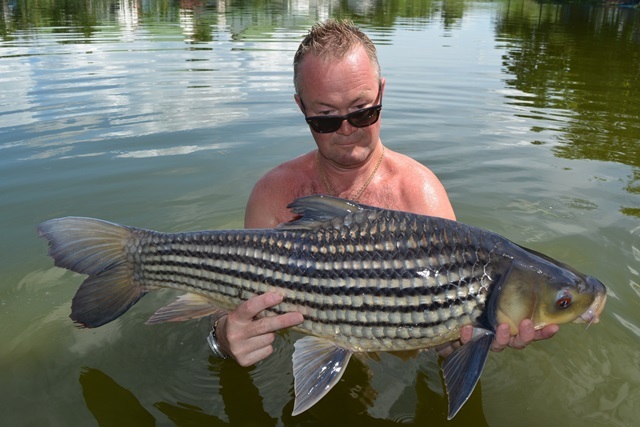 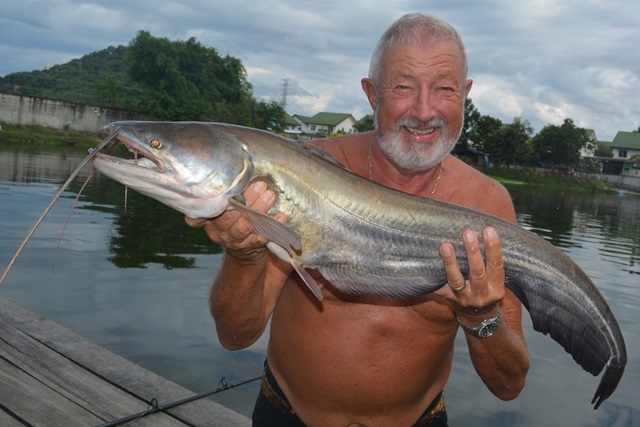 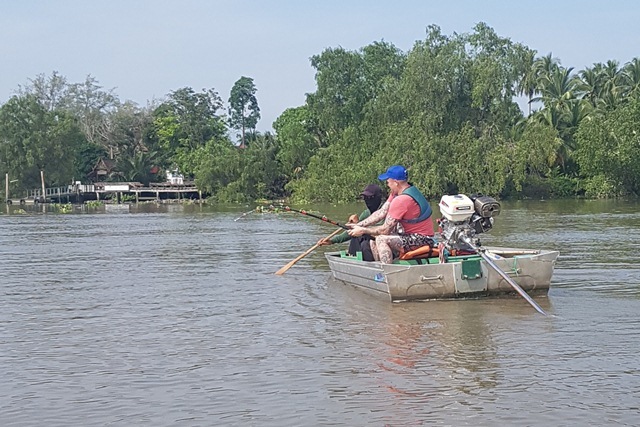 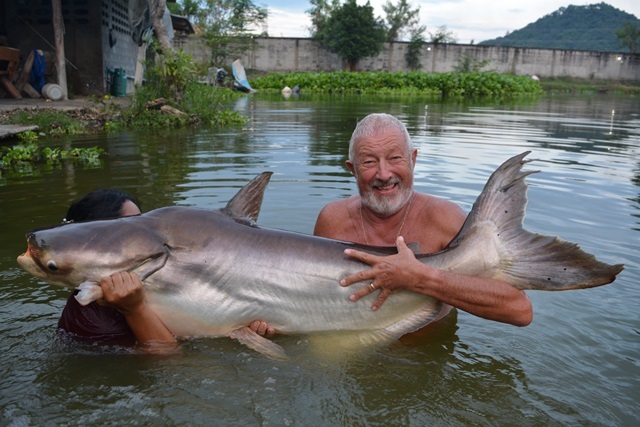 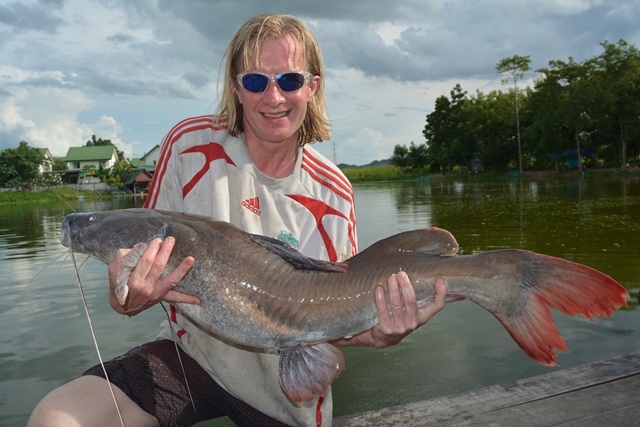 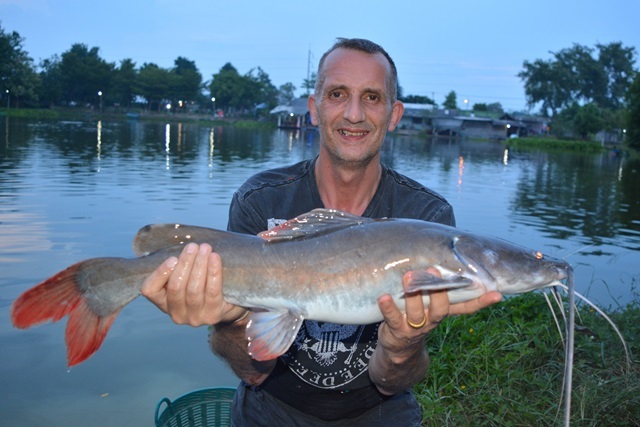 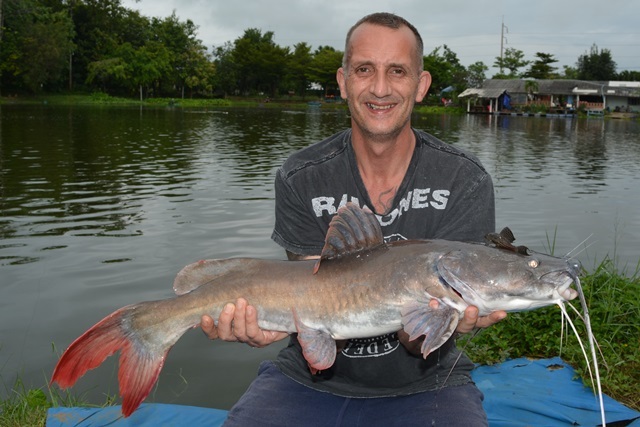 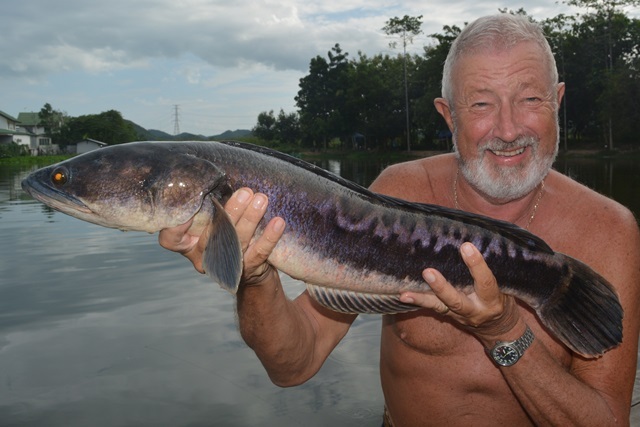 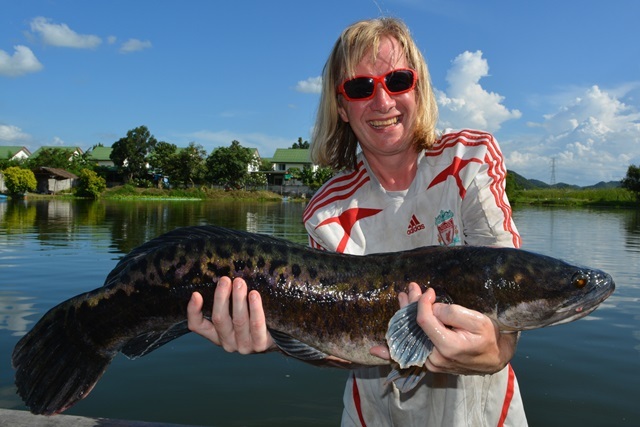 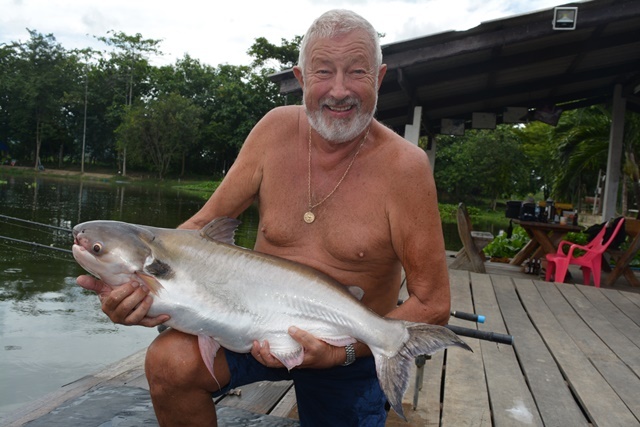 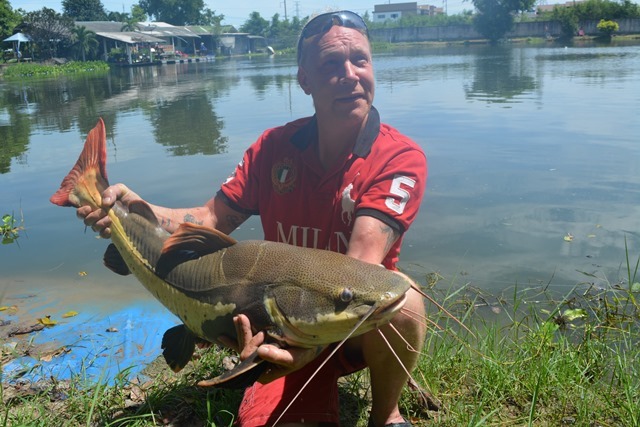 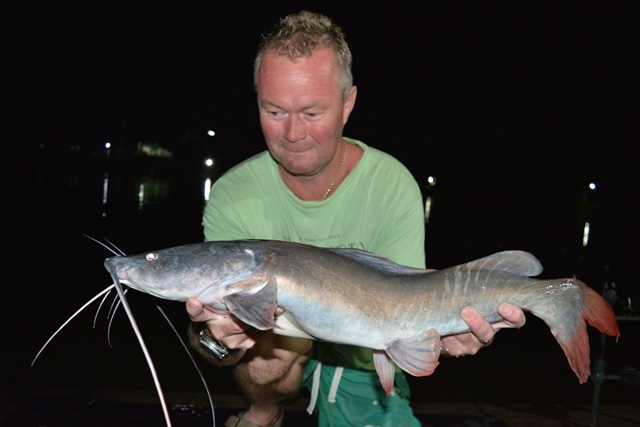 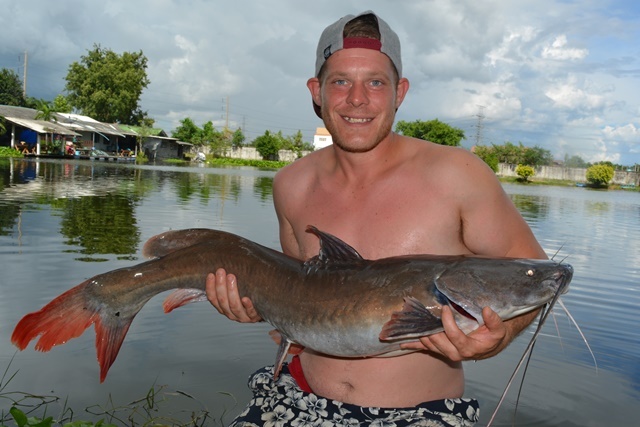 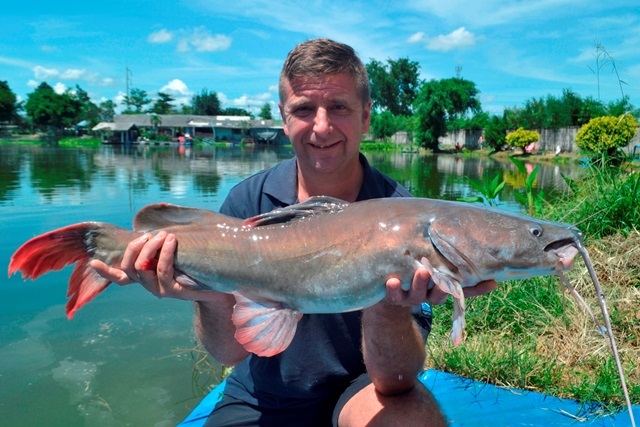 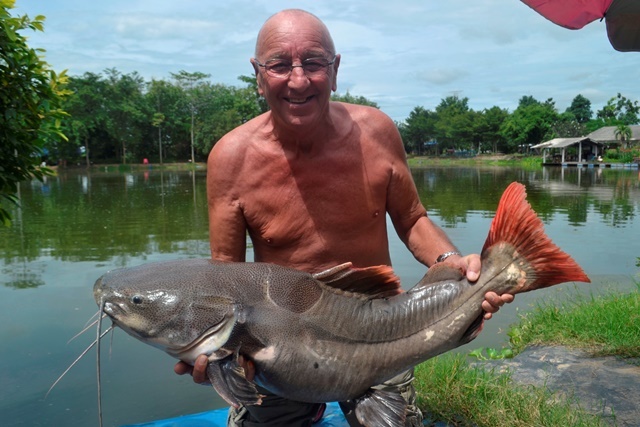 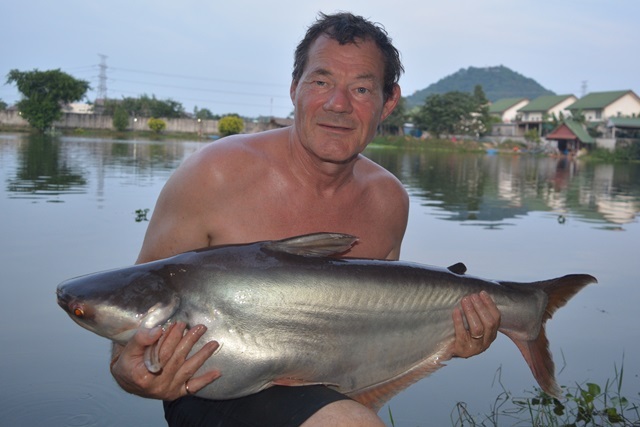 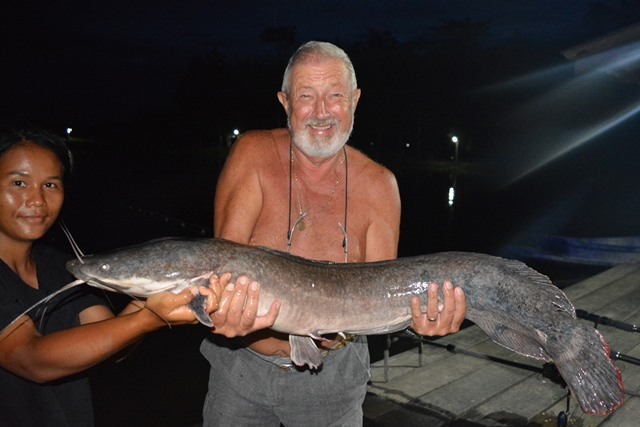 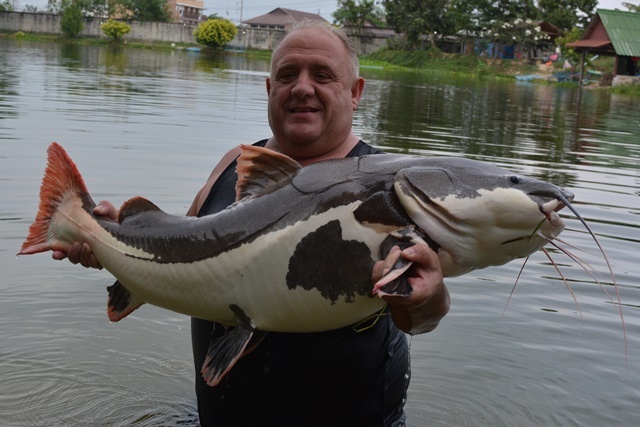 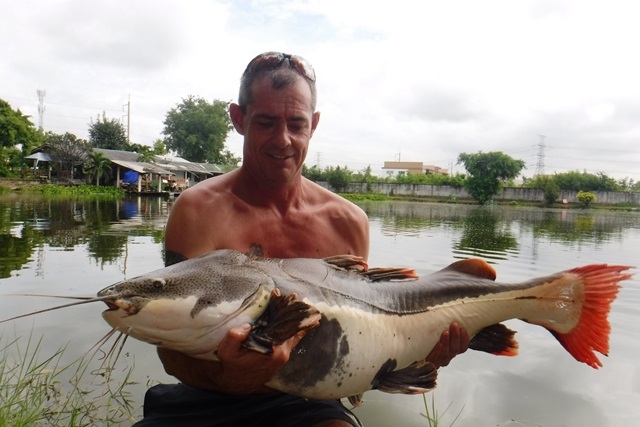 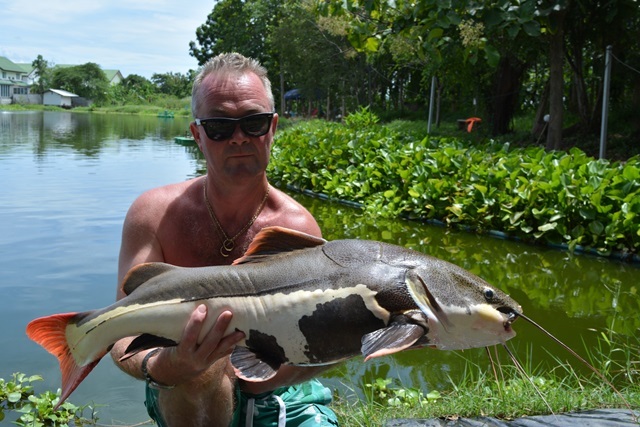 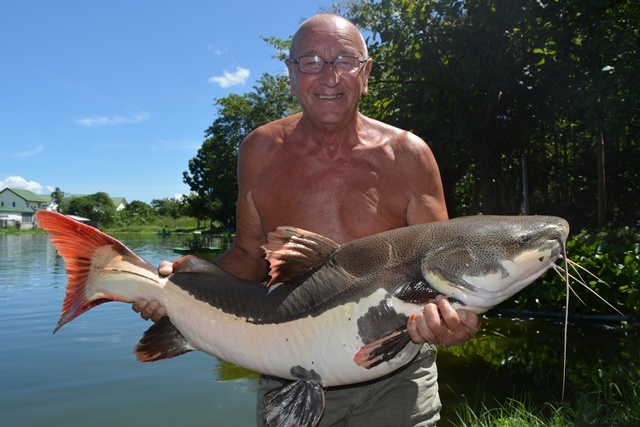 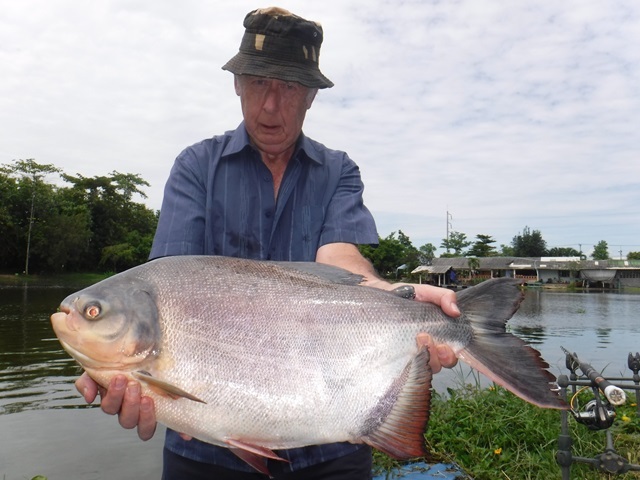 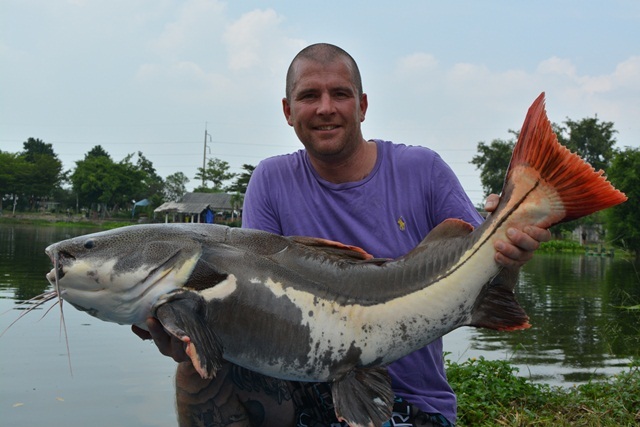 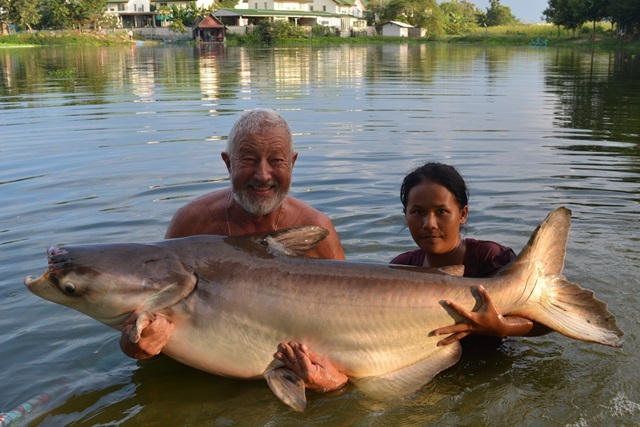 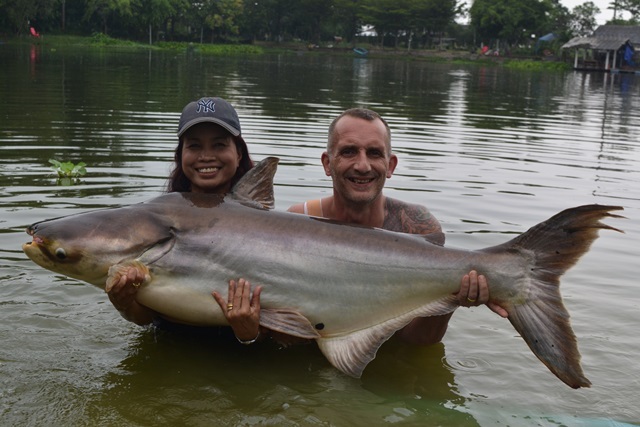 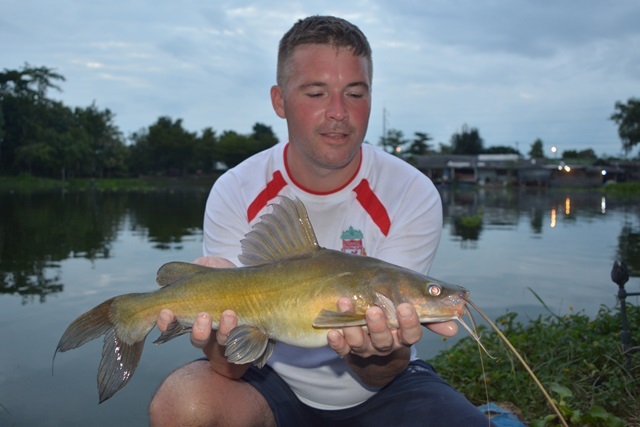 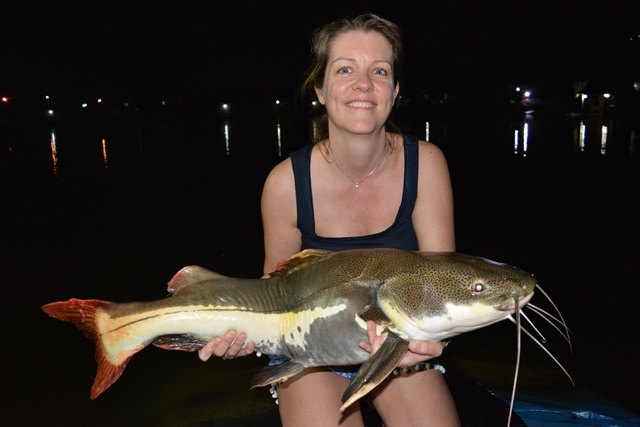 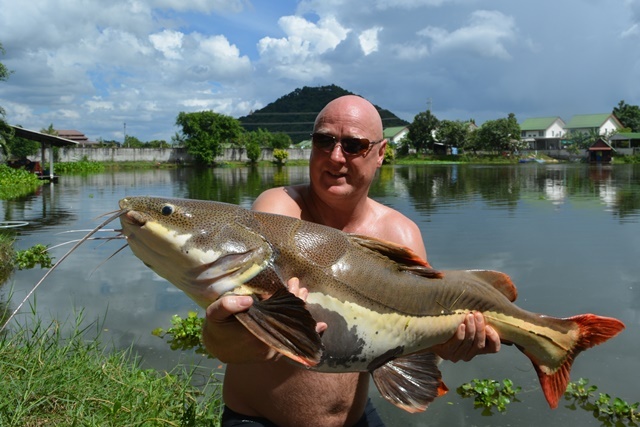 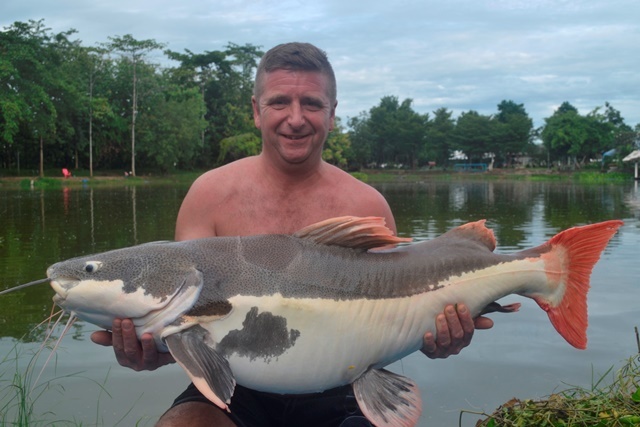 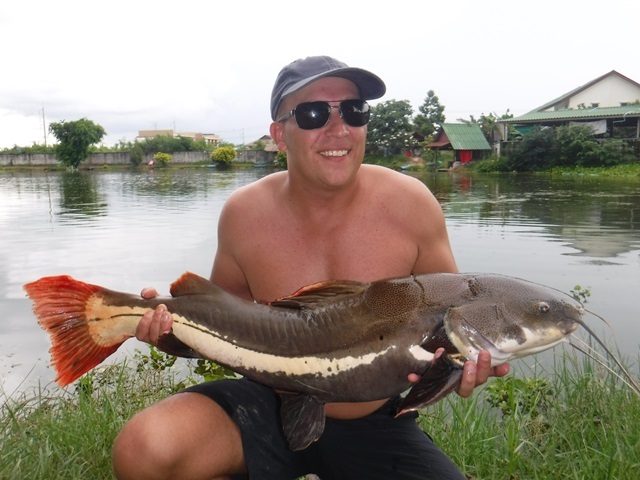 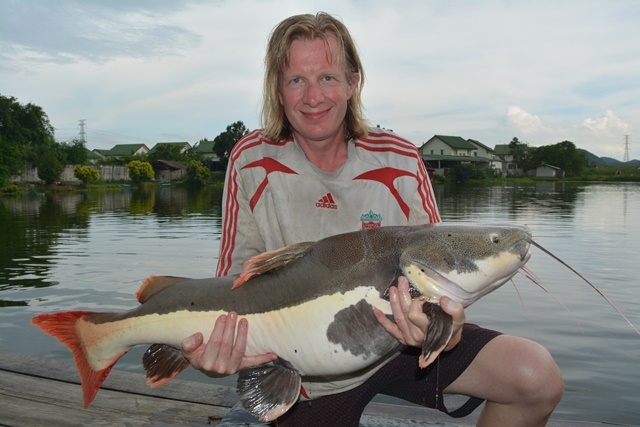 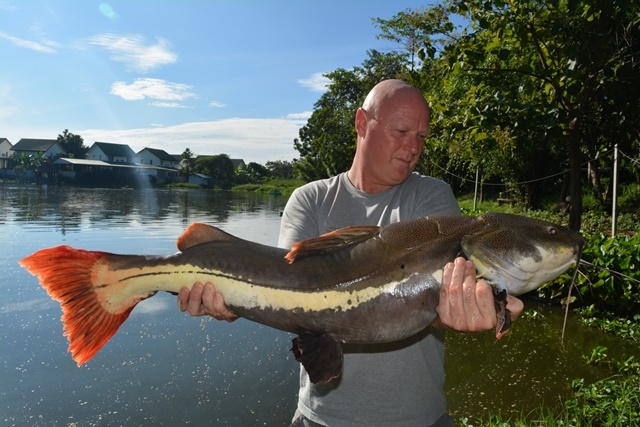 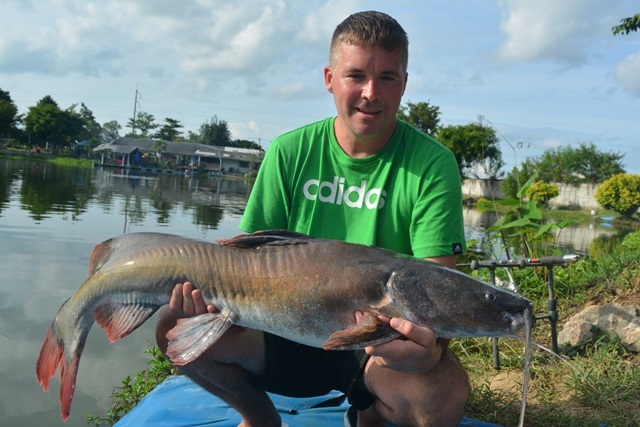 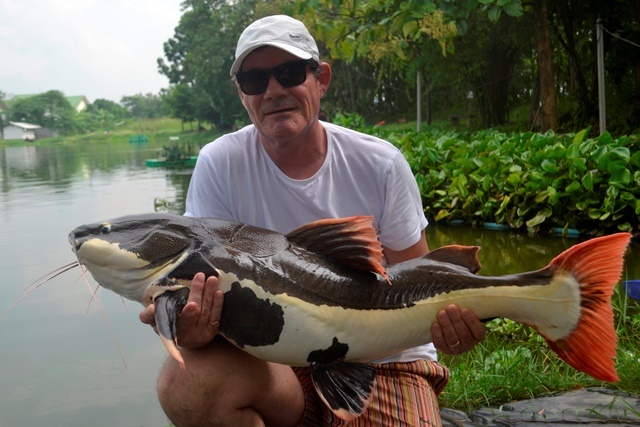 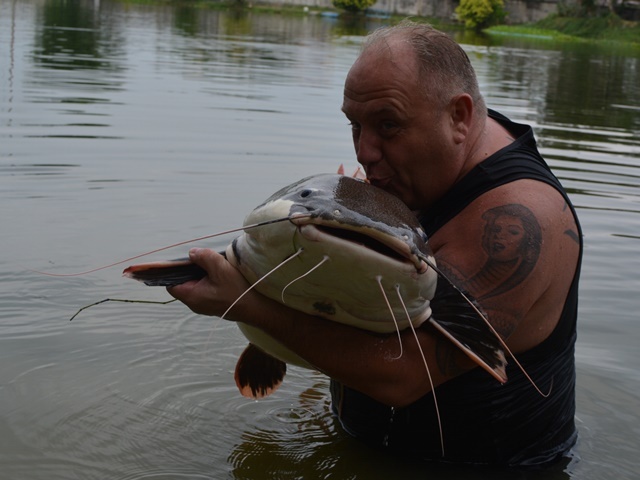 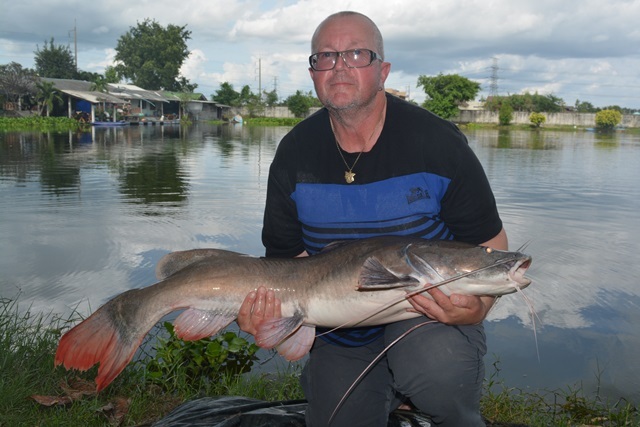 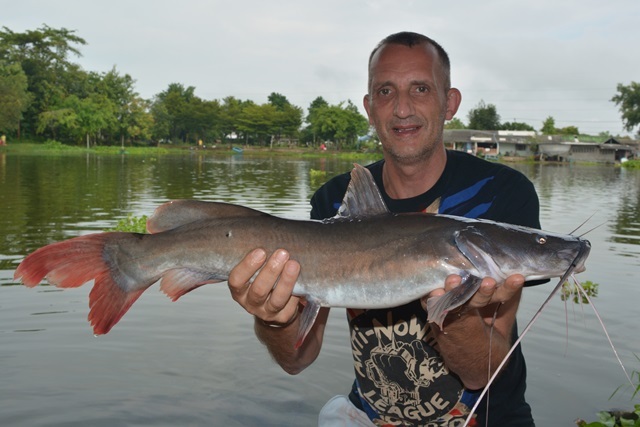 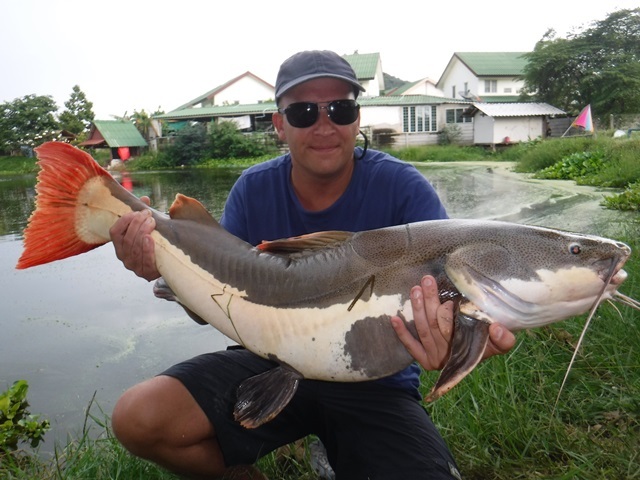 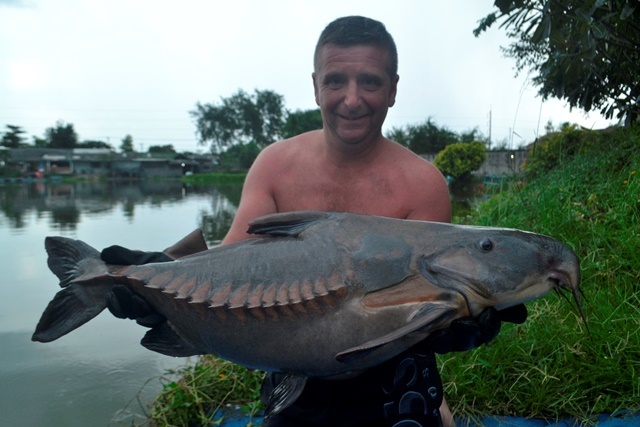 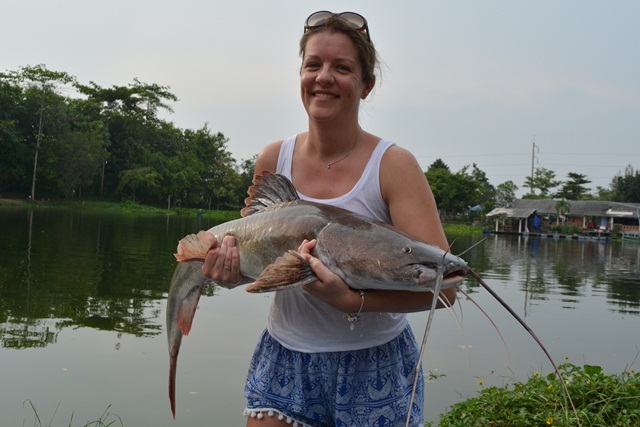 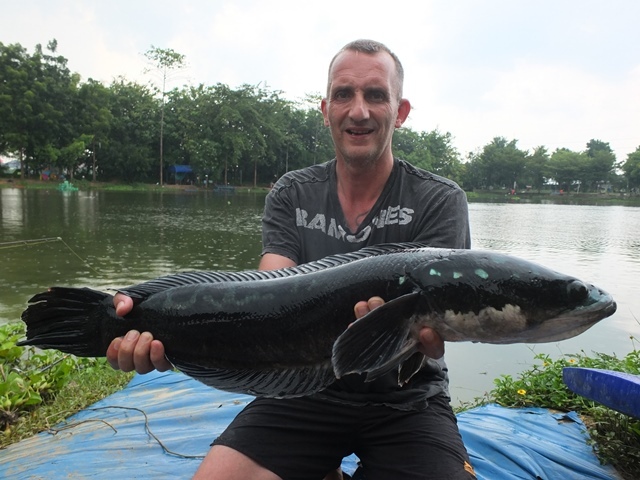 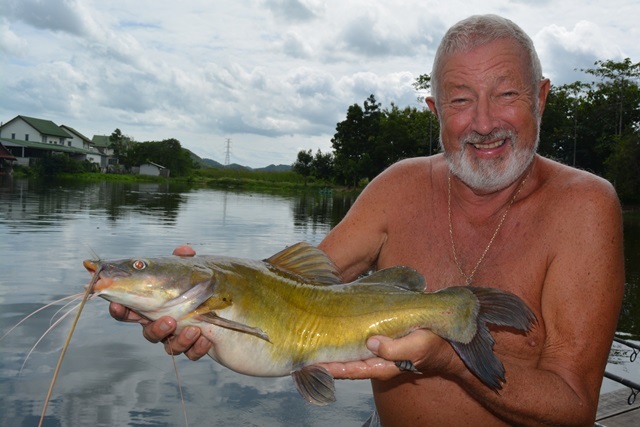 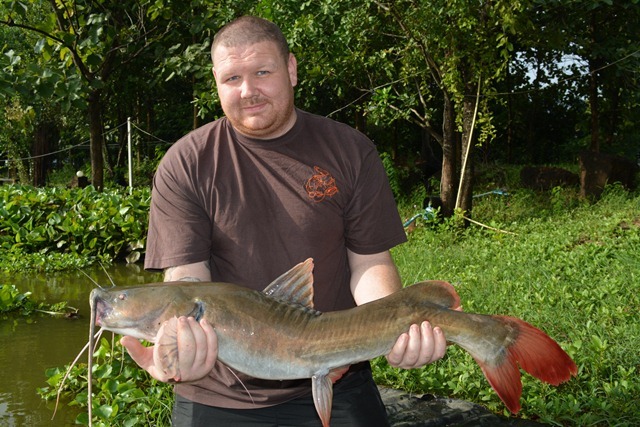 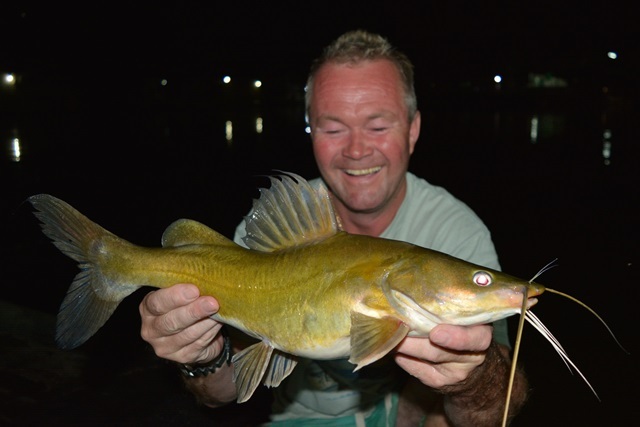 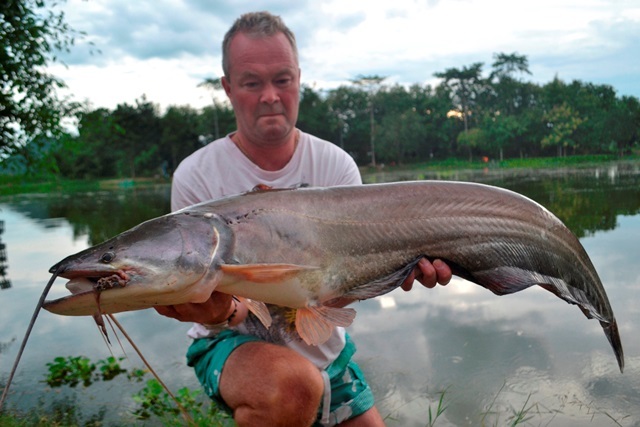 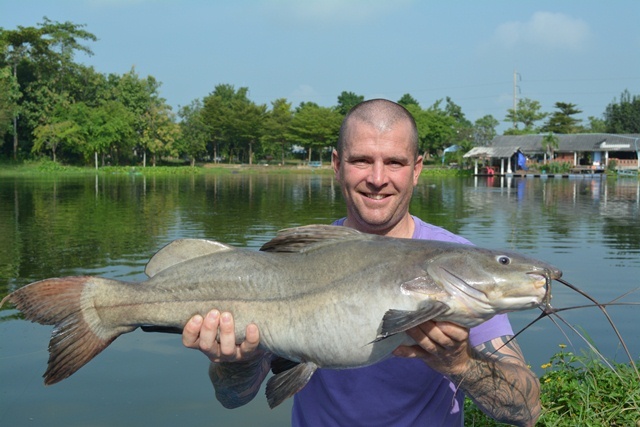 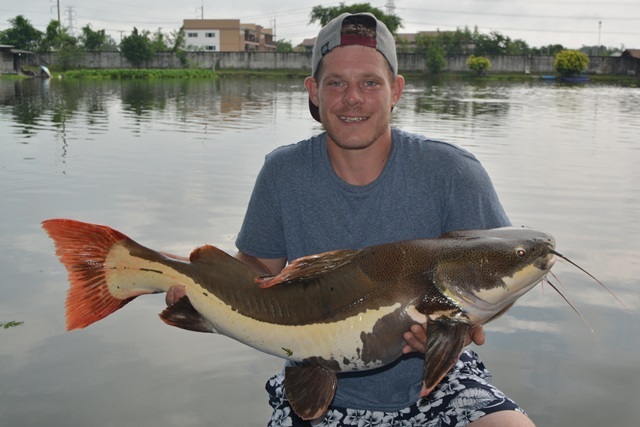 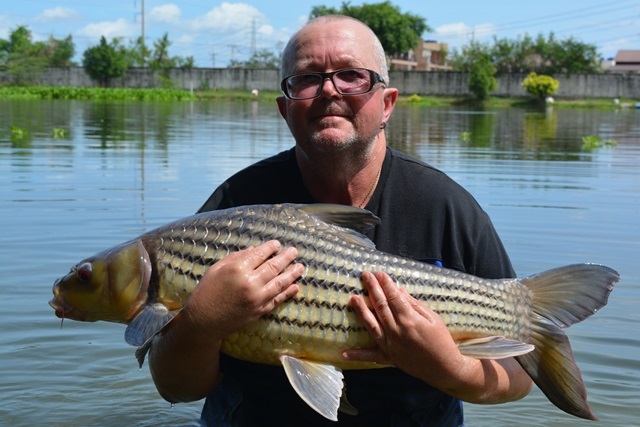 Pete Upperton was back this time accompanied by girlfriend Nikki Fahy and between them they landed some beauties that included Mekong catfish, tambaqui, Siamese carp, Chinese highfin catfish, African walking catfish as well as both Amazon and Thai redtails. 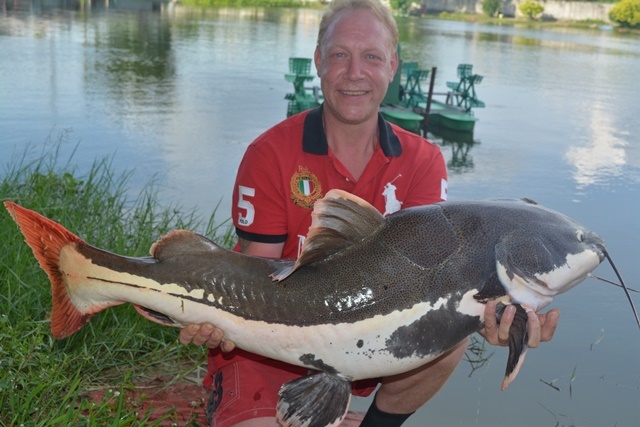 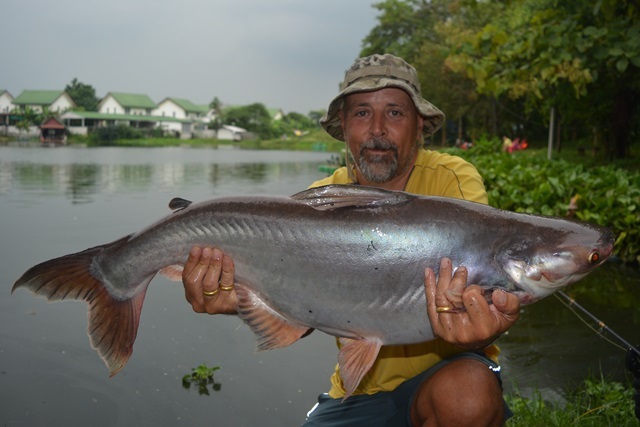 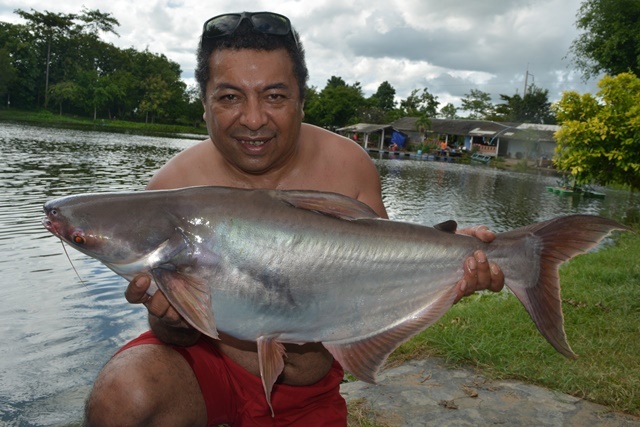 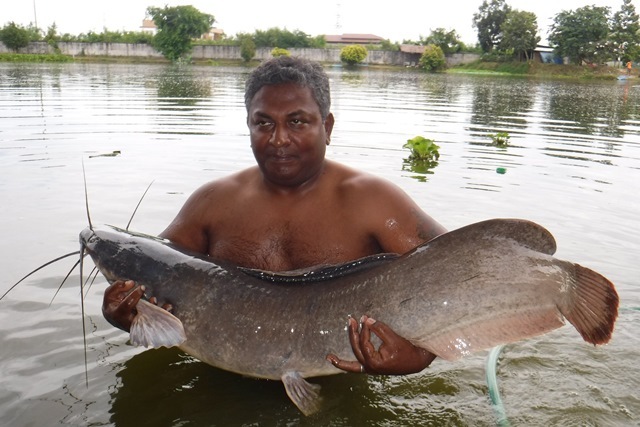 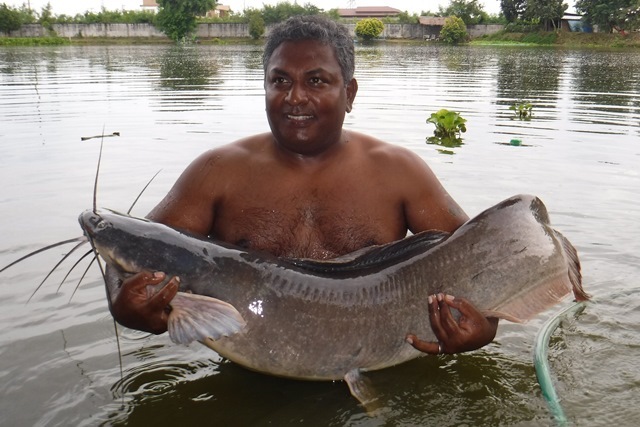 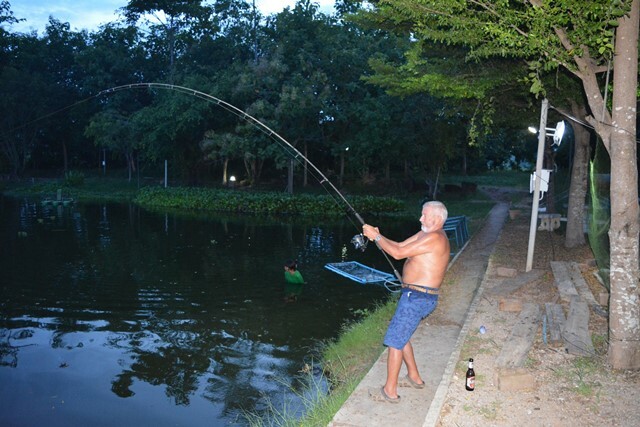 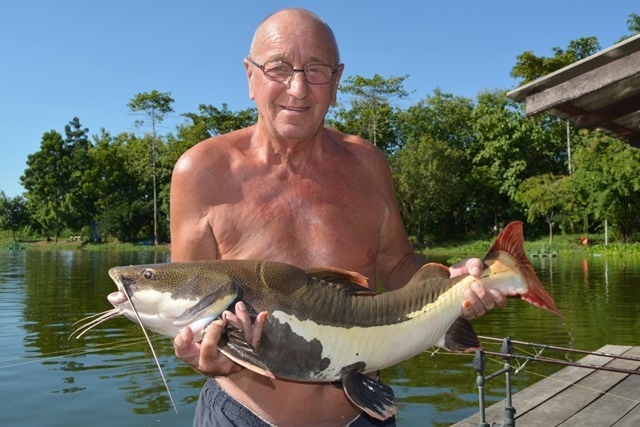 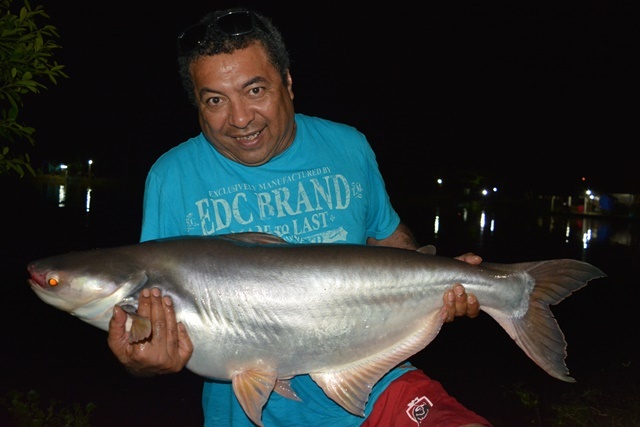 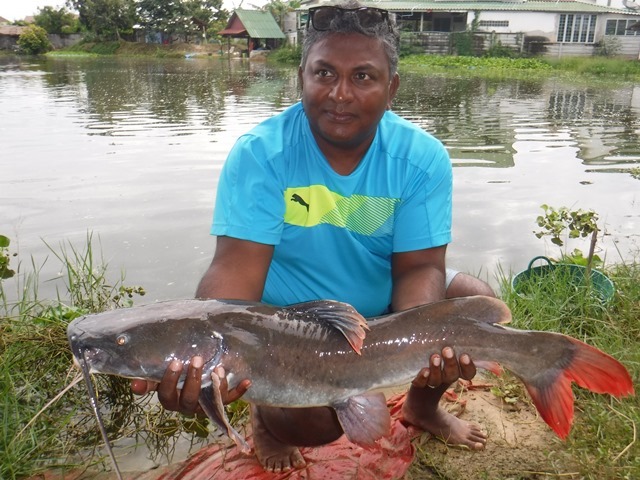 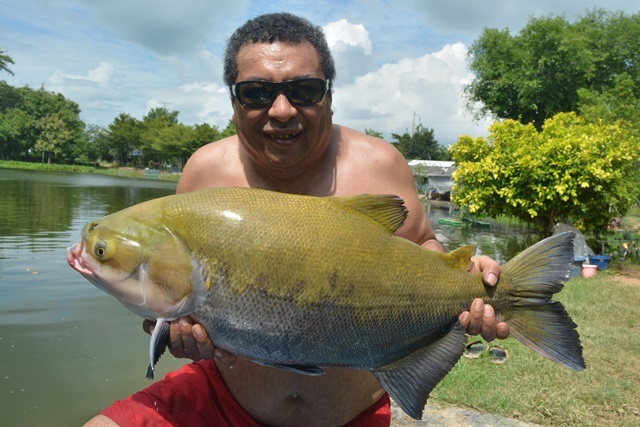 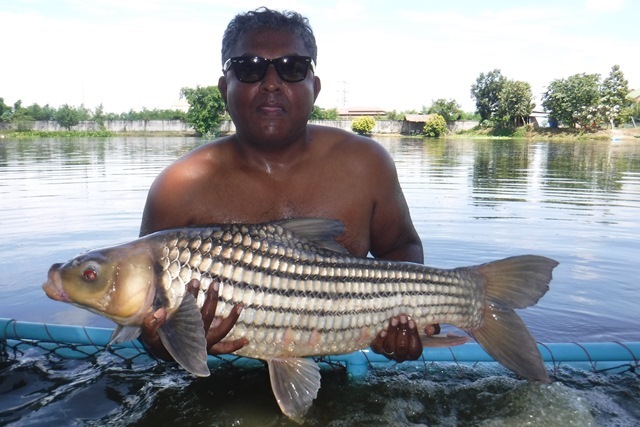 Nelson Philip also returned during the month landing some great catches that were topped by a 70lb vundu catfish, he also caught Juliens golden price carp, black shark minnow and Asian redtailed catfish. 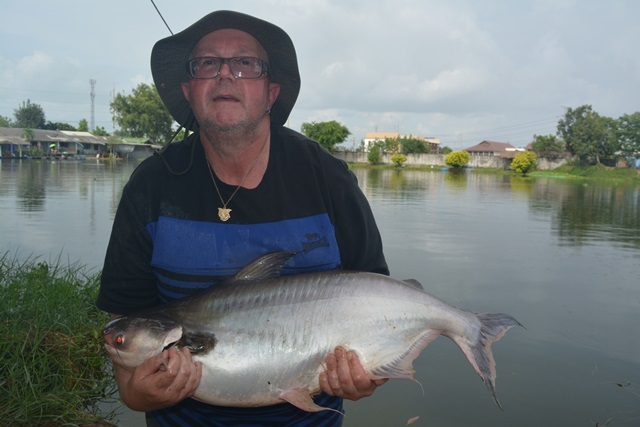 Unfortunately Nigel Mallalieu session was cut short due to an allergic reaction to mosquito bites on his hands which left him unable to grip the rod due to the extreme swelling. 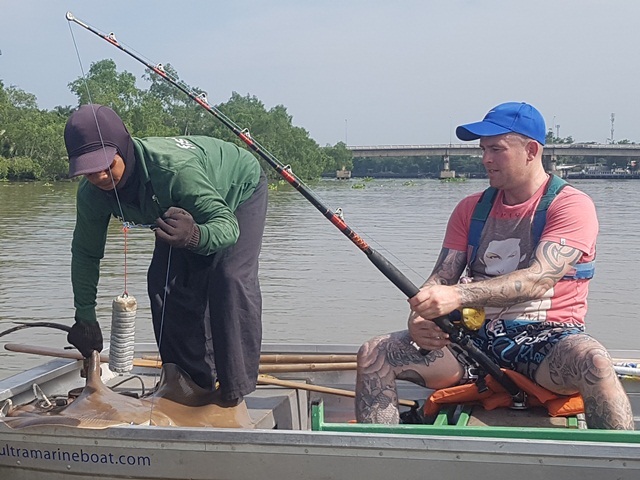 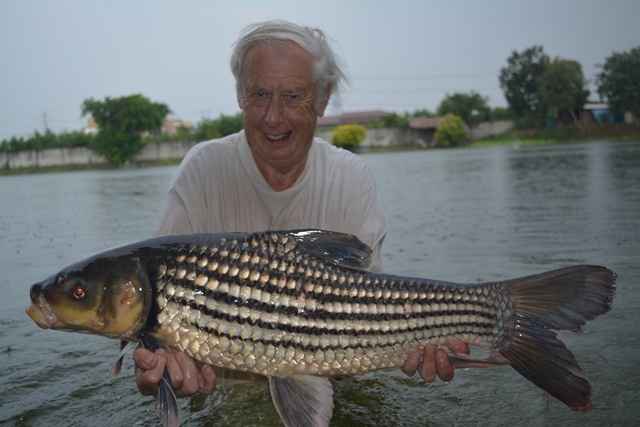 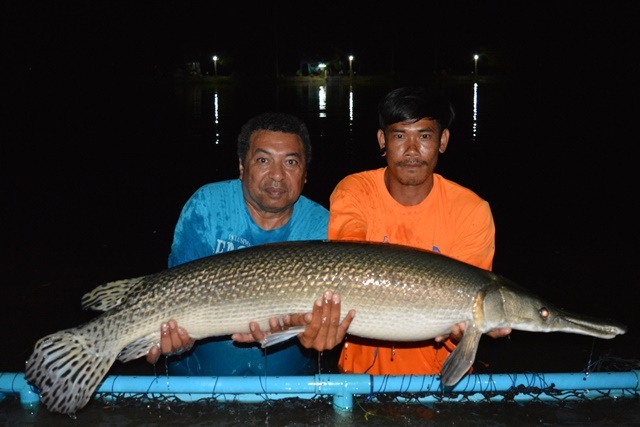 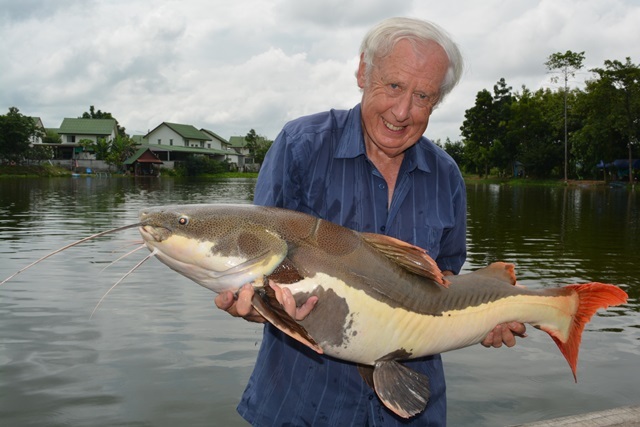 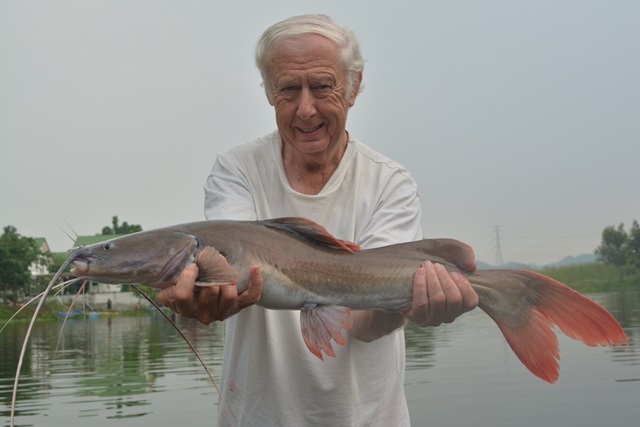 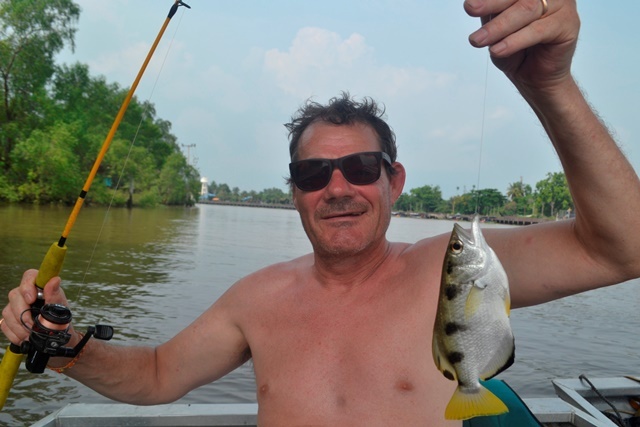 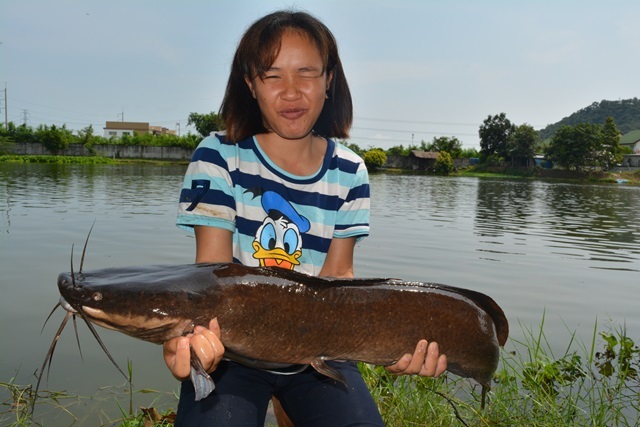 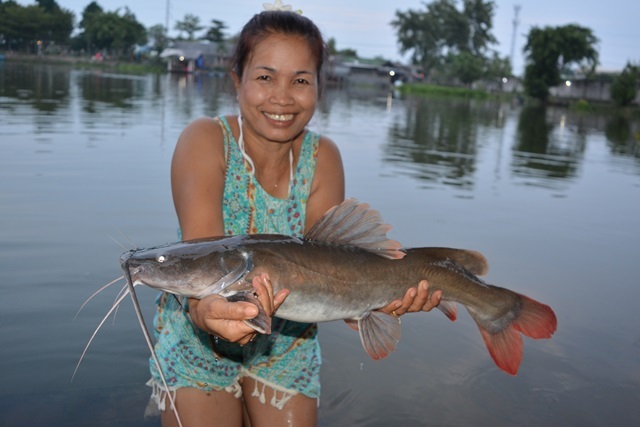 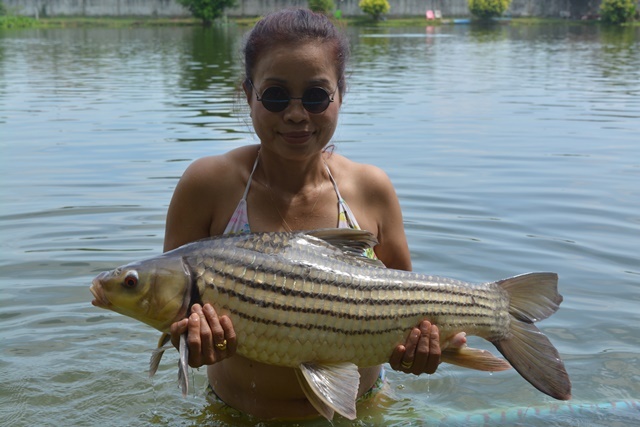 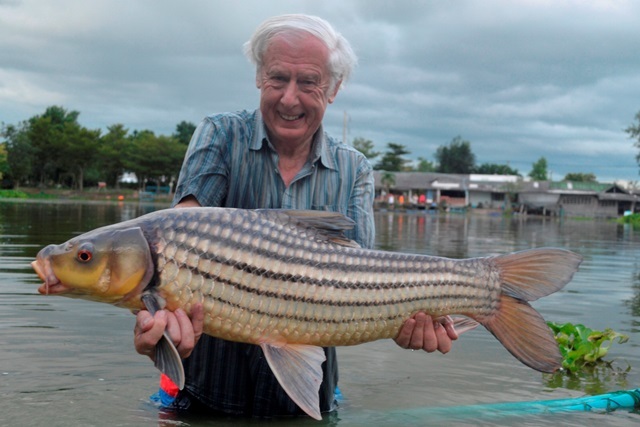 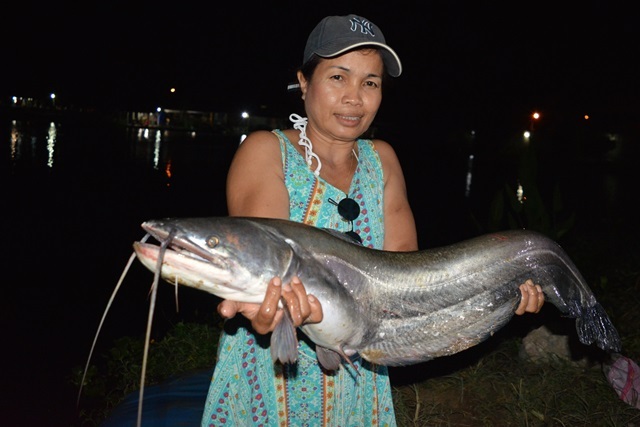 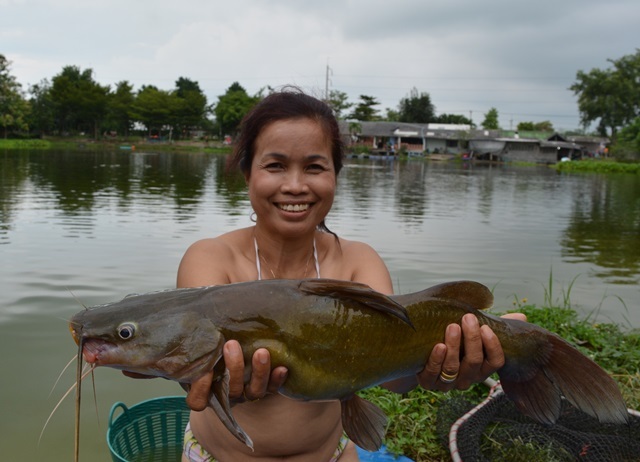 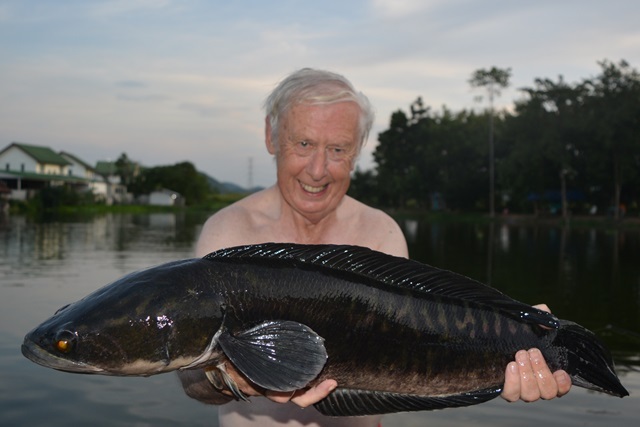 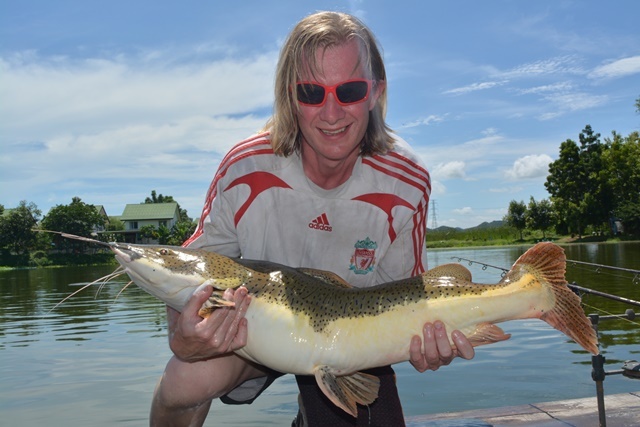 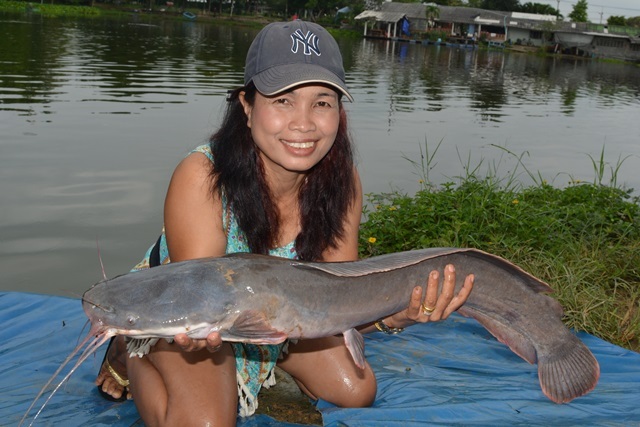 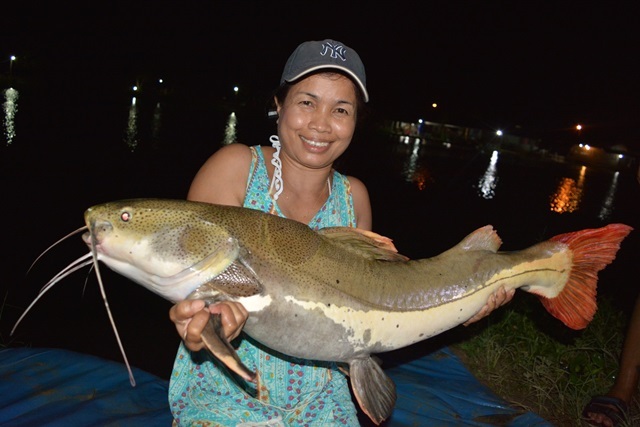 However, he still managed to catch some nice fish that included Mekong catfish, rohu, striped catfish as well as both Amazon and Thai redtails. 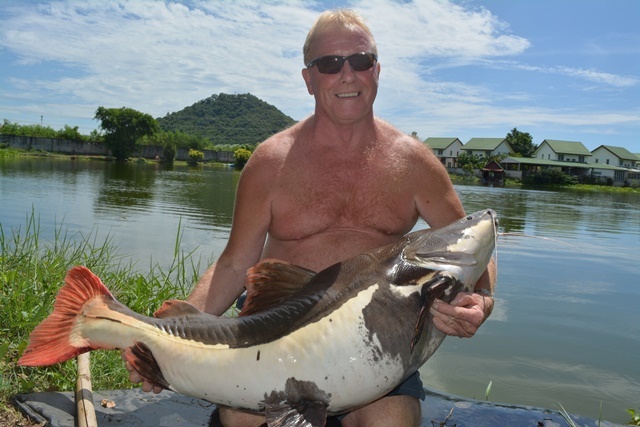 Palm Tree regular Neil Hobson was back and after a slow start finished off strongly with Mekong catfish to a 170lb and Siamese carp to 135lb. 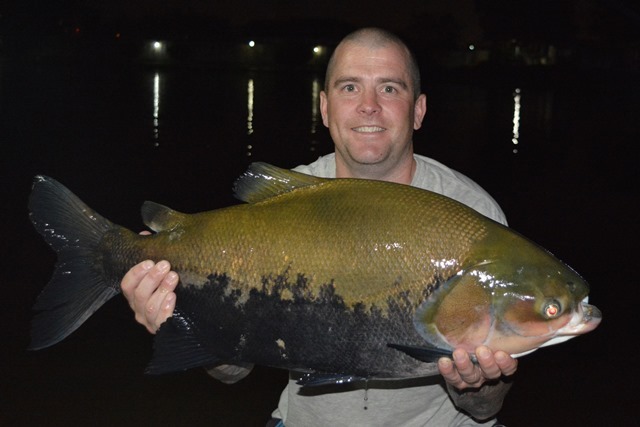 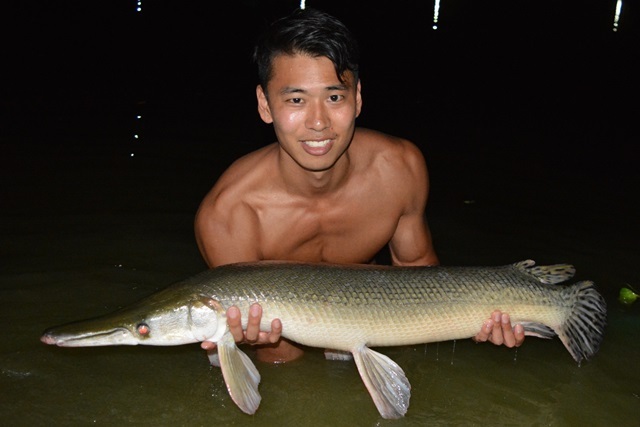 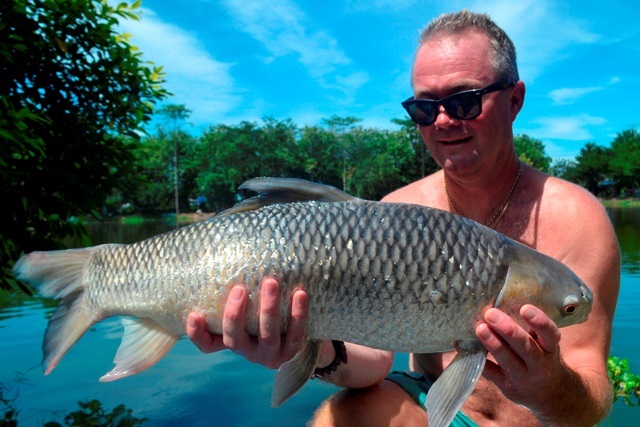 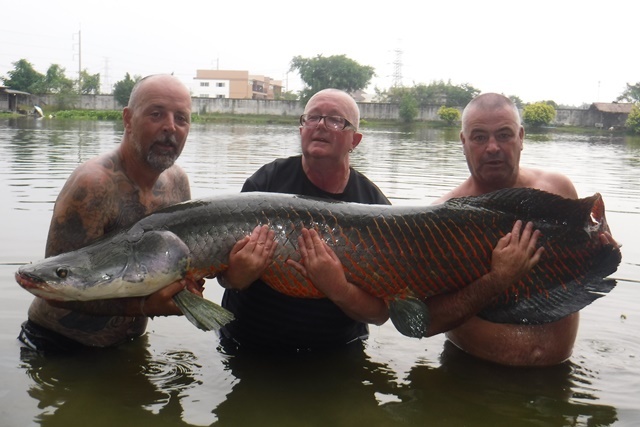 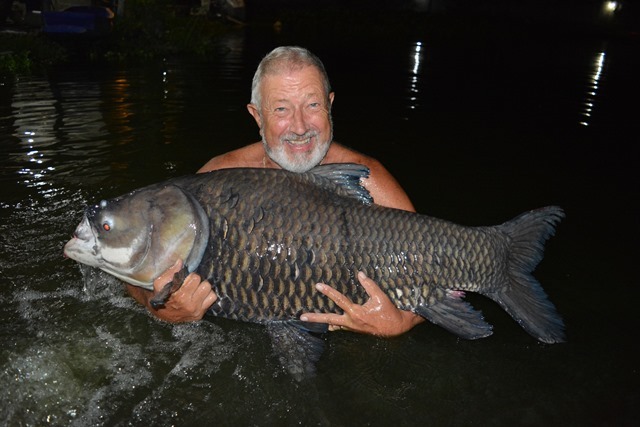 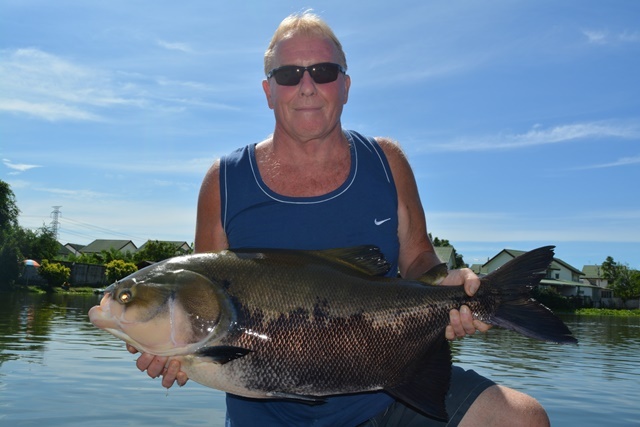 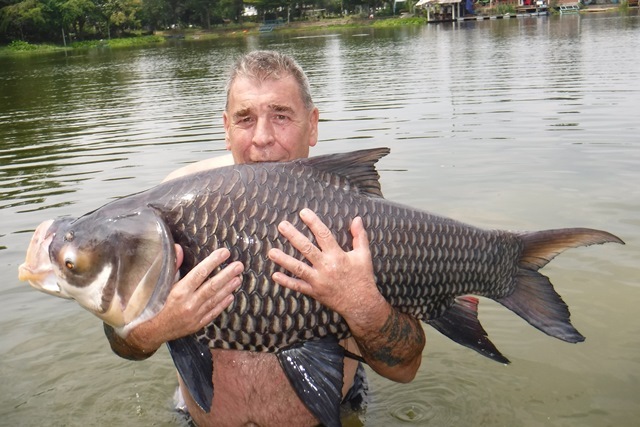 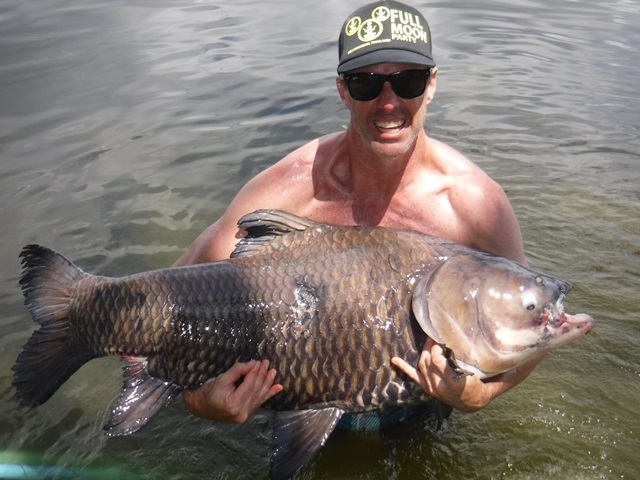 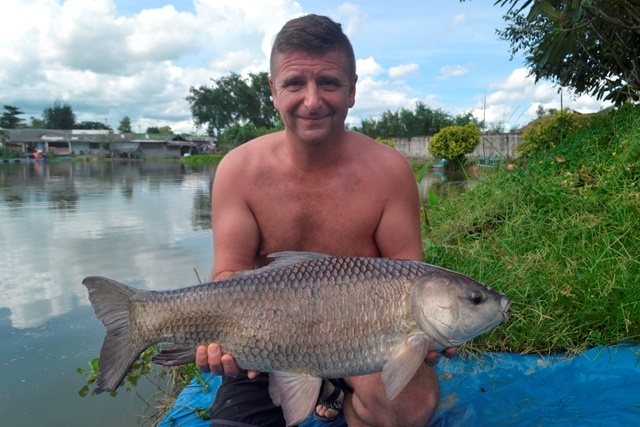 Chris Edwards and his fishing mate from Hong Kong has their first session at Palm Tree during the month catching a nice Chinese black carp as well as alligator gar, Mekong catfish and rohu. 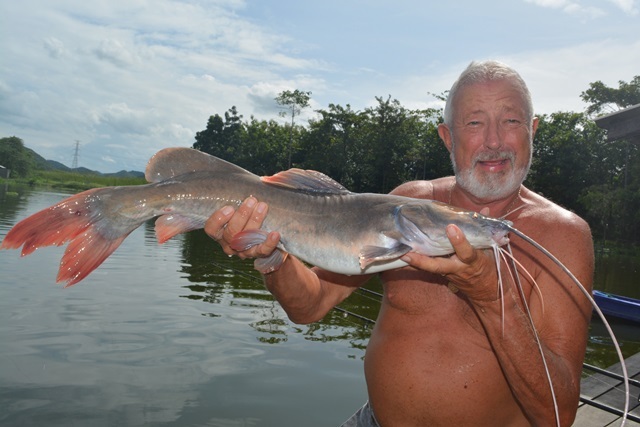 Dave Miller accompanied Gary Redhead for his first visit to Palm Tree catching some nice fish that included arapaima, Juliens golden price carp, wallago attu, black ear catfish and Asian redtailed catfish. 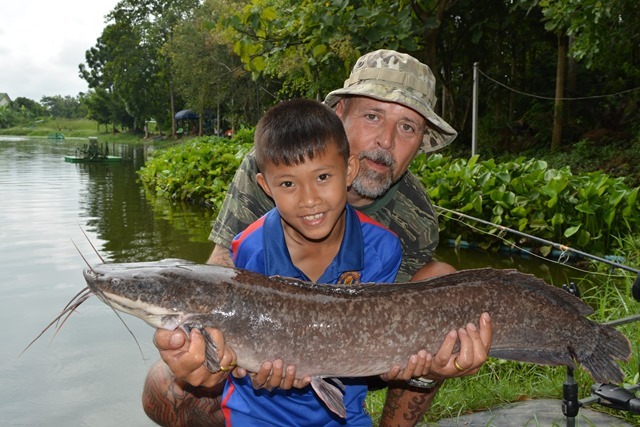 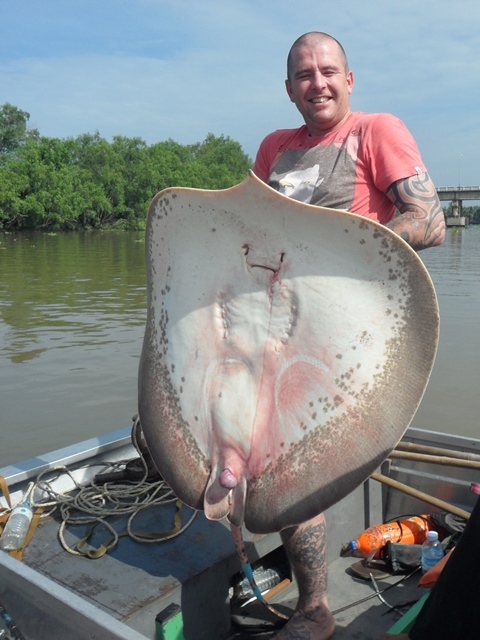 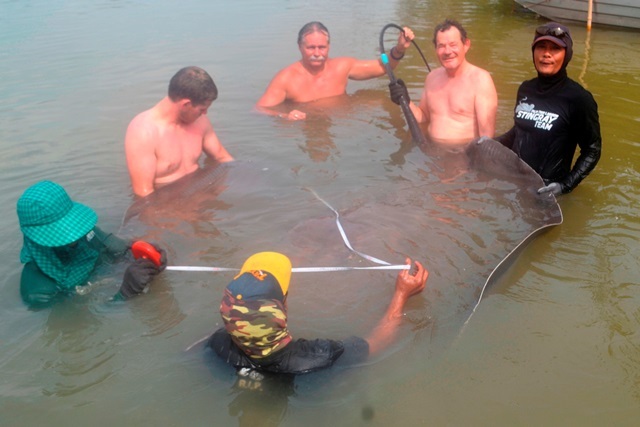 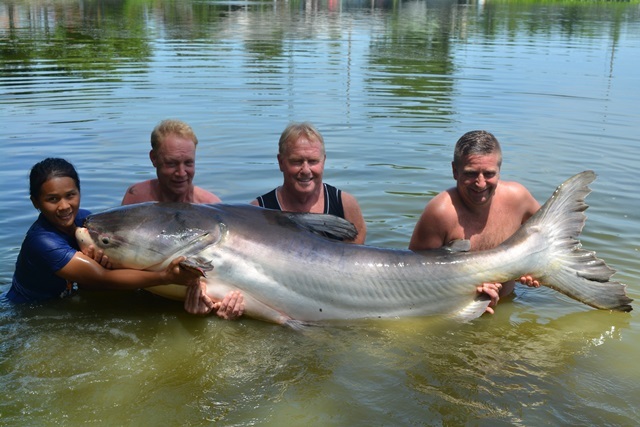 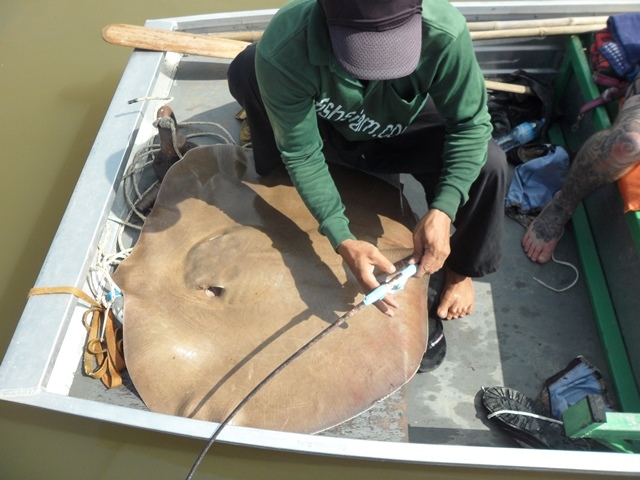 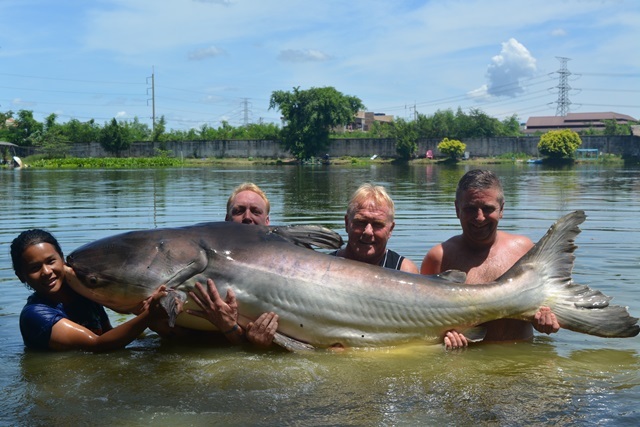 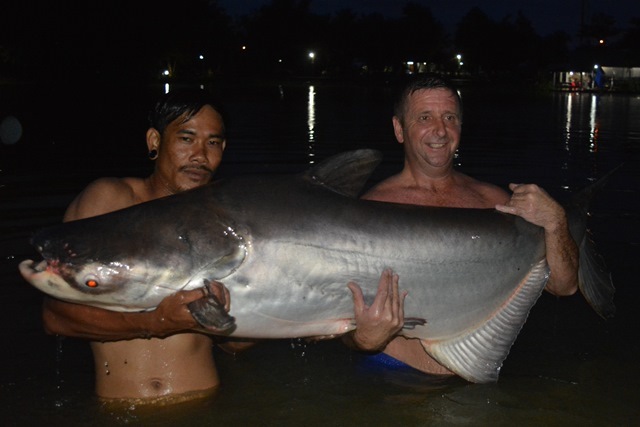 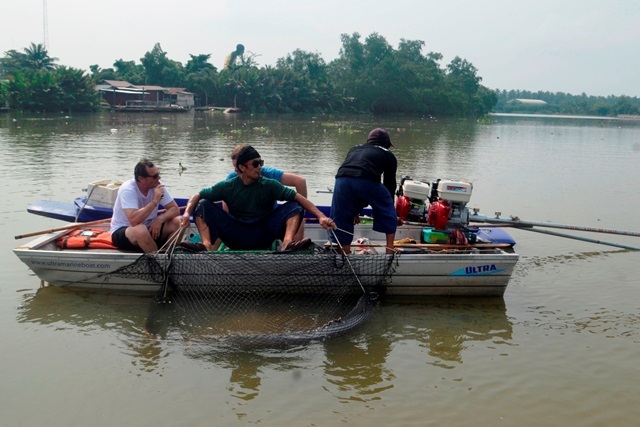 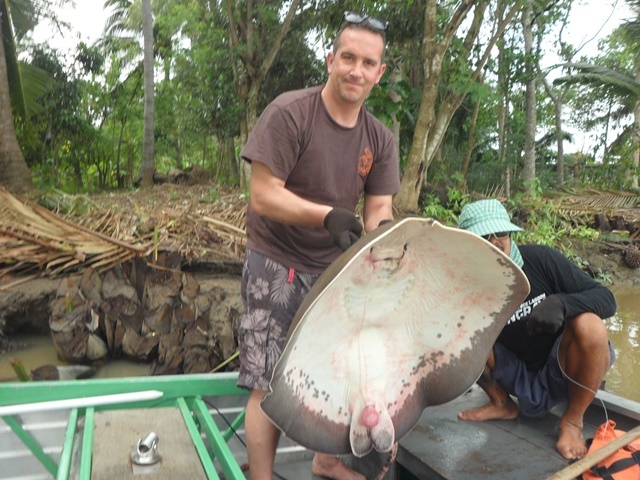 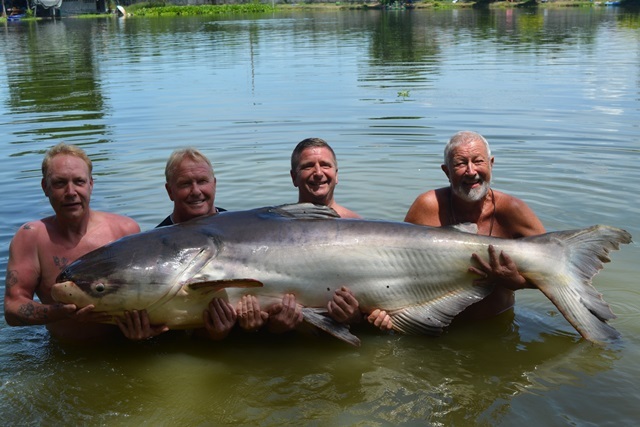 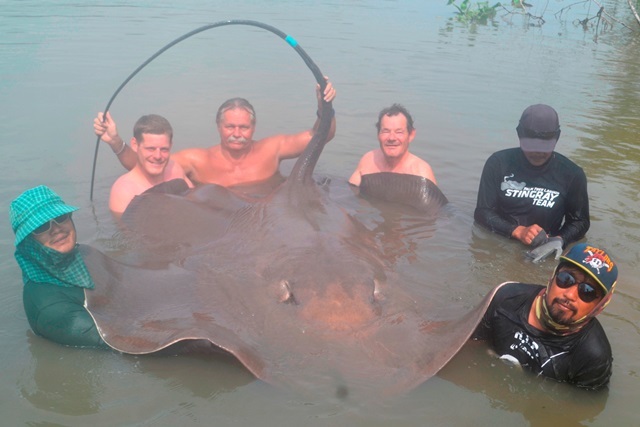 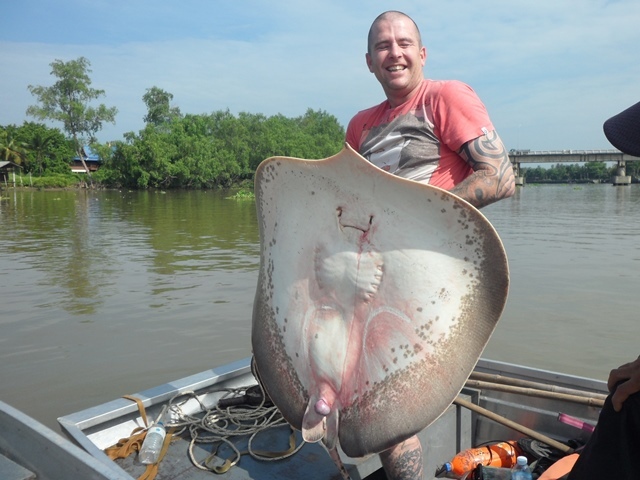 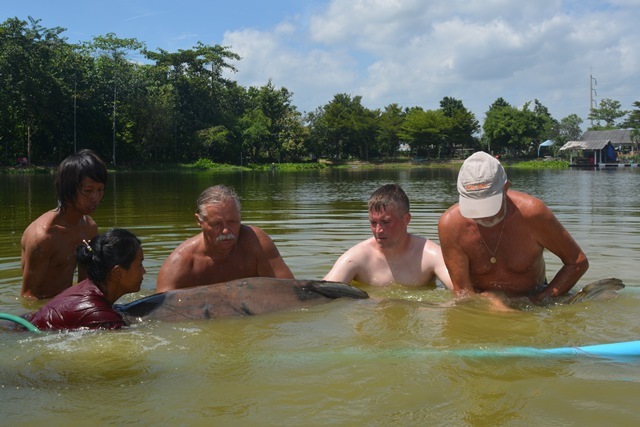 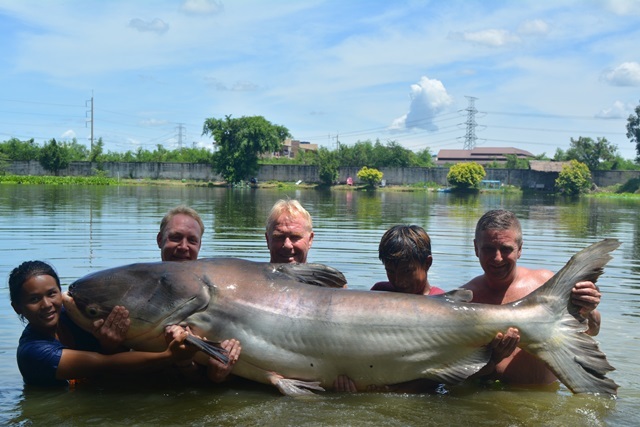 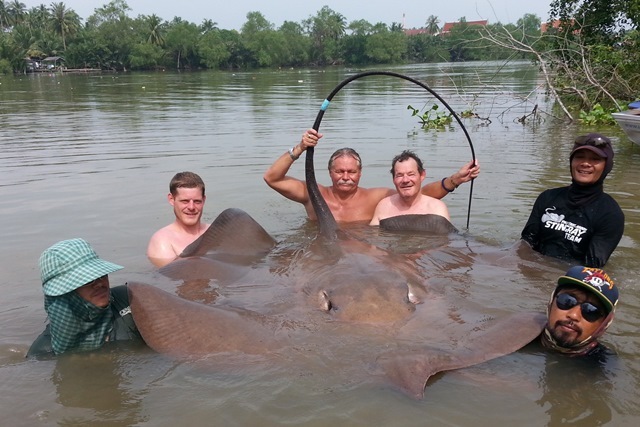 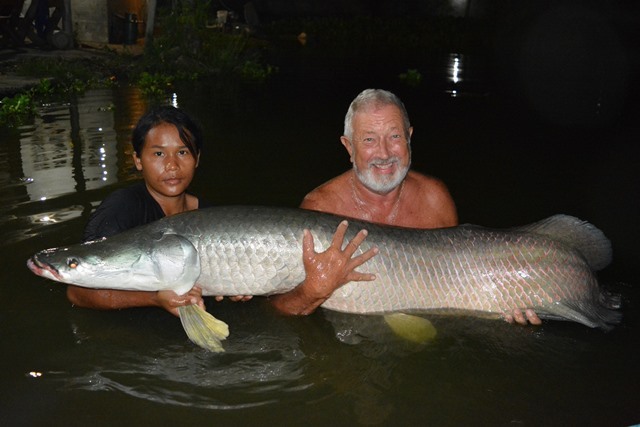 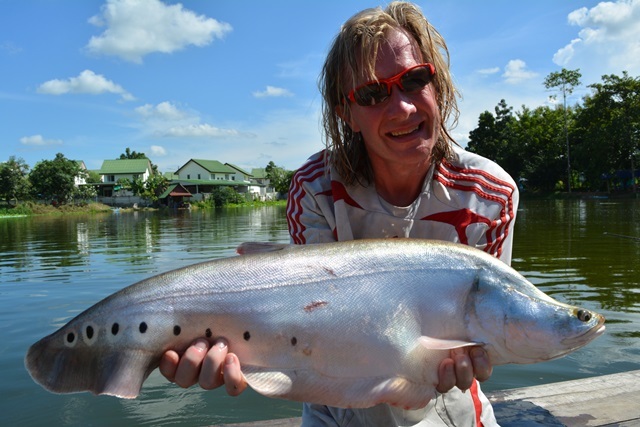 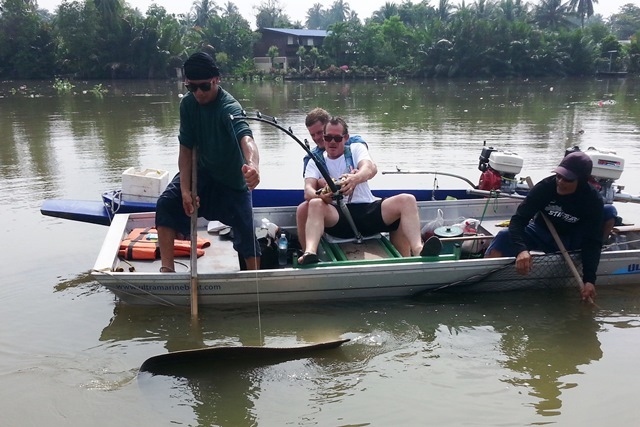 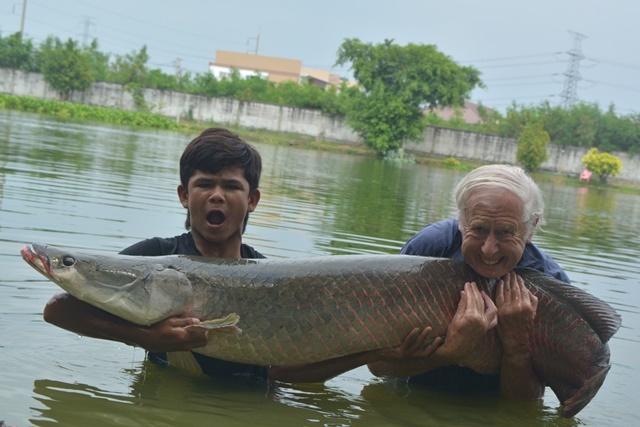 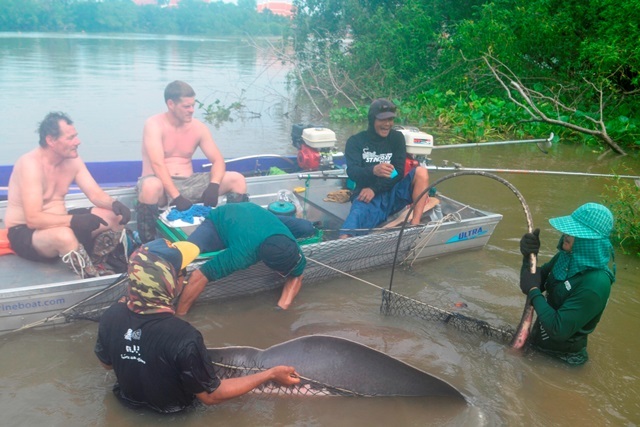 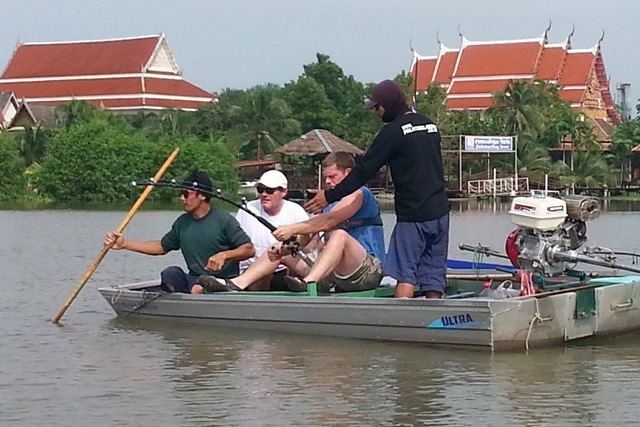 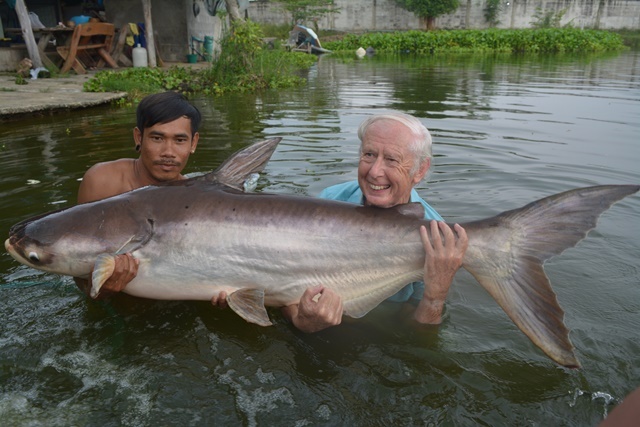 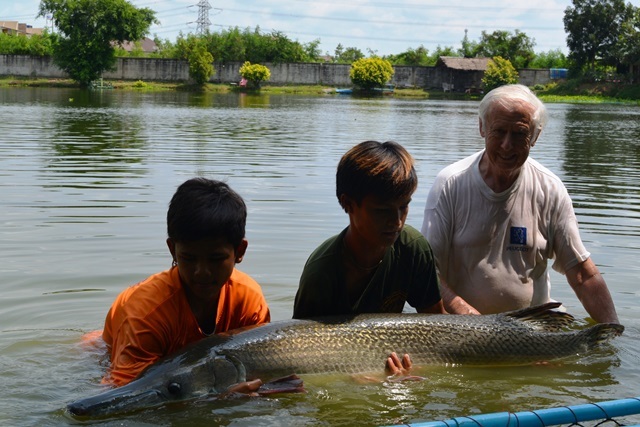 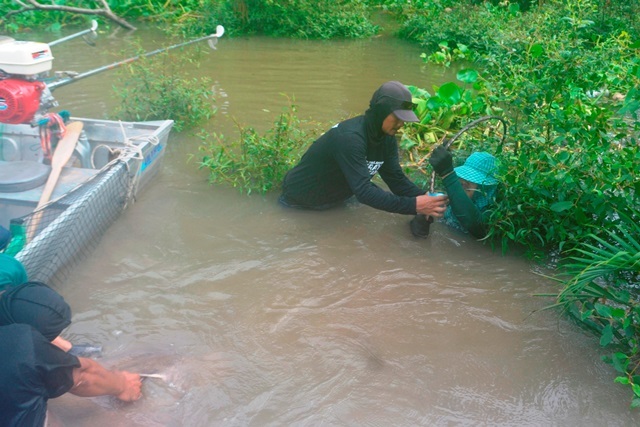 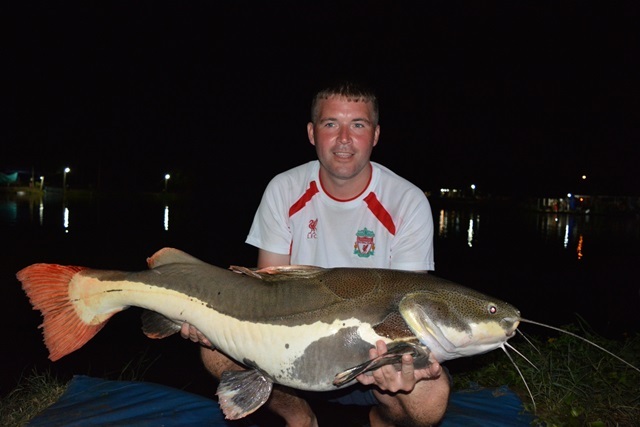 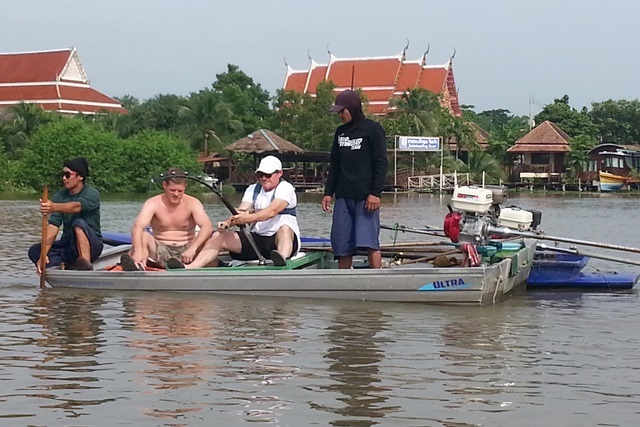 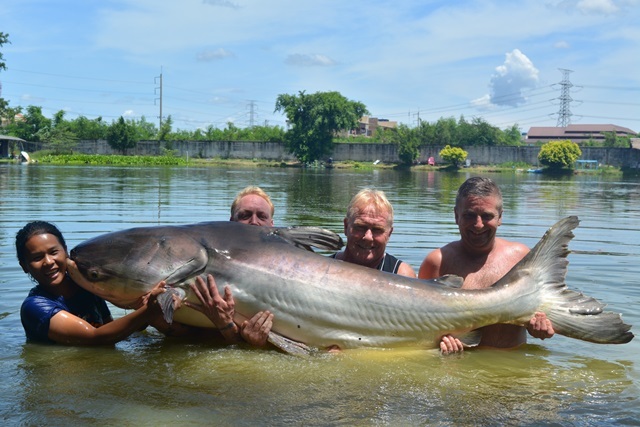 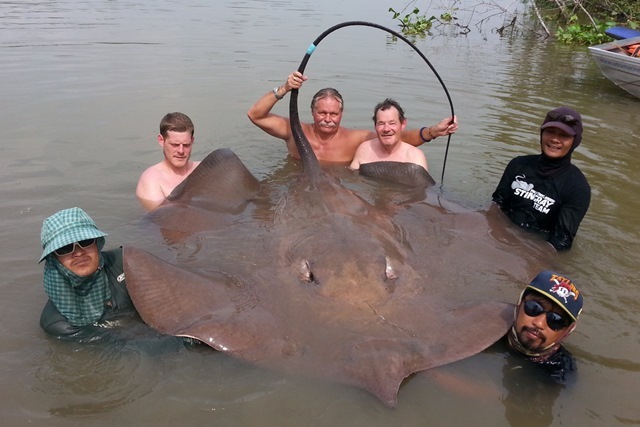 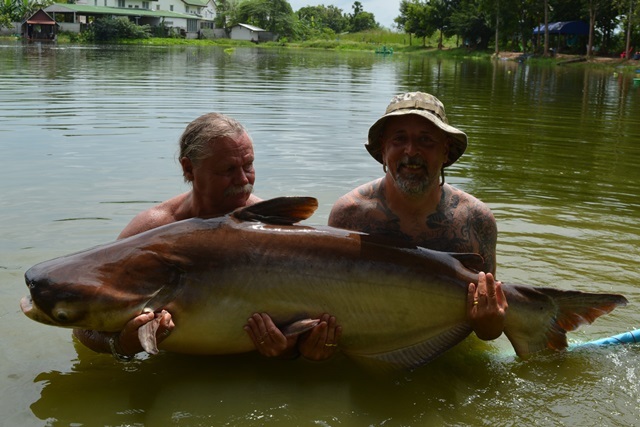 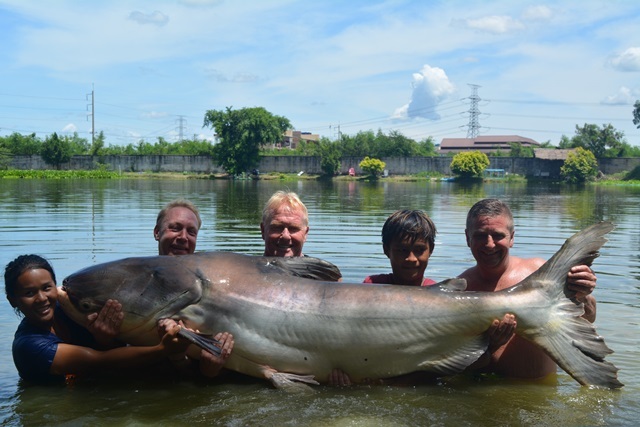 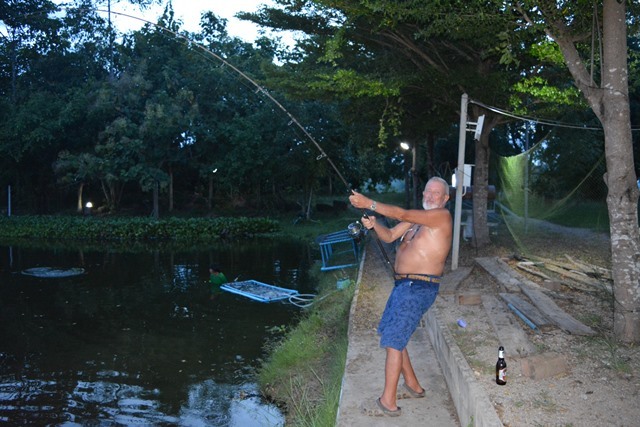 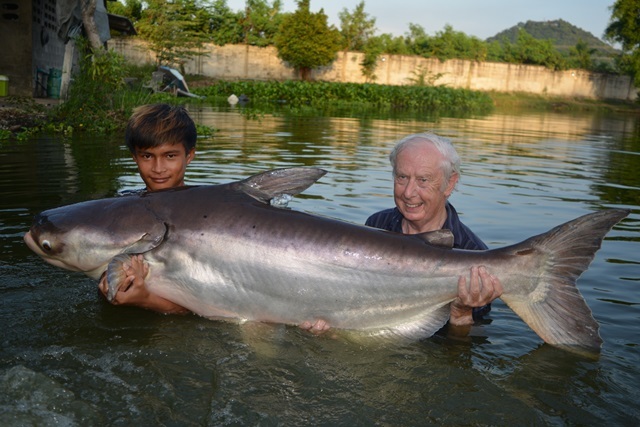 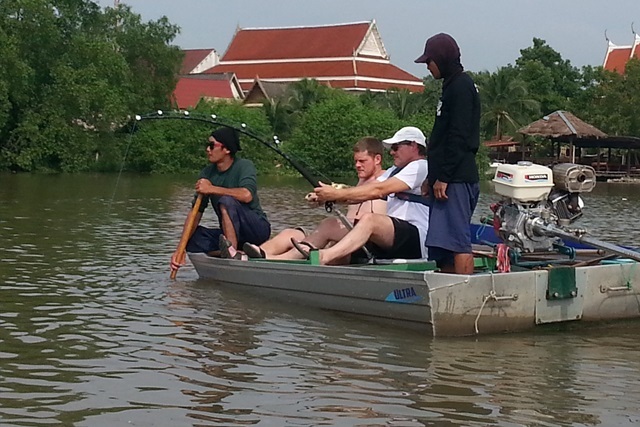 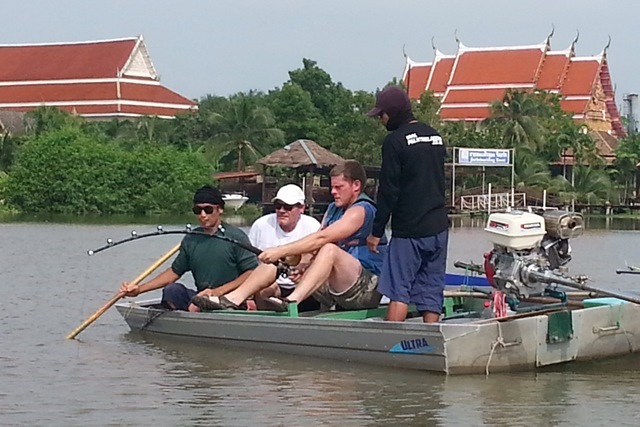 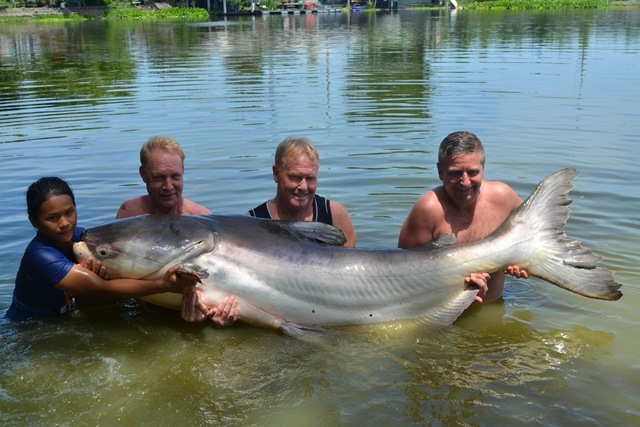 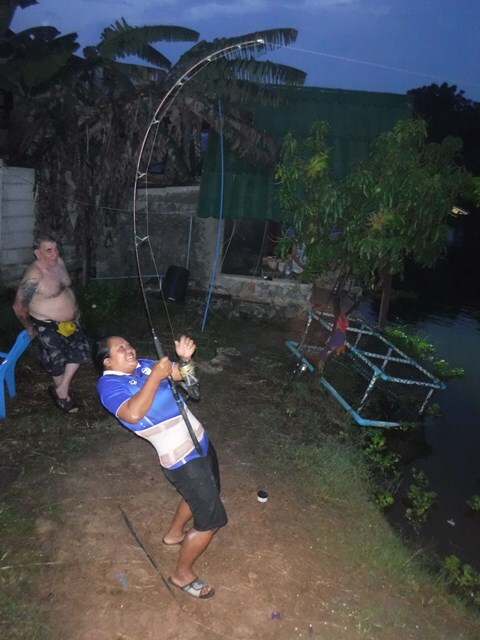 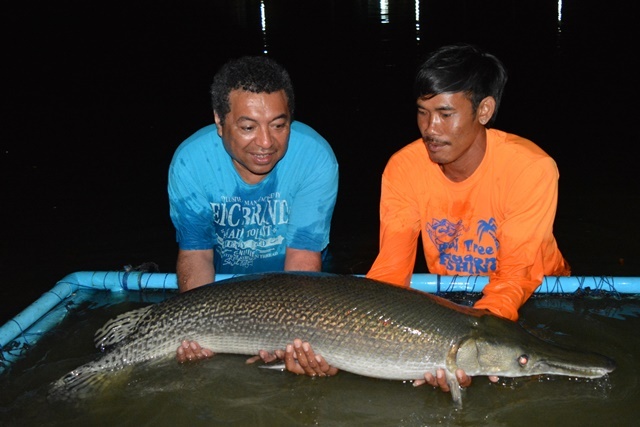 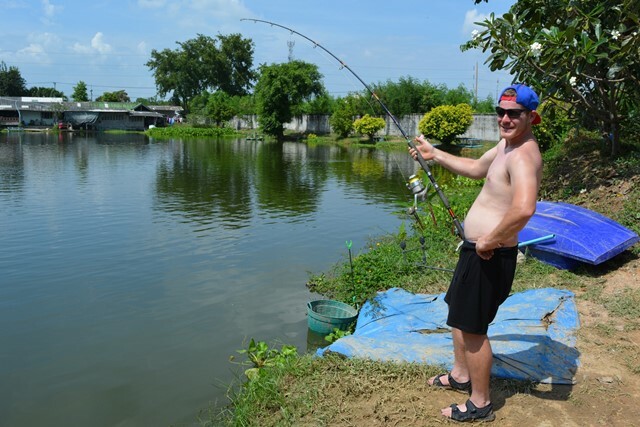 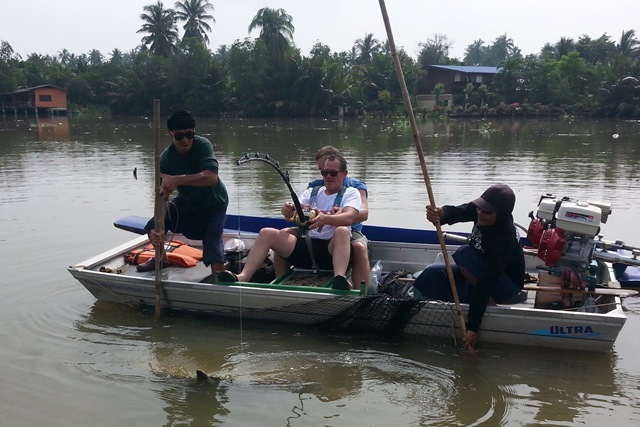 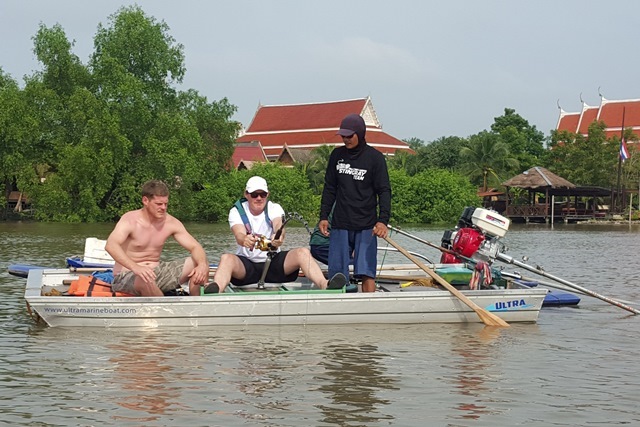 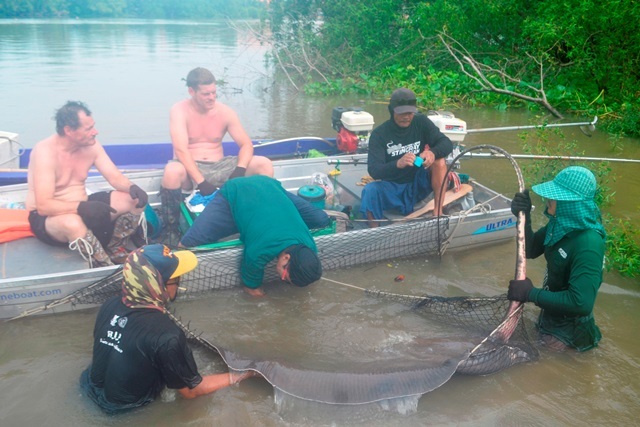 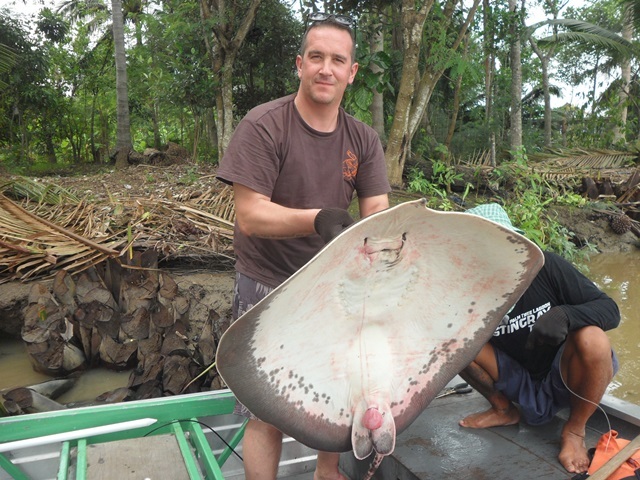 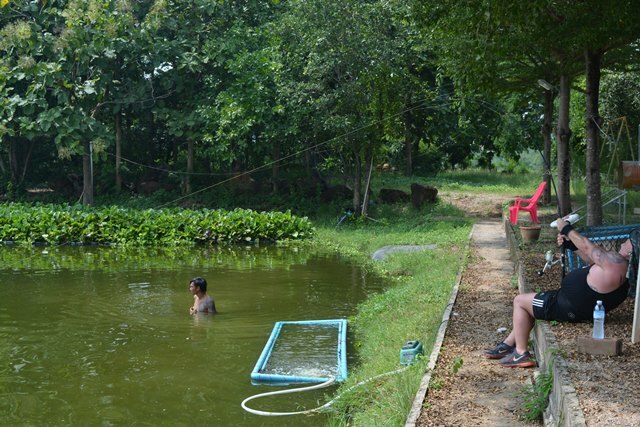 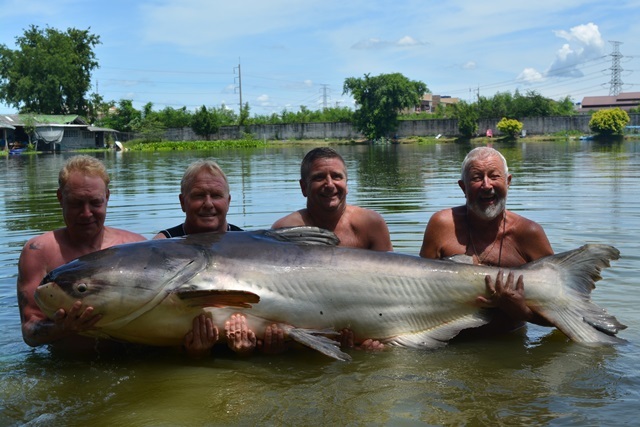 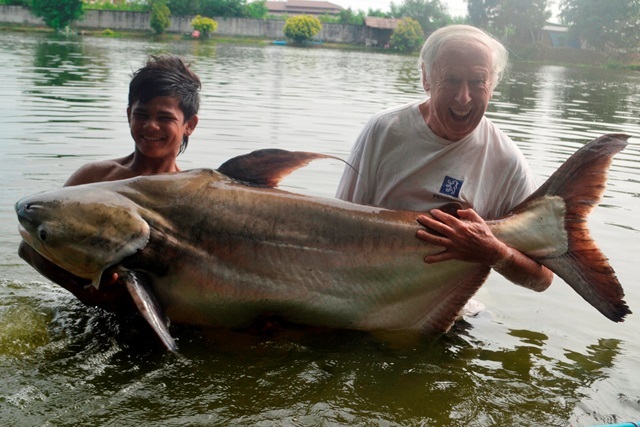 Gordon Rennie and Marcus Denton tried there hand at fishing for giant freshwater stingray on the Mae Klong river. 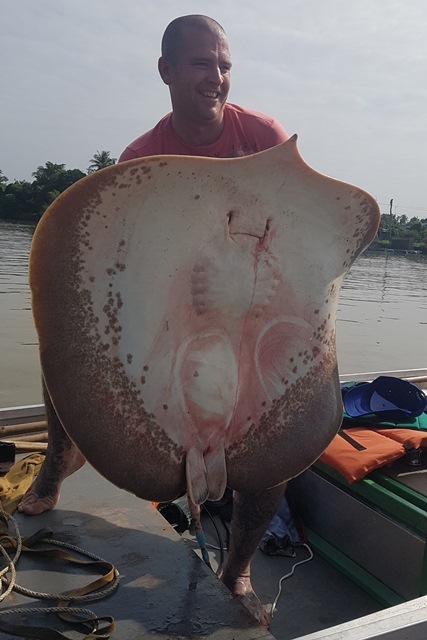 Only a small one this time but they still had a good day all the same. 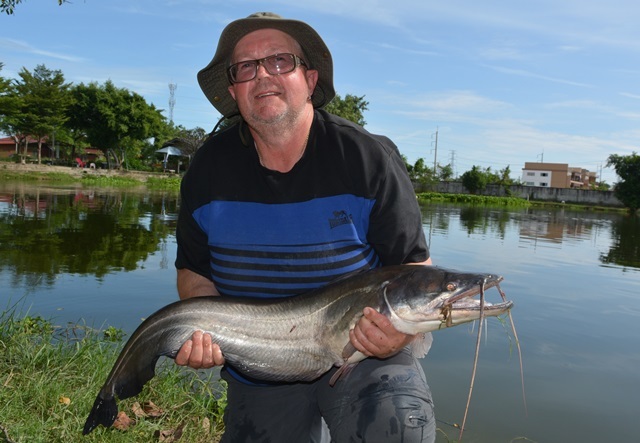 Gavin Williams looked happy with his catches of black ear catfish, rohu, striped catfish as well as both Amazon and Asian redtails. 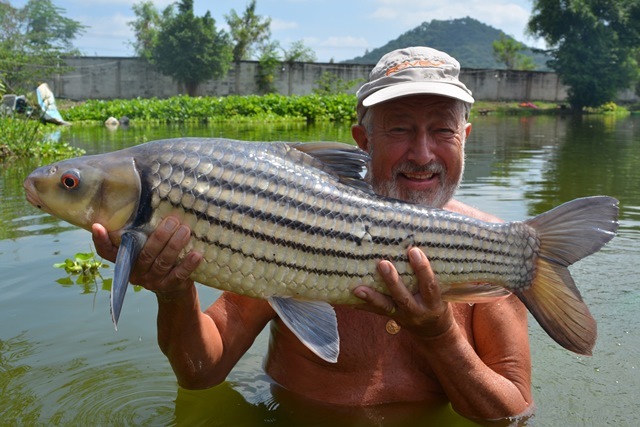 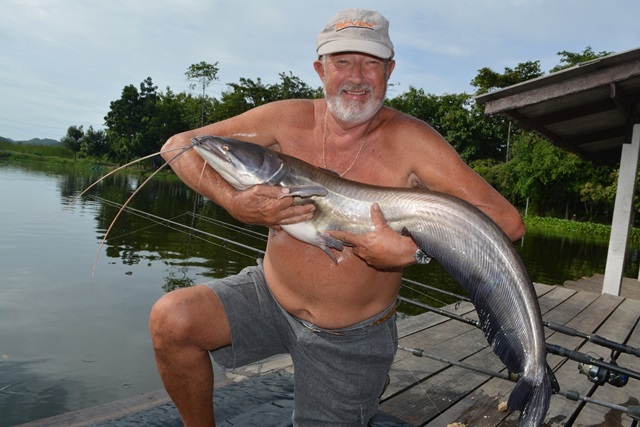 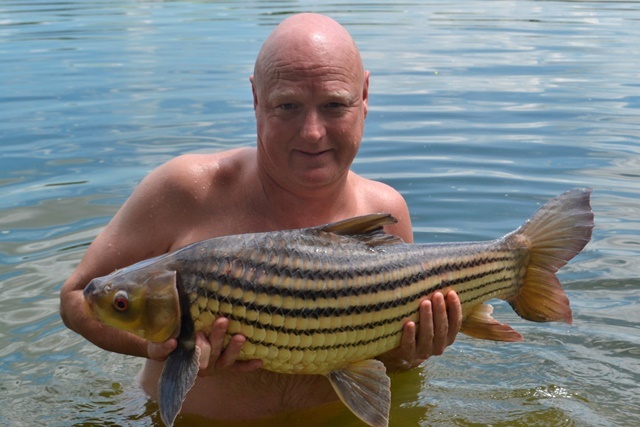 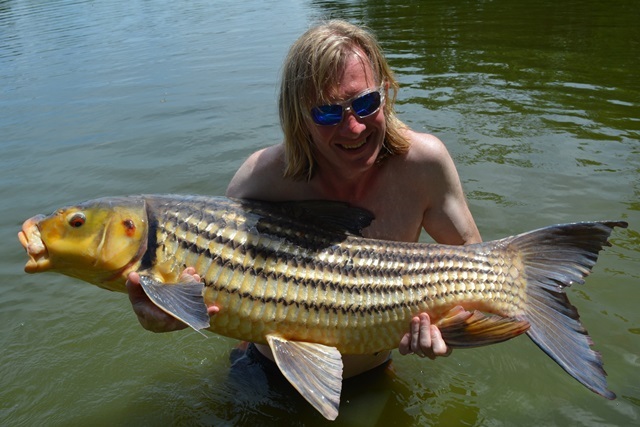 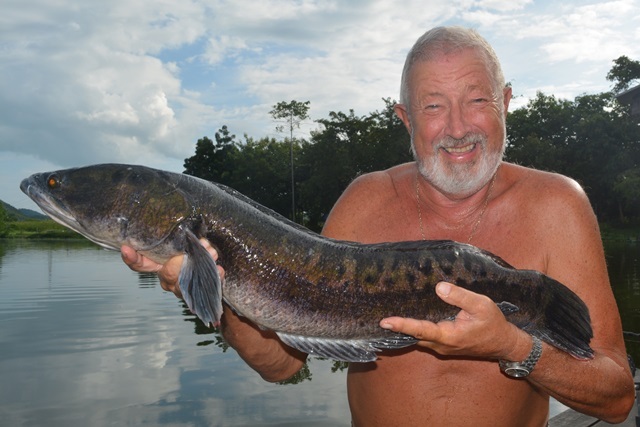 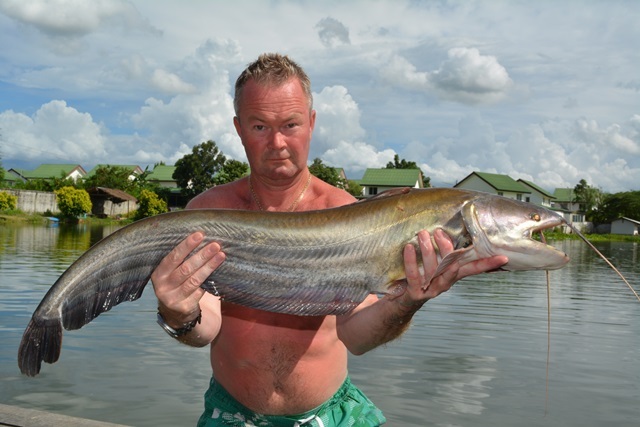 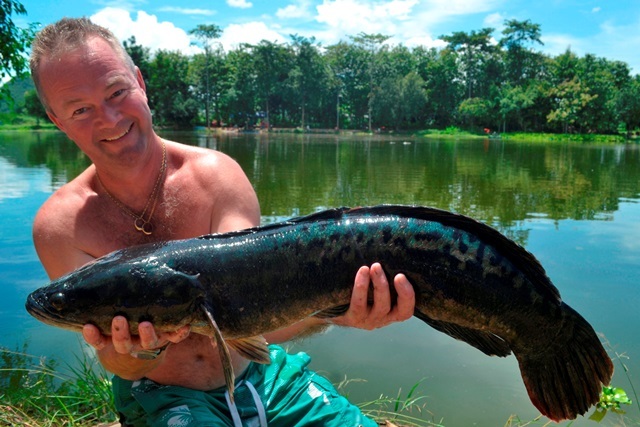 Gary Redhead seemed pleased with his catches of Amazon redtail, wallago attu, tambaqui and striped catfish. 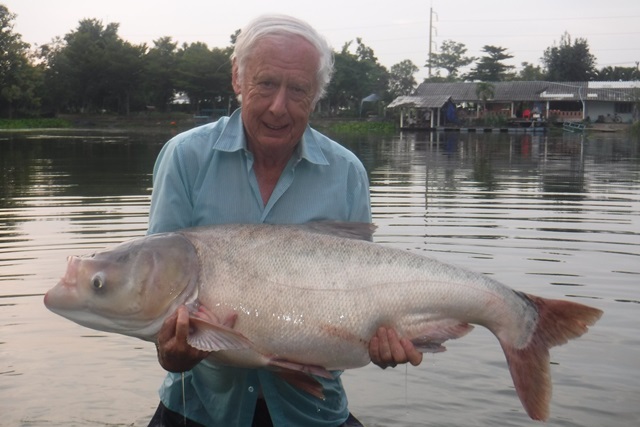 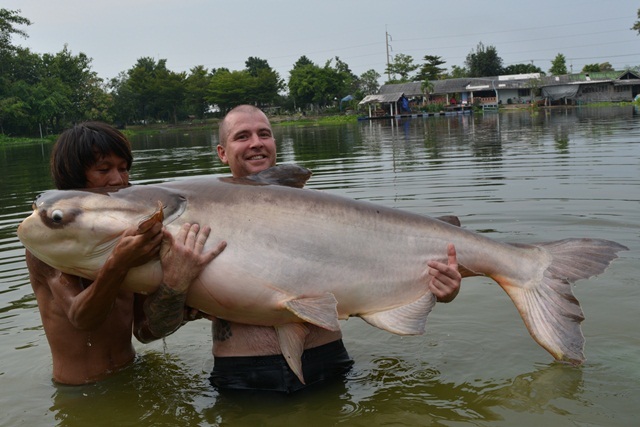 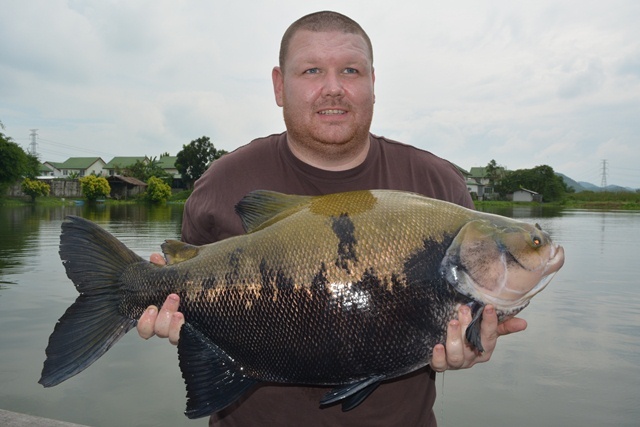 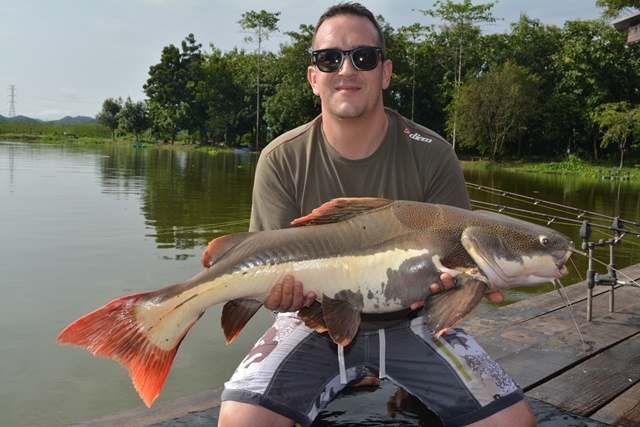 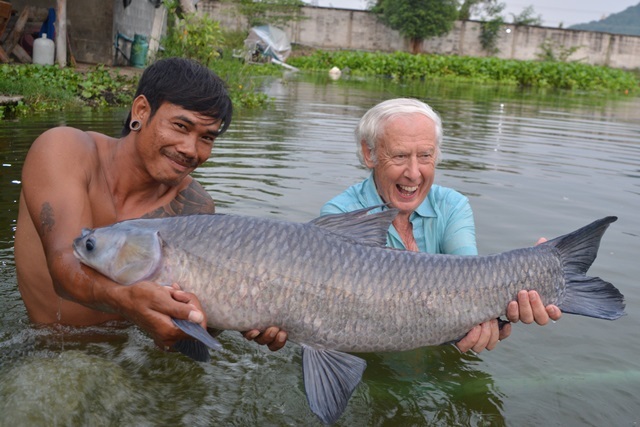 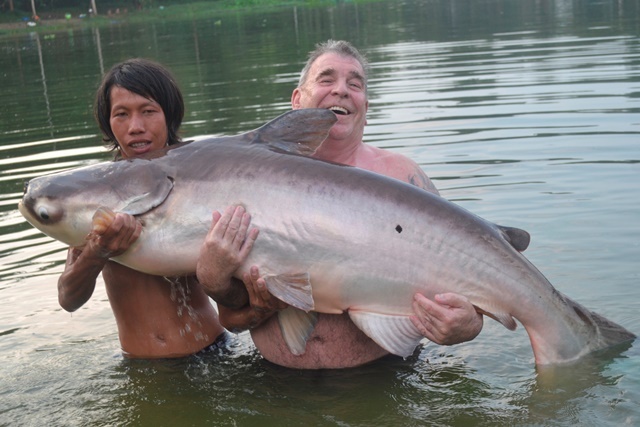 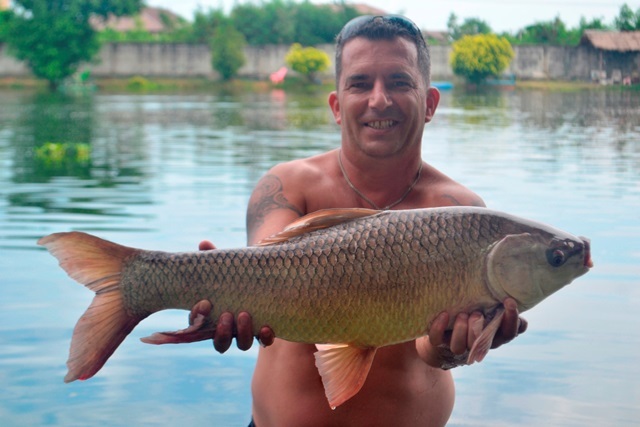 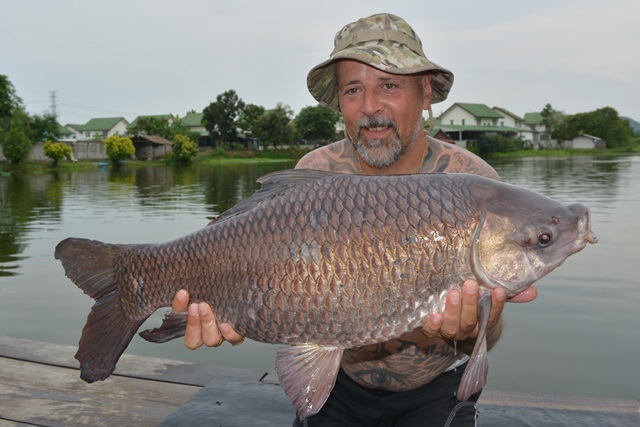 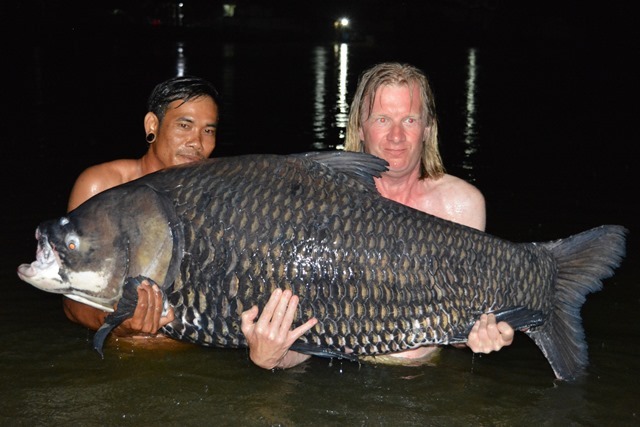 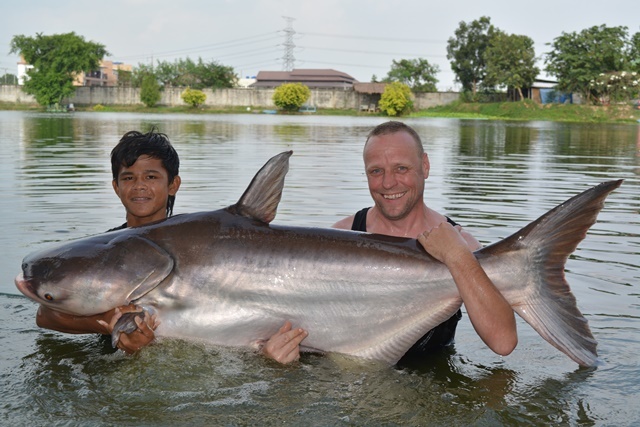 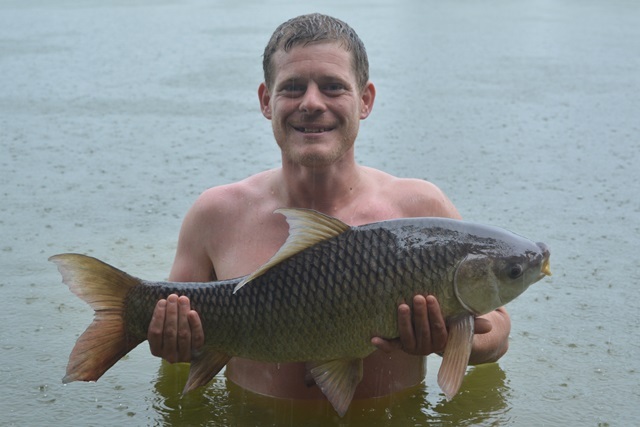 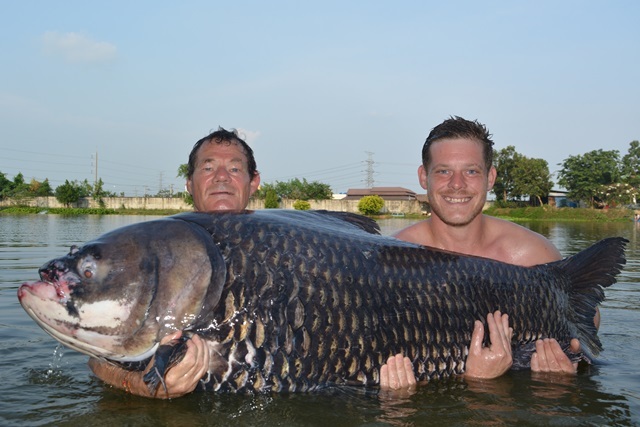 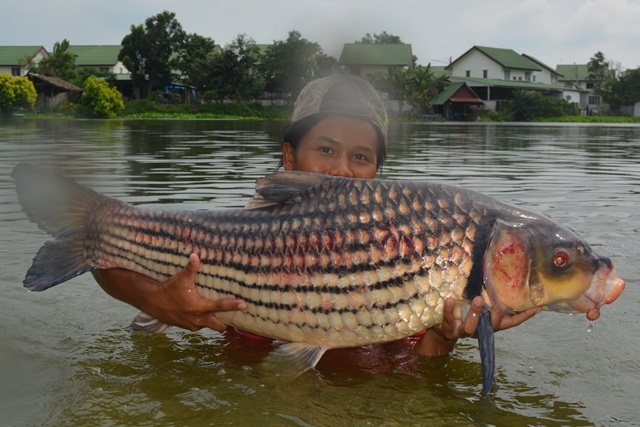 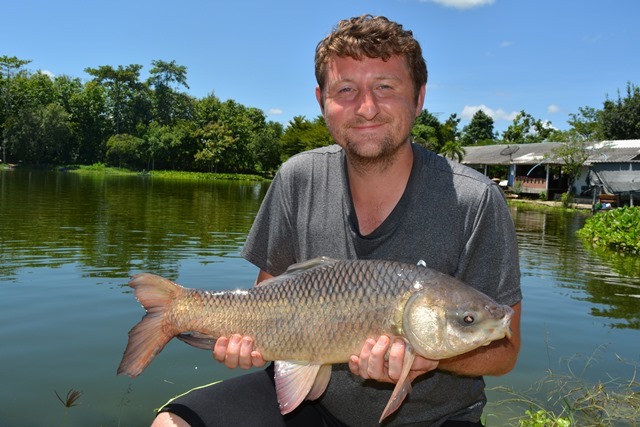 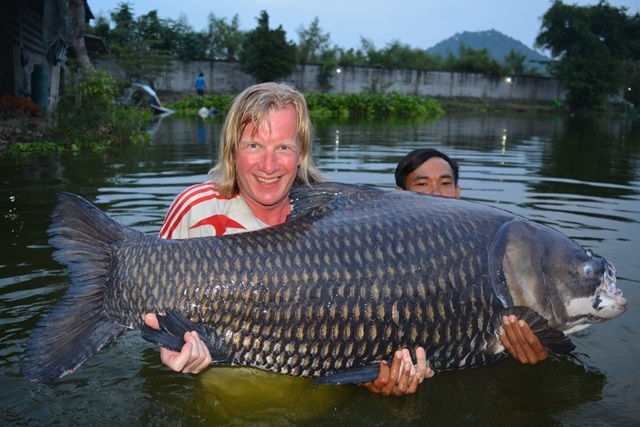 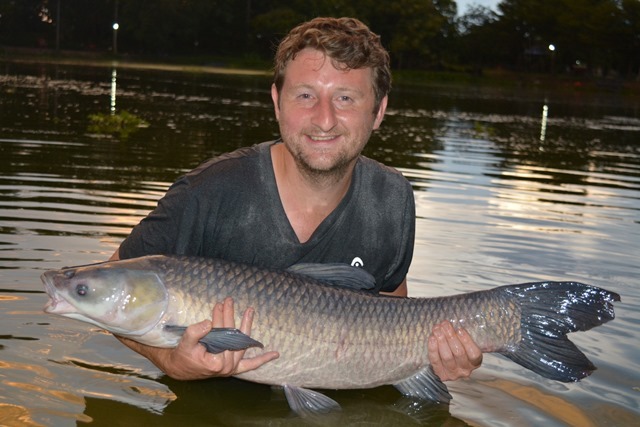 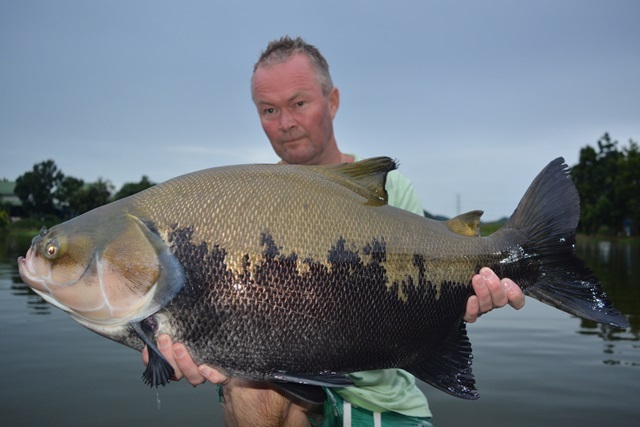 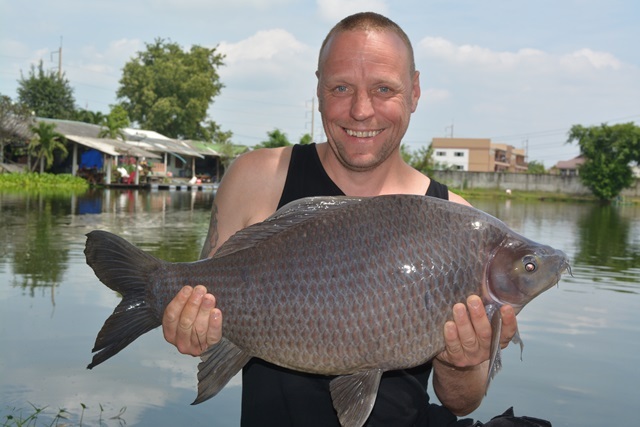 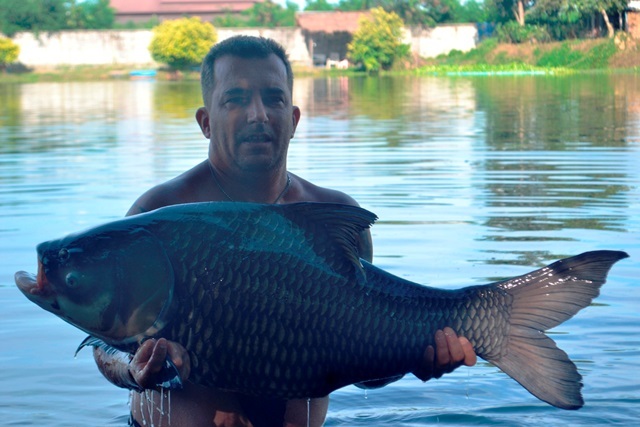 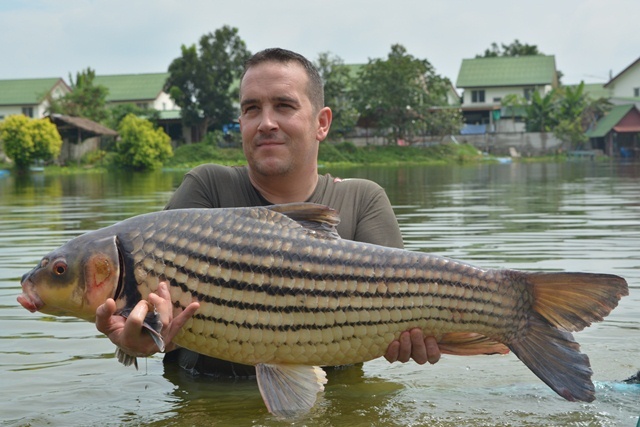 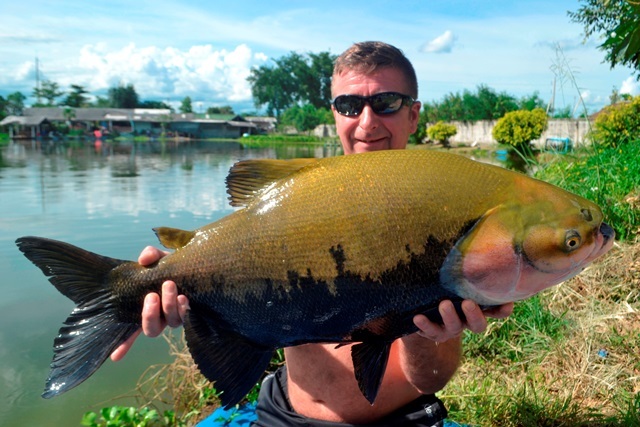 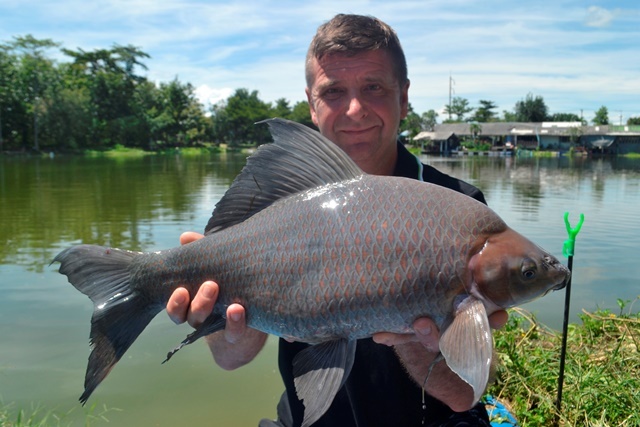 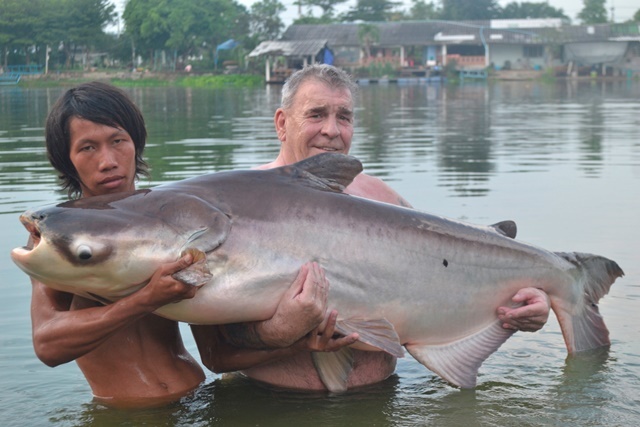 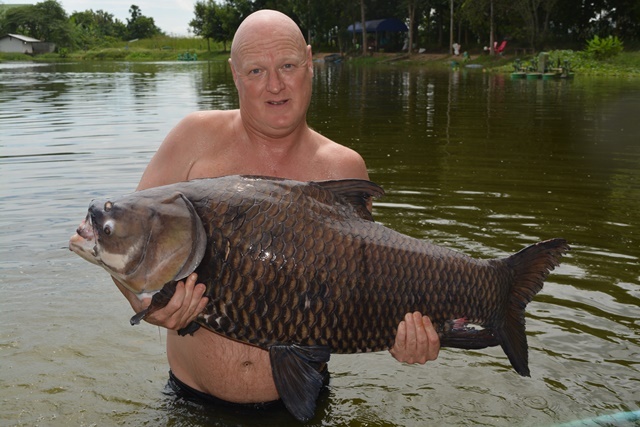 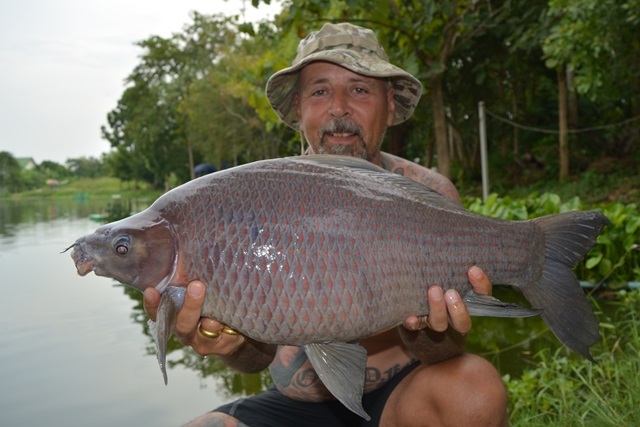 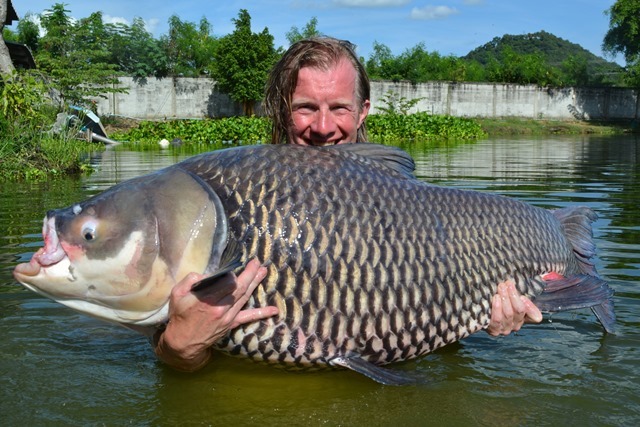 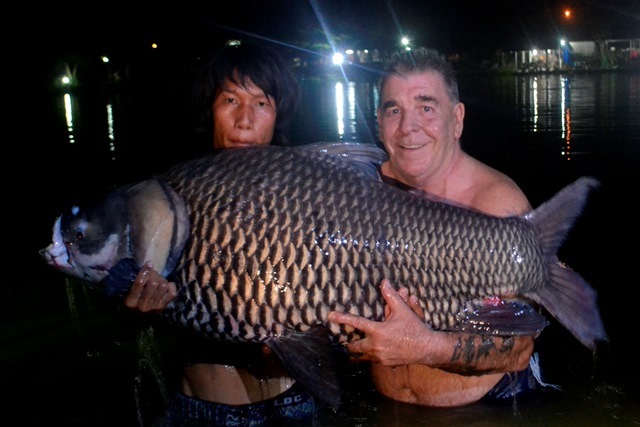 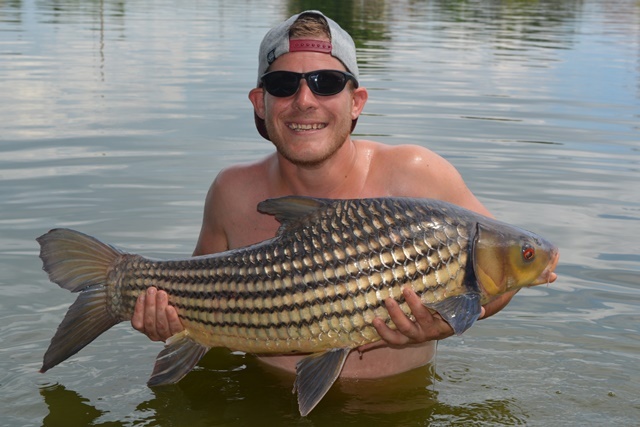 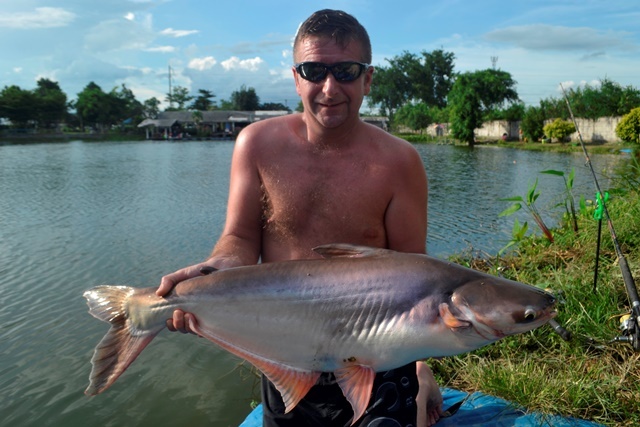 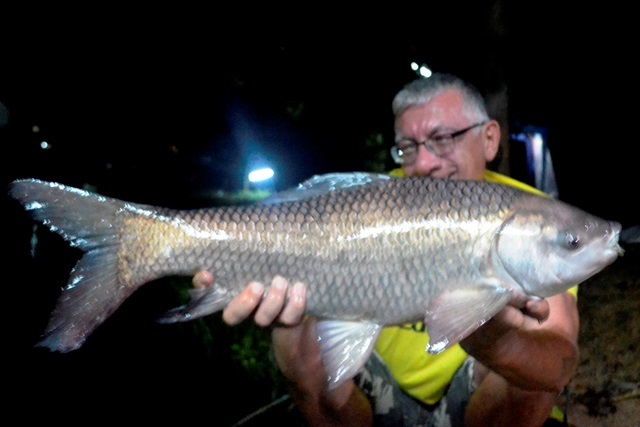 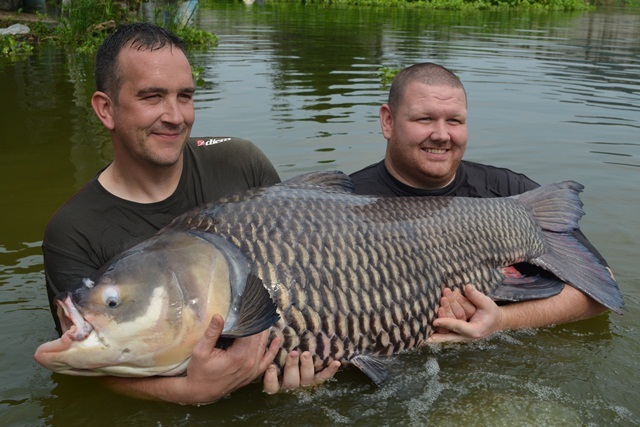 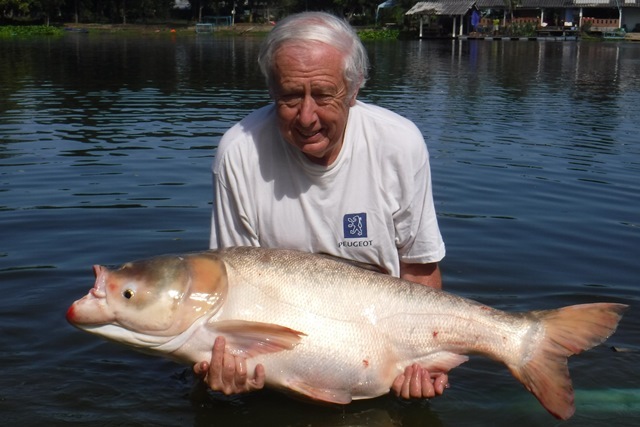 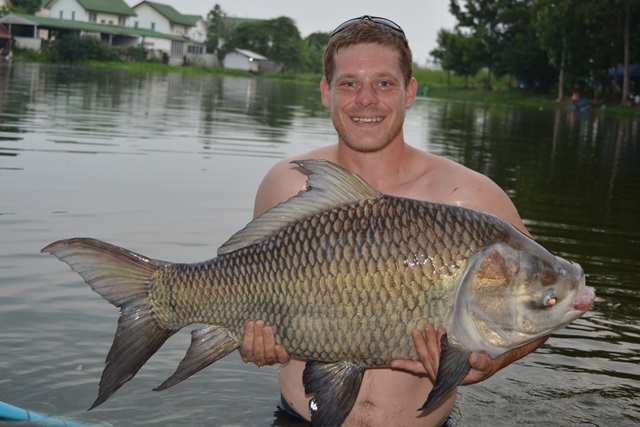 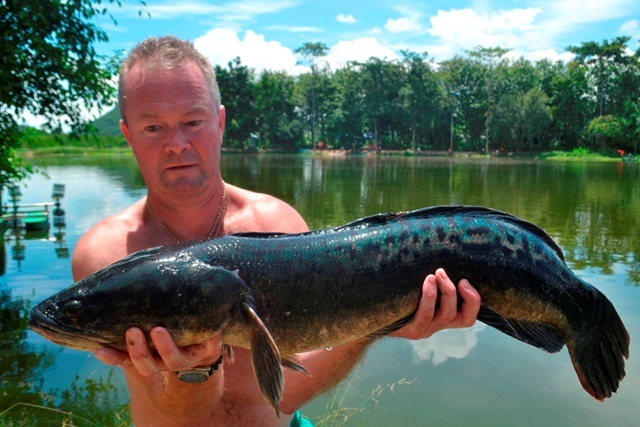 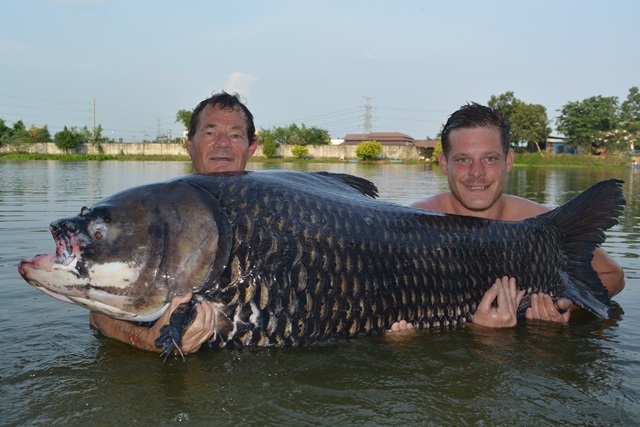 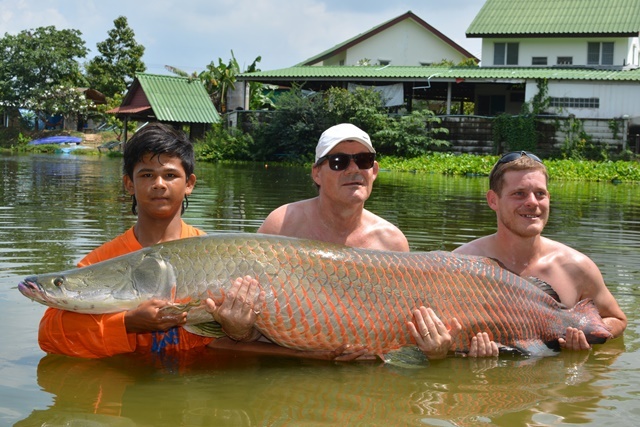 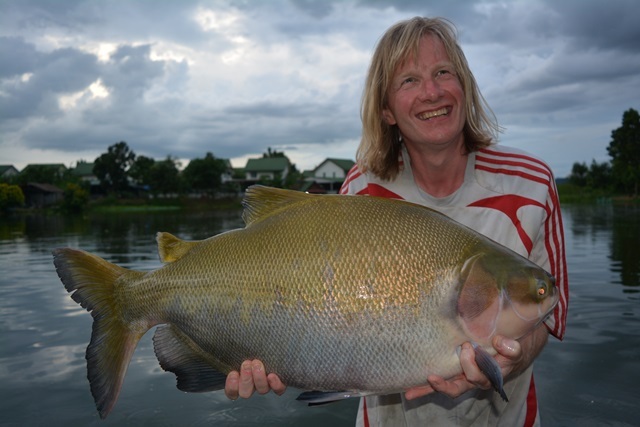 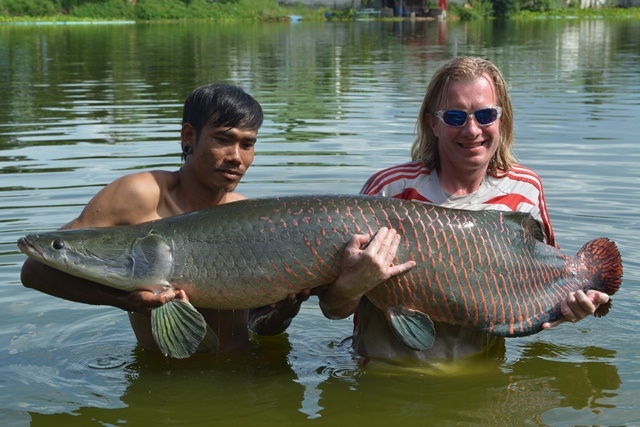 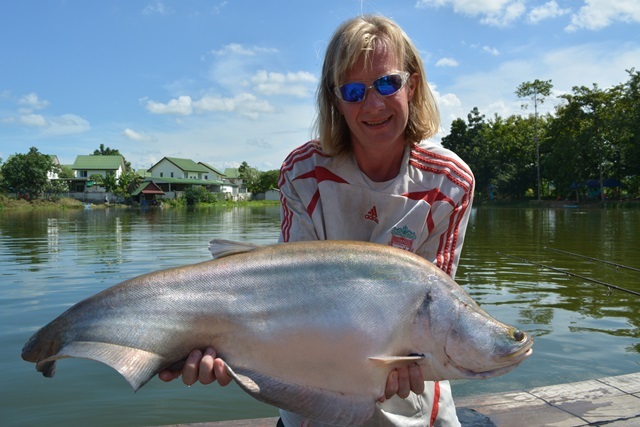 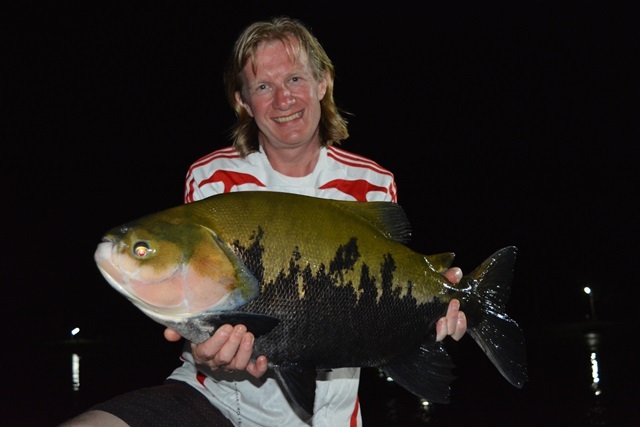 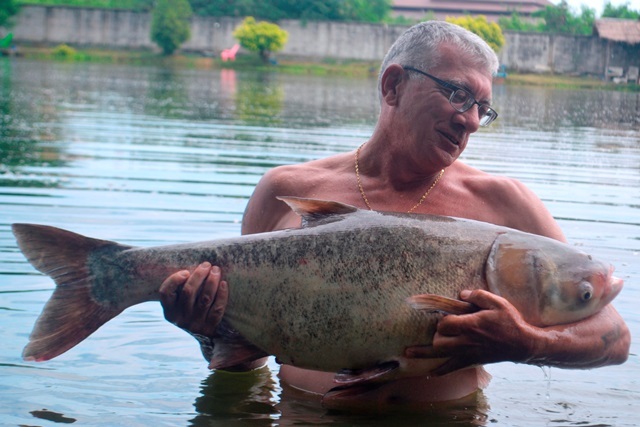 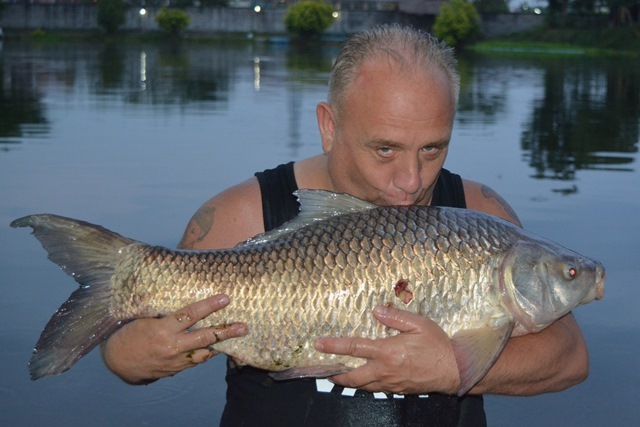 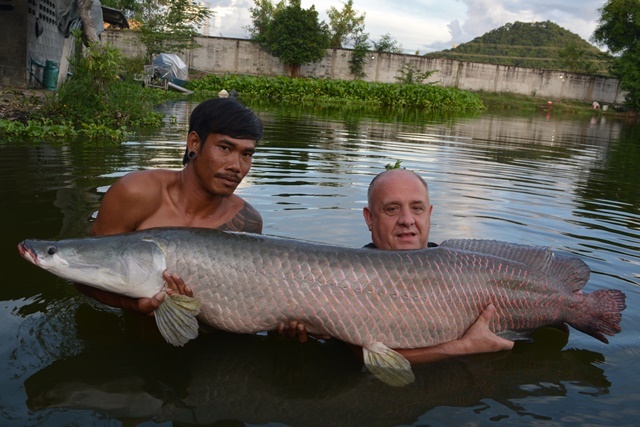 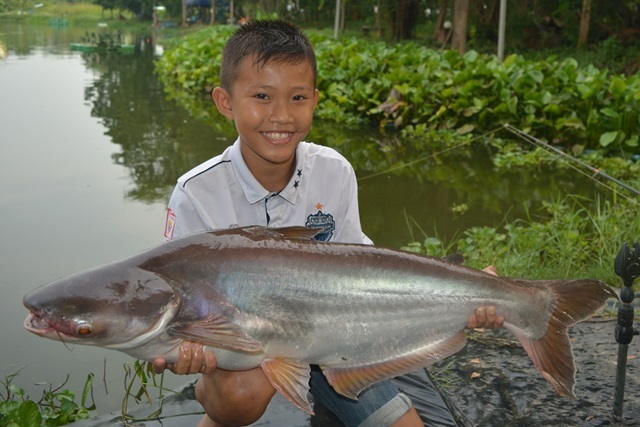 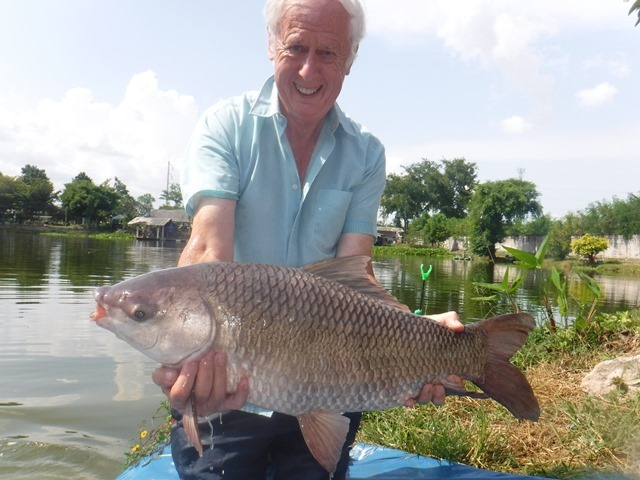 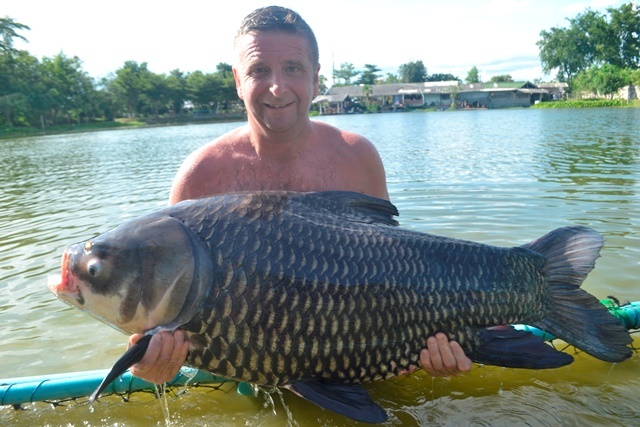 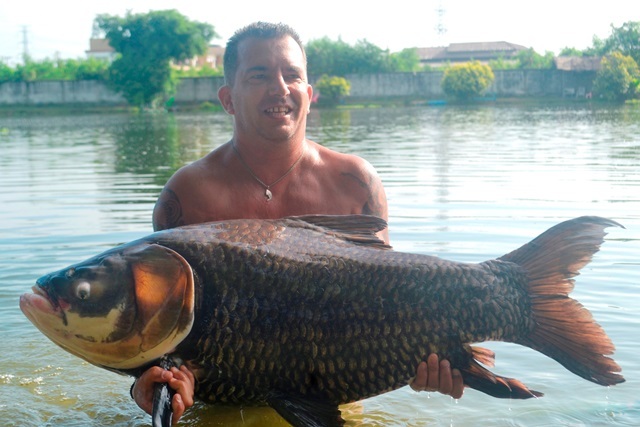 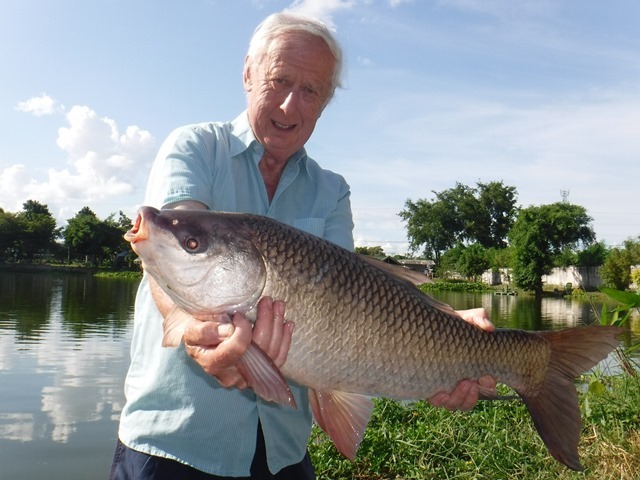 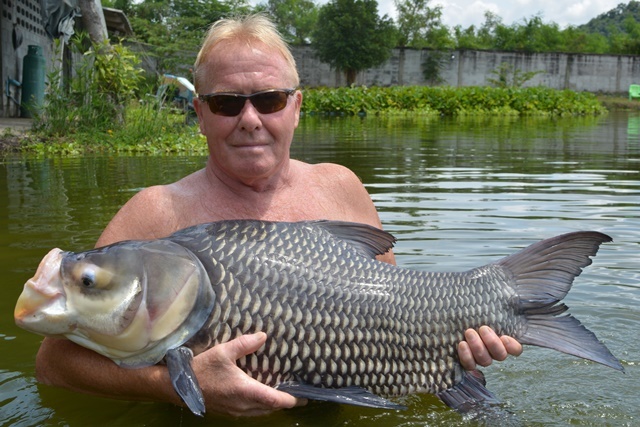 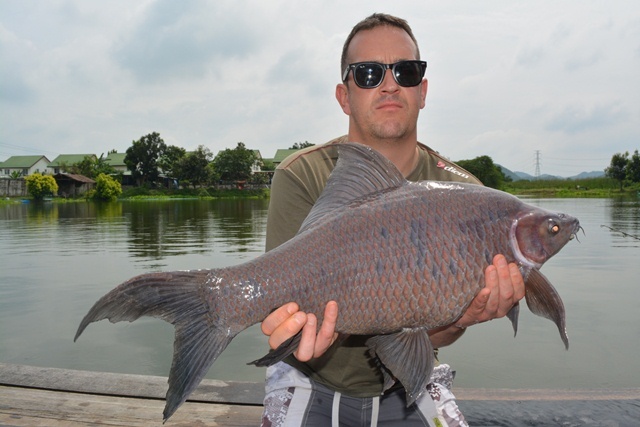 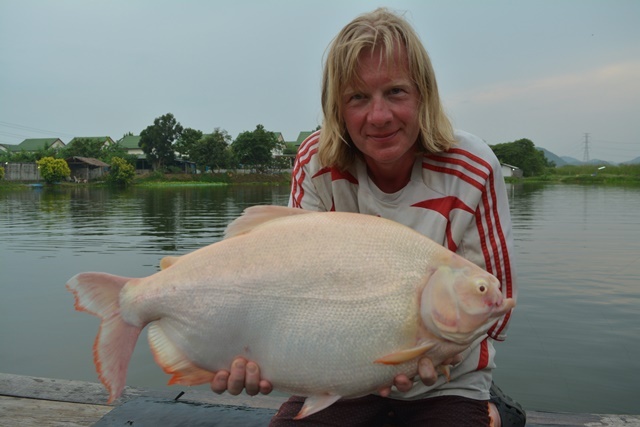 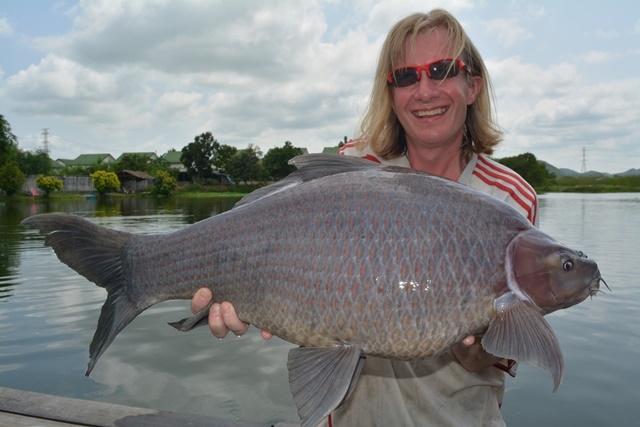 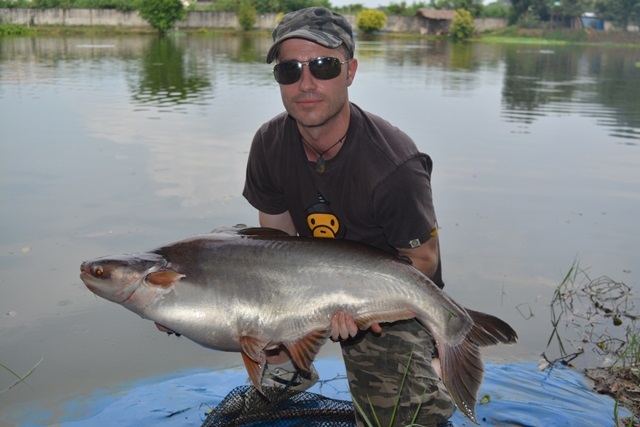 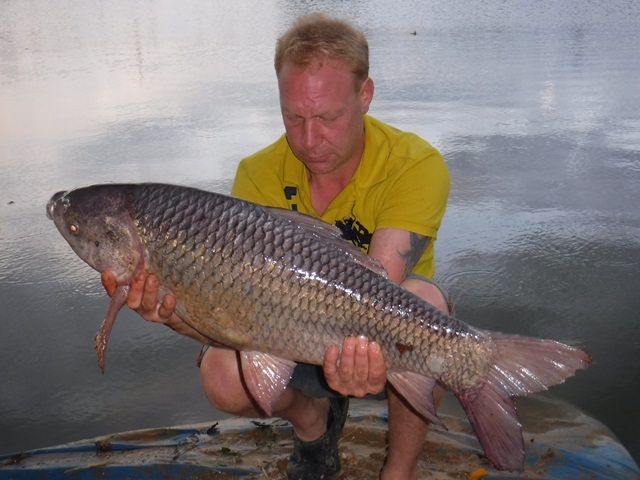 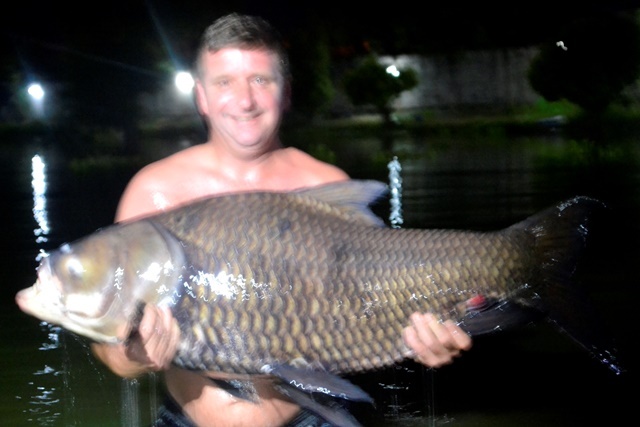 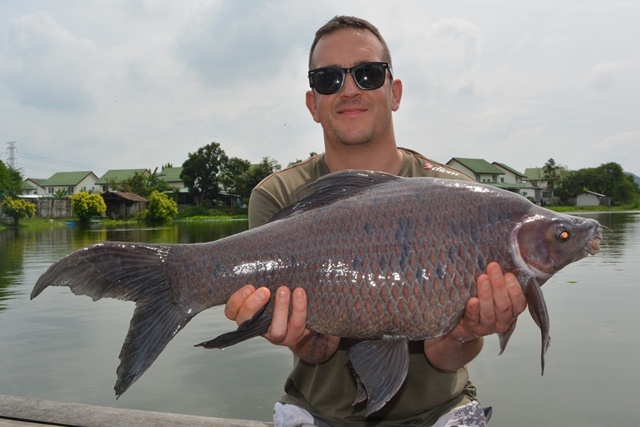 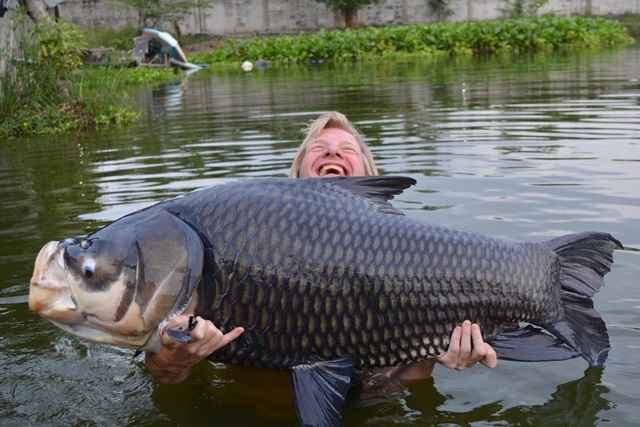 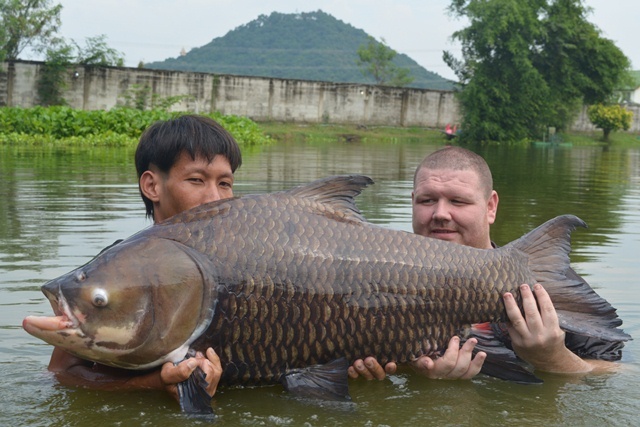 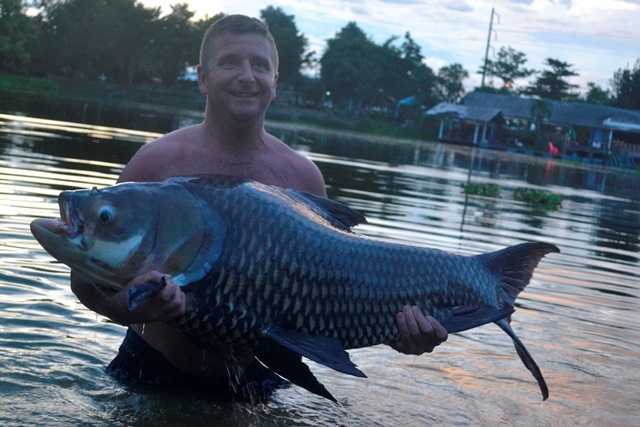 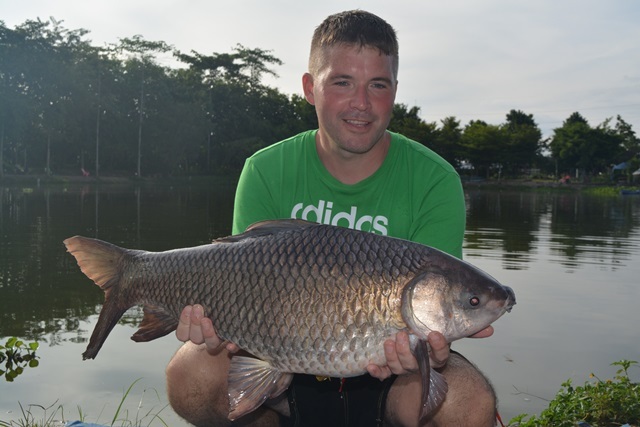 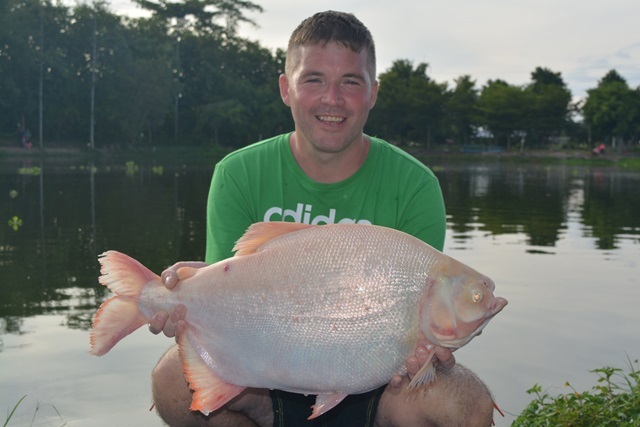 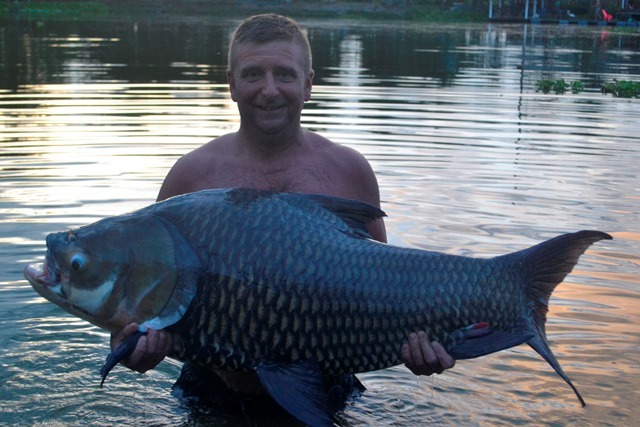 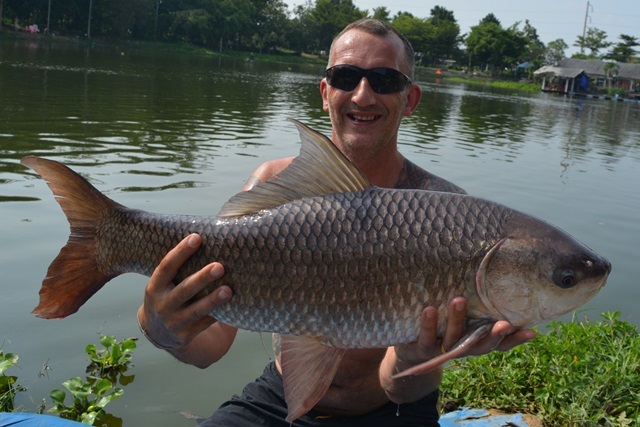 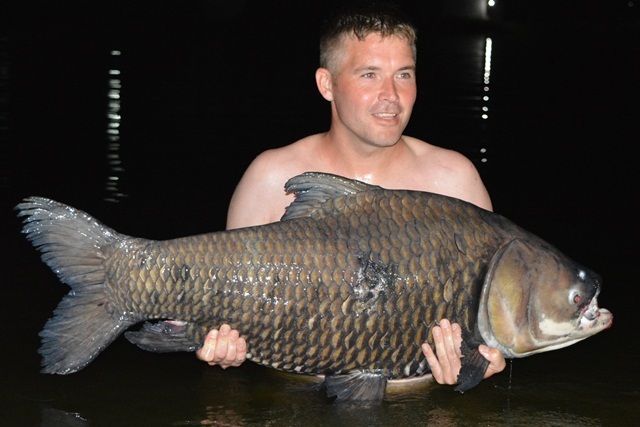 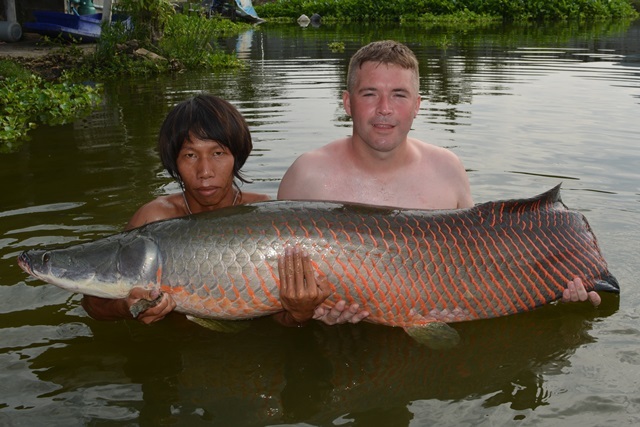 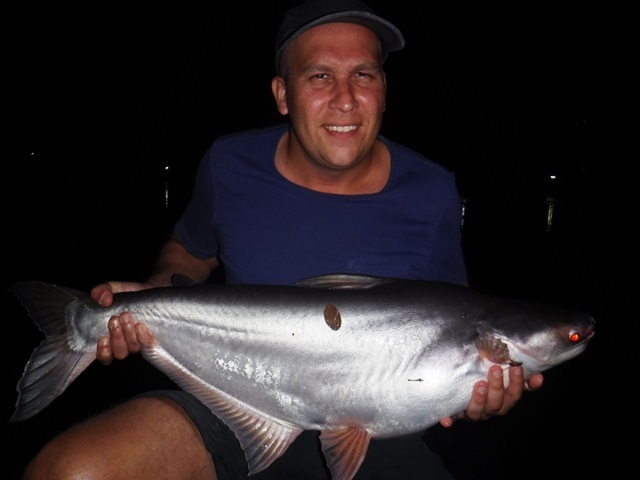 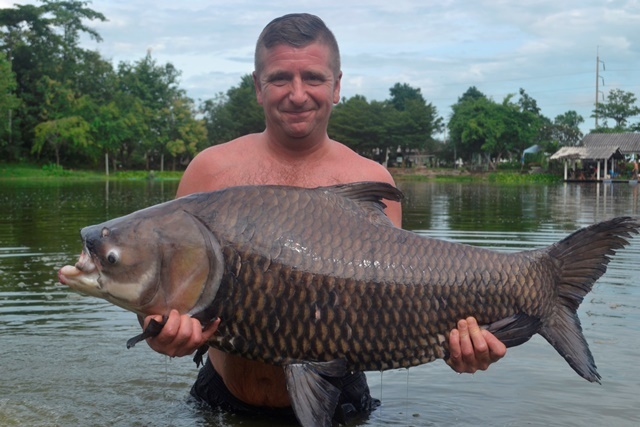 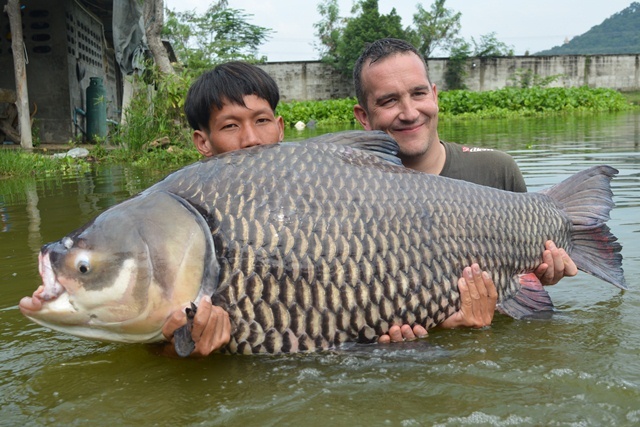 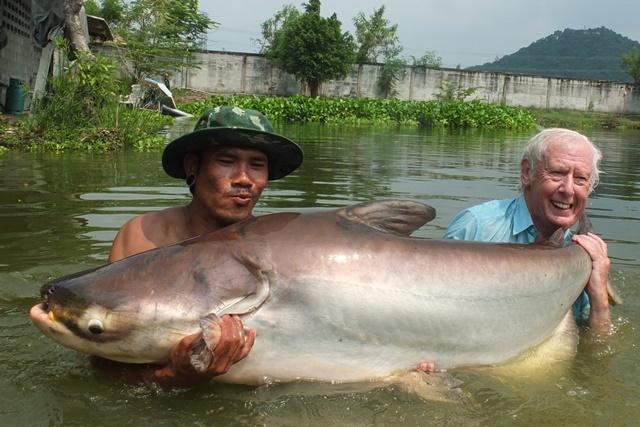 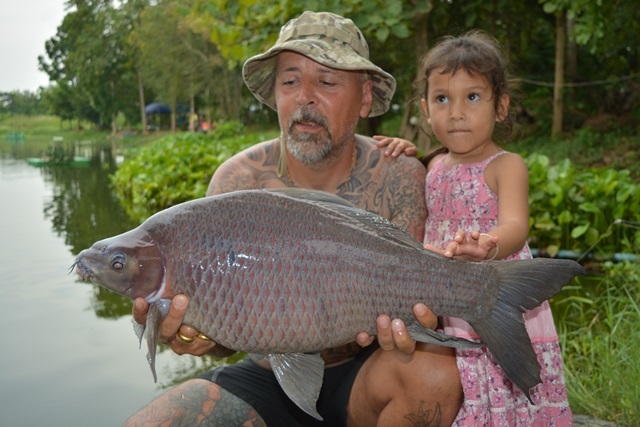 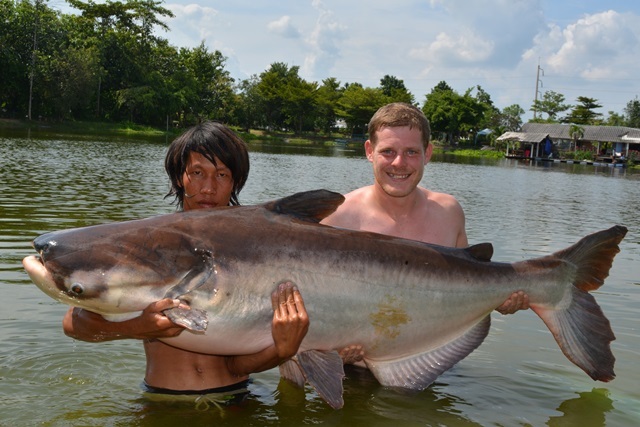 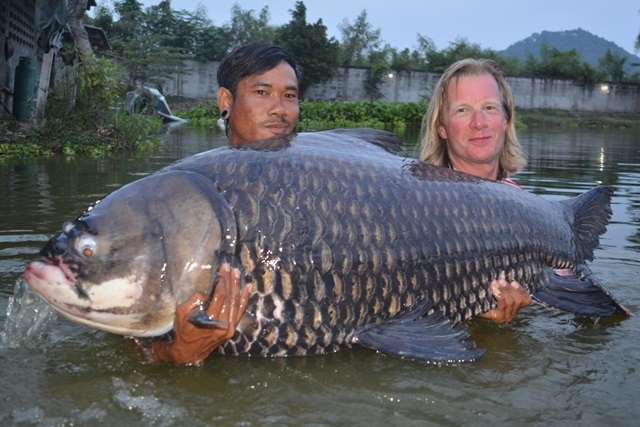 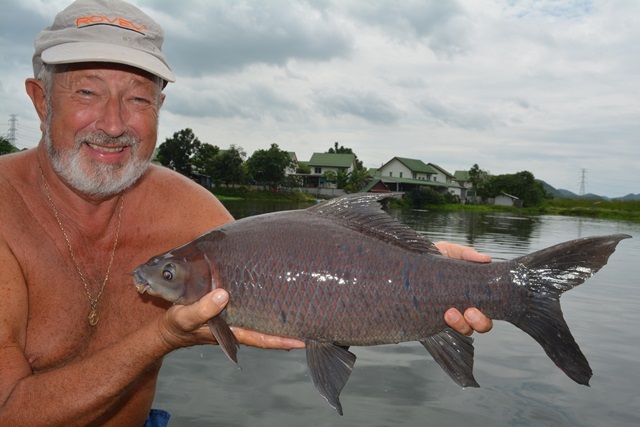 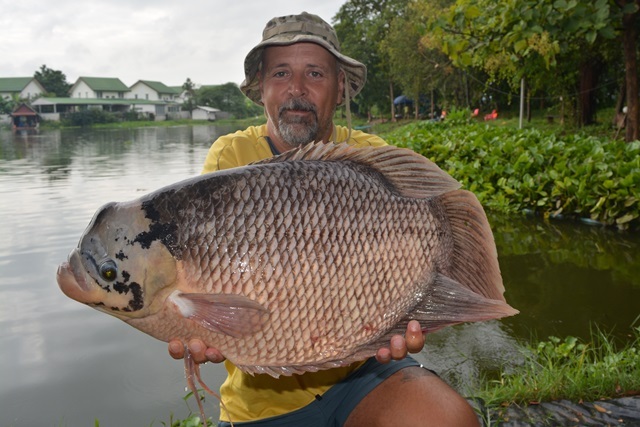 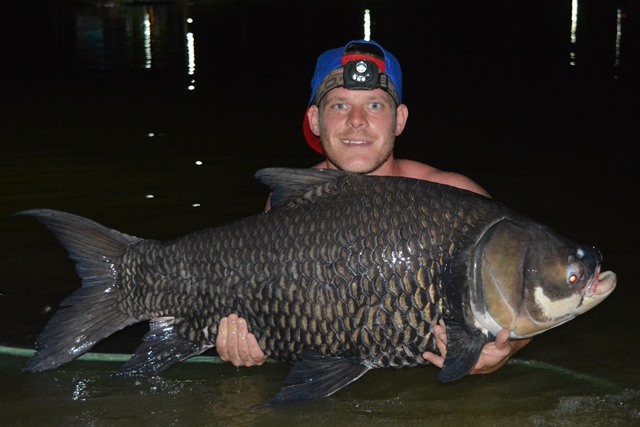 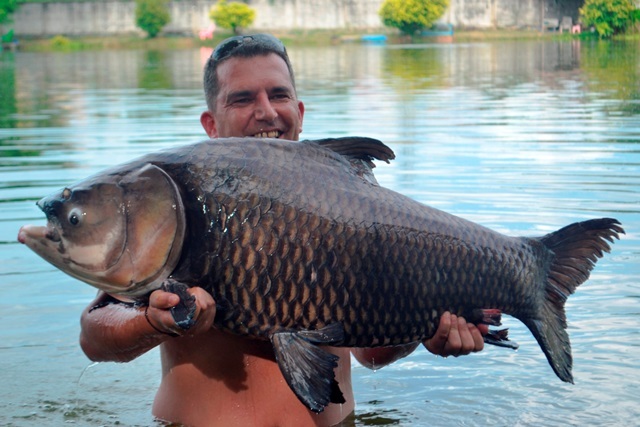 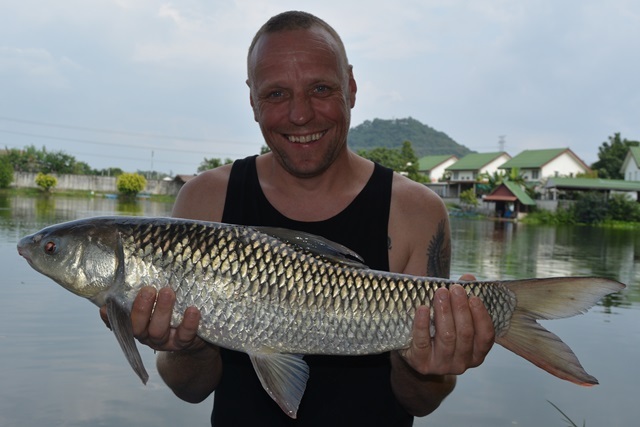 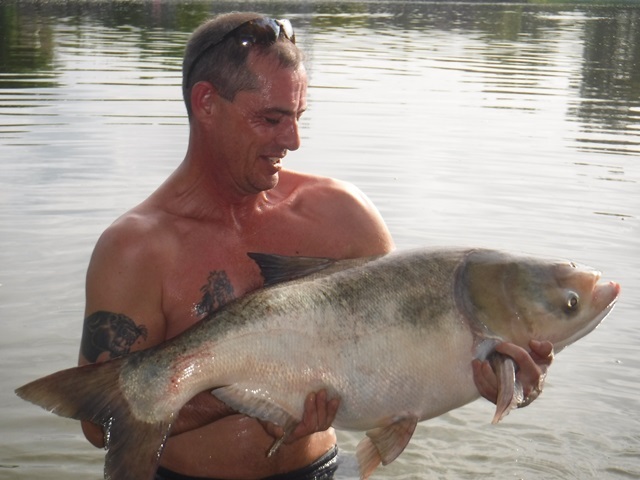 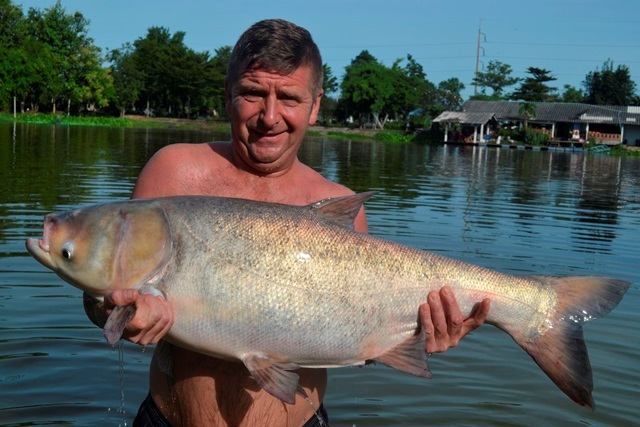 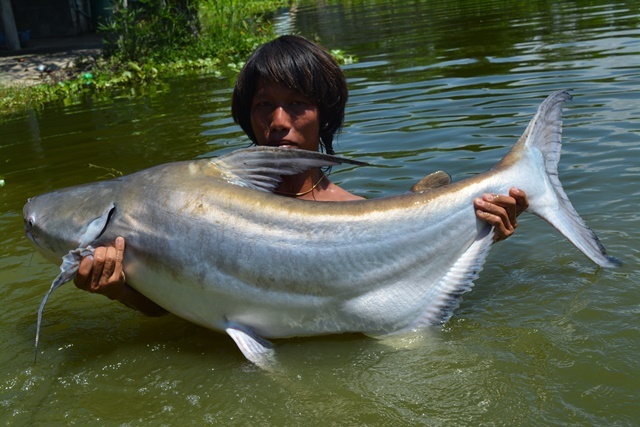 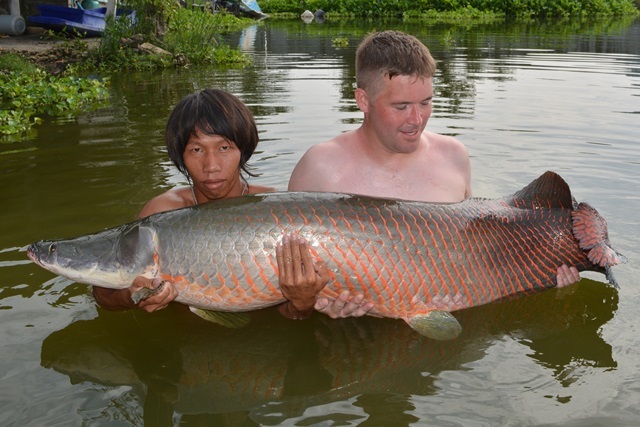 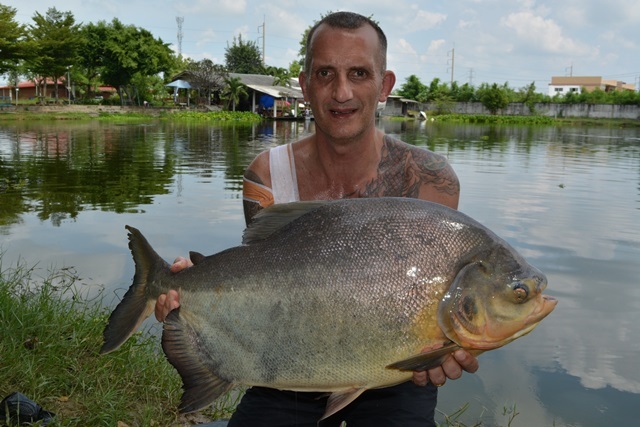 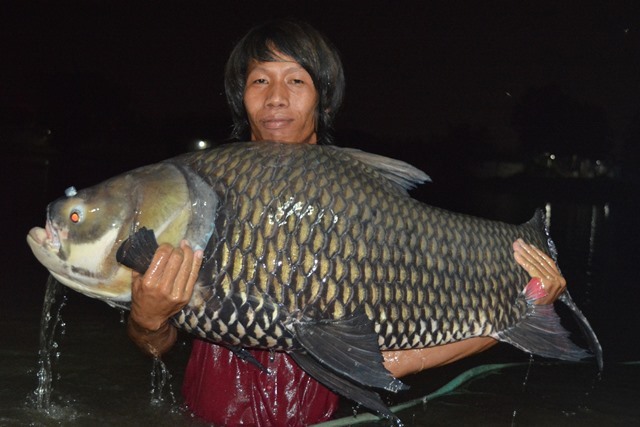 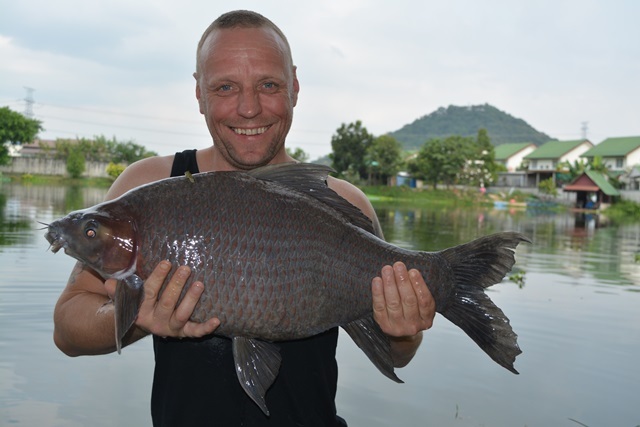 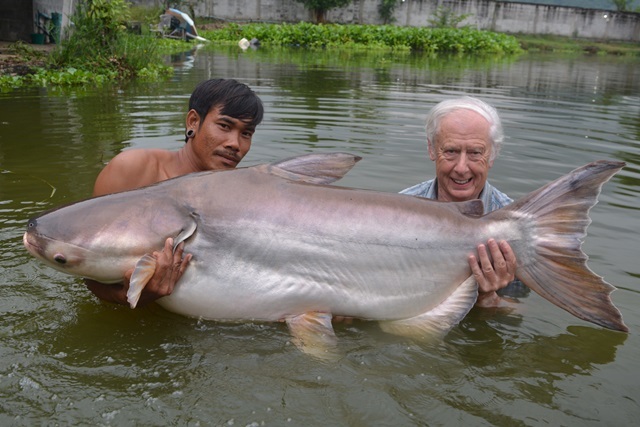 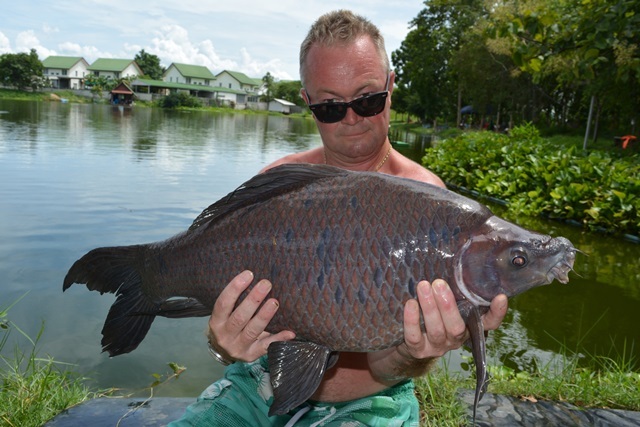 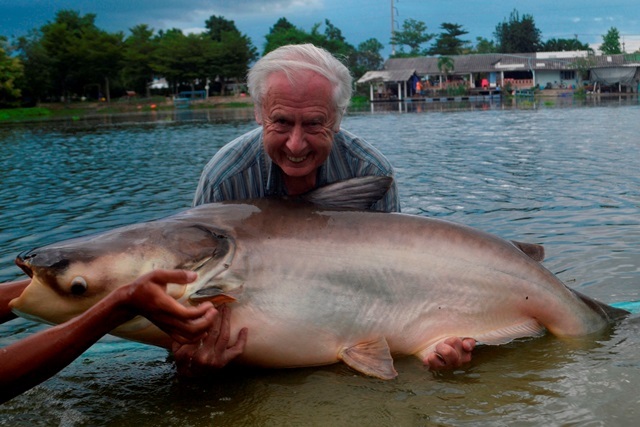 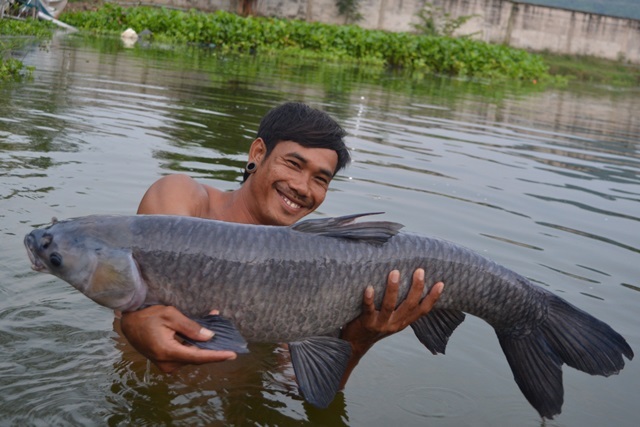 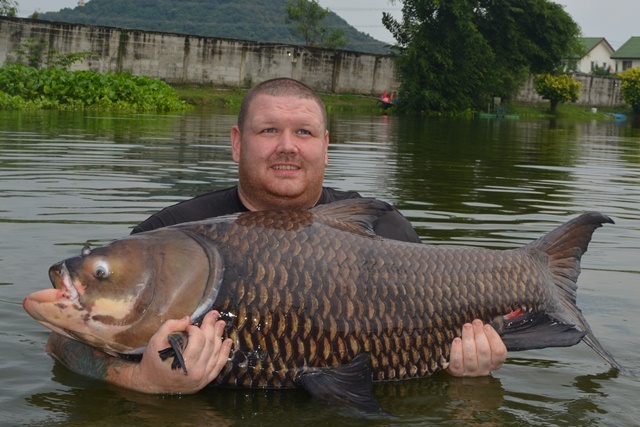 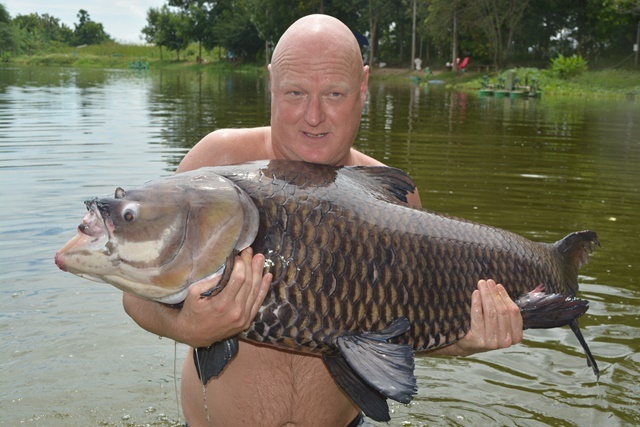 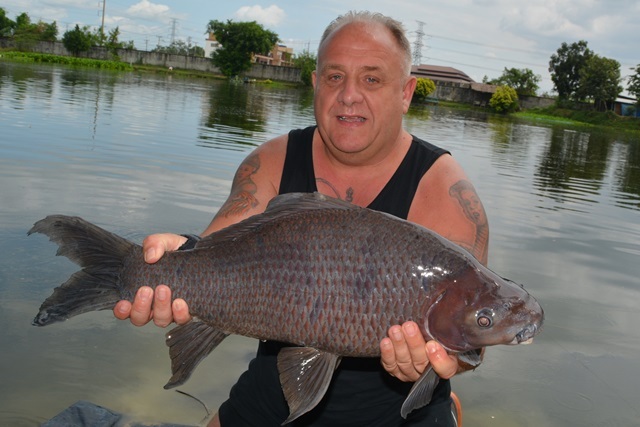 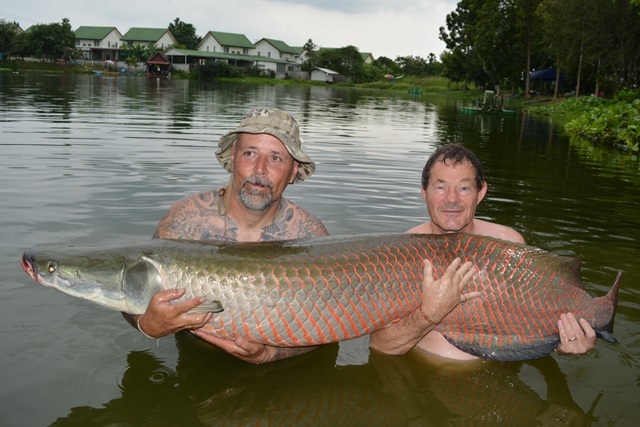 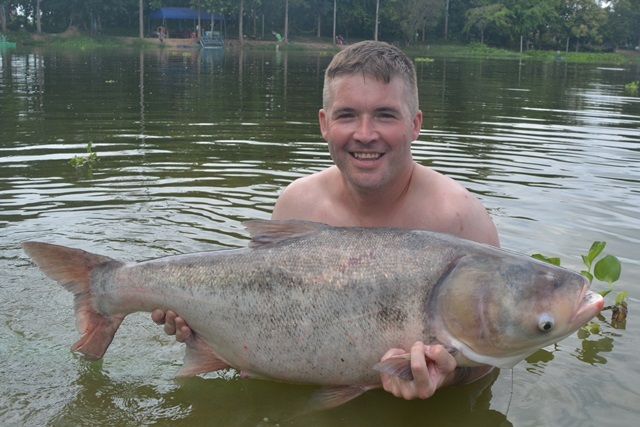 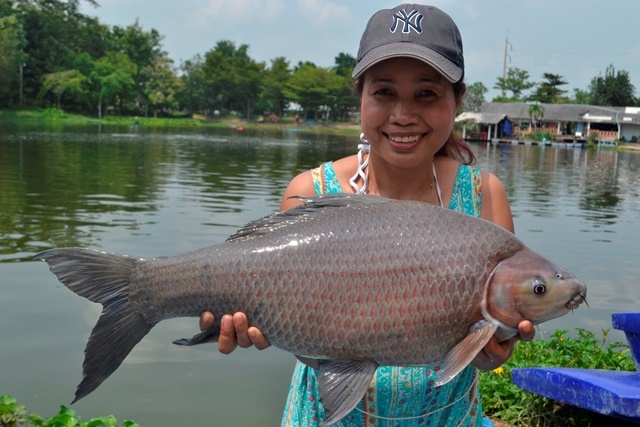 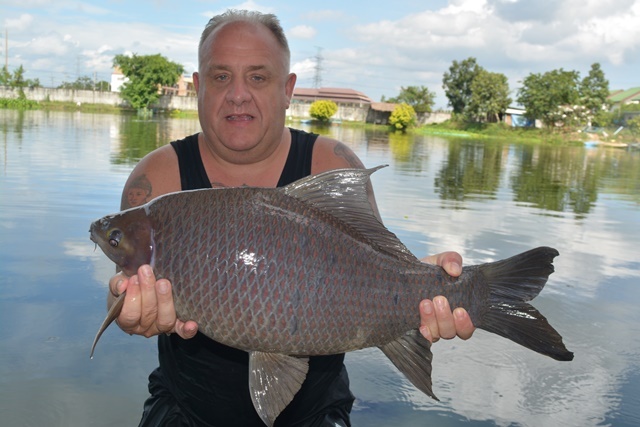 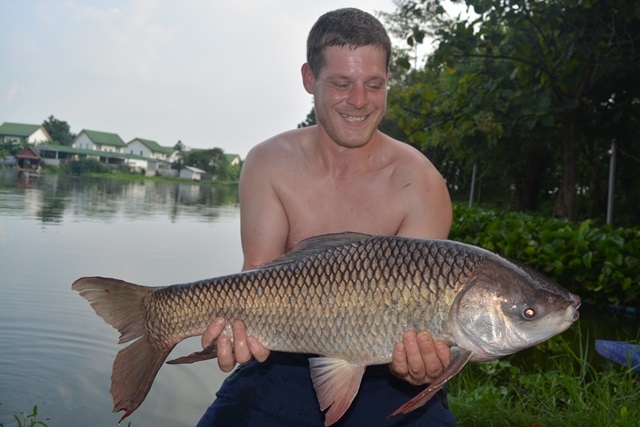 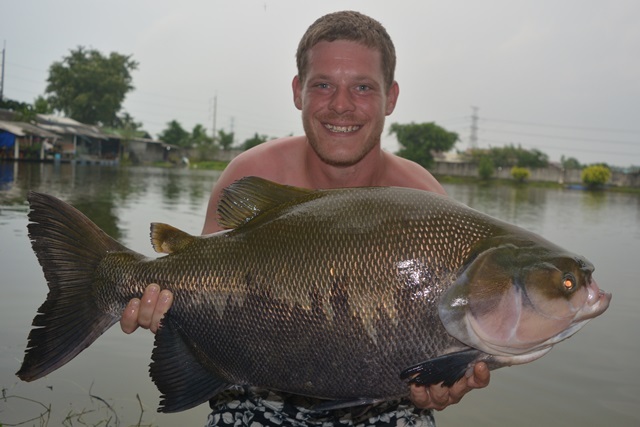 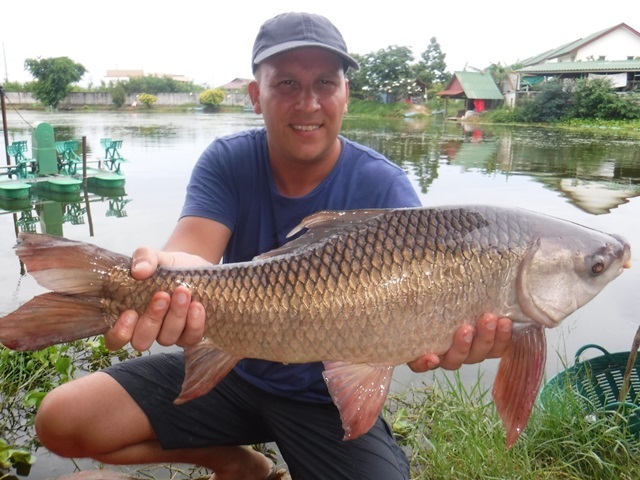 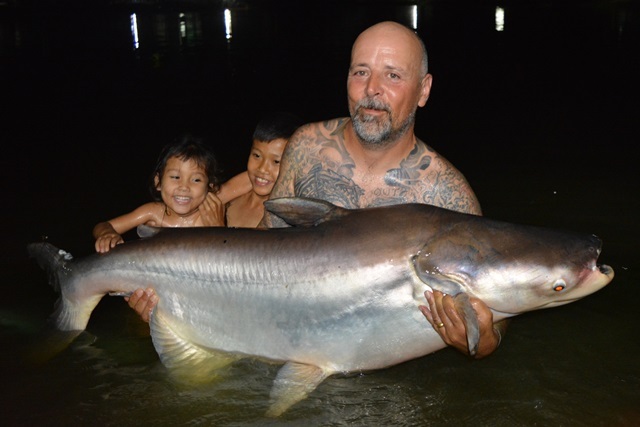 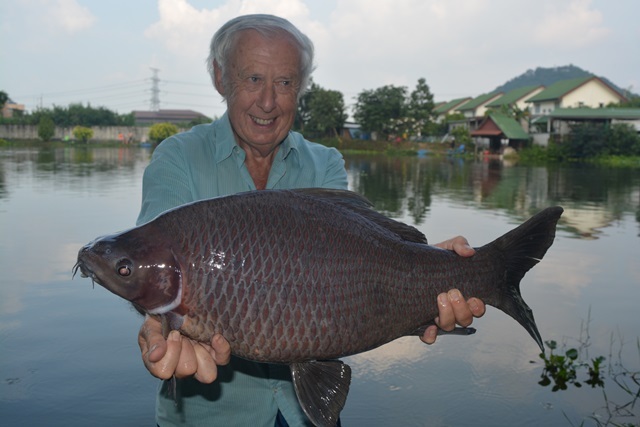 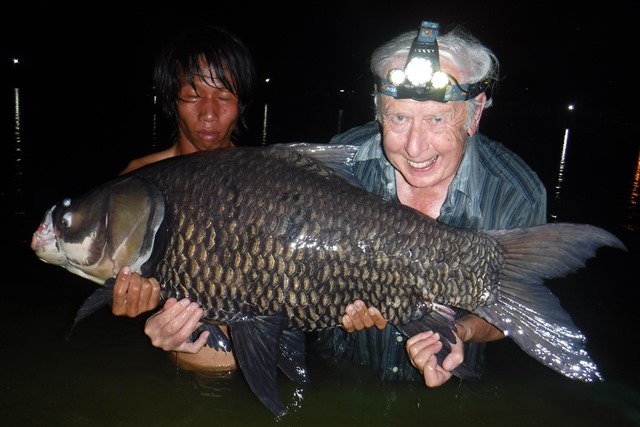 Ryan Williams and his mate caught Siamese carp as well as a rare Salween rita. 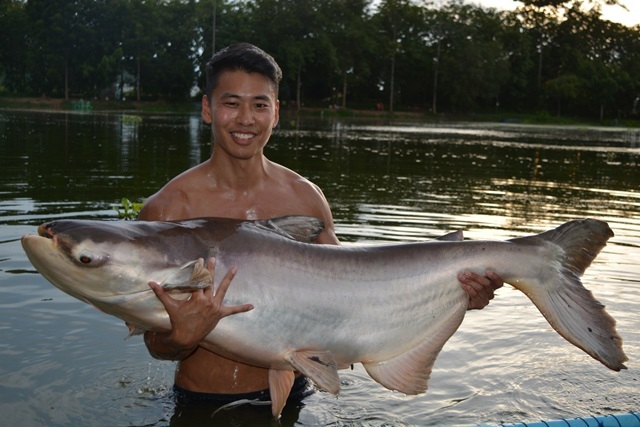 Another angler on his first visitor whose name escapes me caught some nice yellow catfish and Thai redtail before finishing off with a 100lb+ Siamese carp. 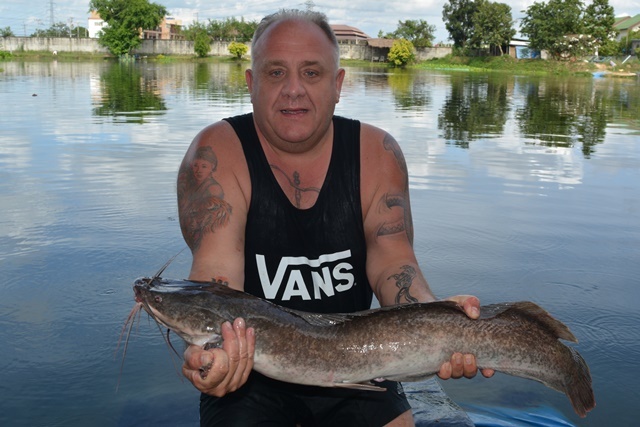 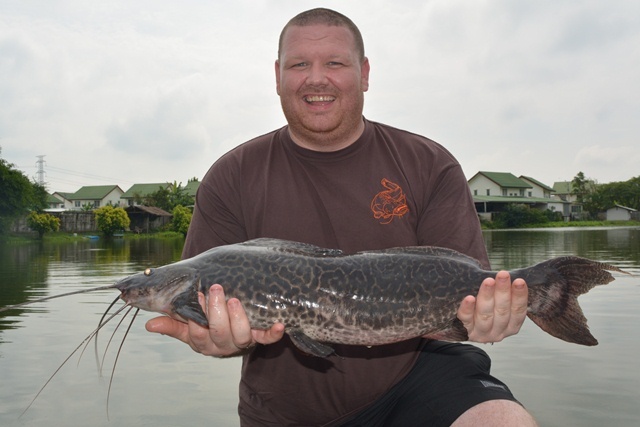 First time customer Ian White caught some nice Amazon redtails and striped catfish.